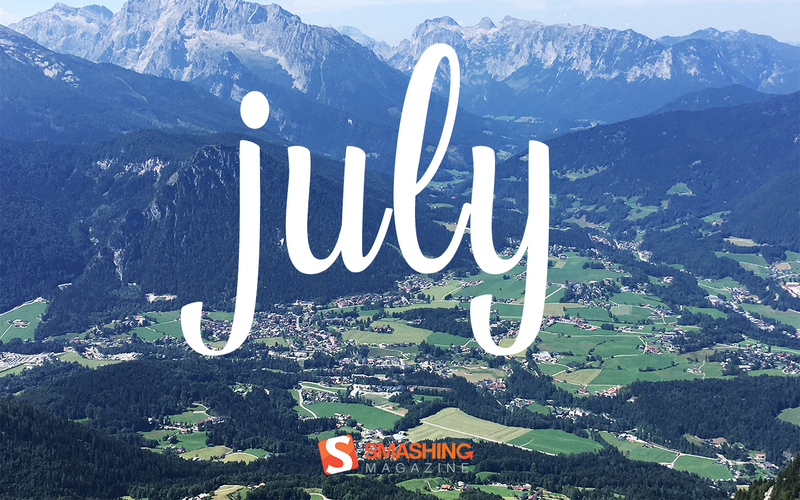 For most of us, July is the epitome of summer. 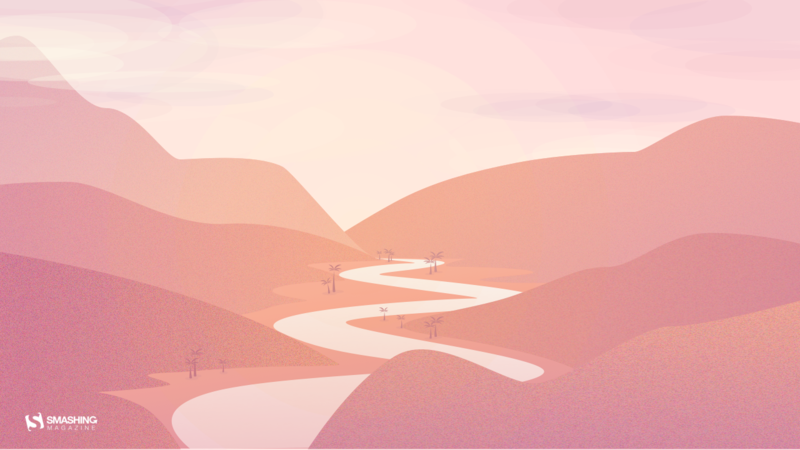 The time for spending every free minute outside to enjoy the sun and those seemingly endless summer days, be it in a nearby park, by a lake, or on a road trip, exploring unfamiliar places. 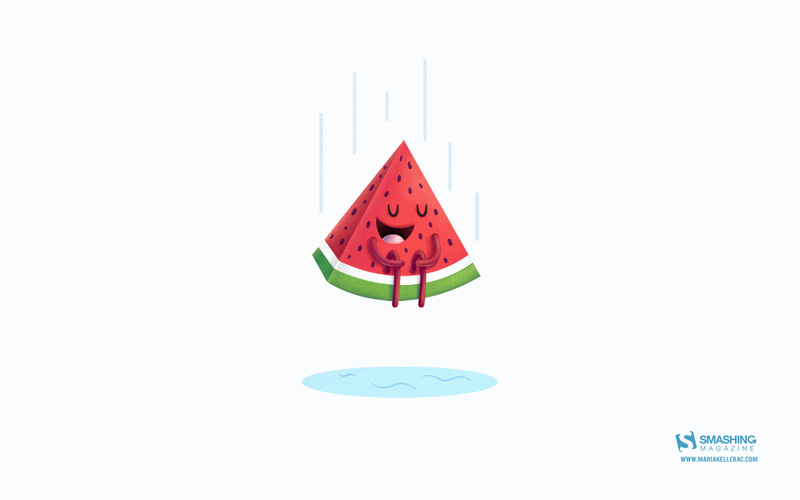 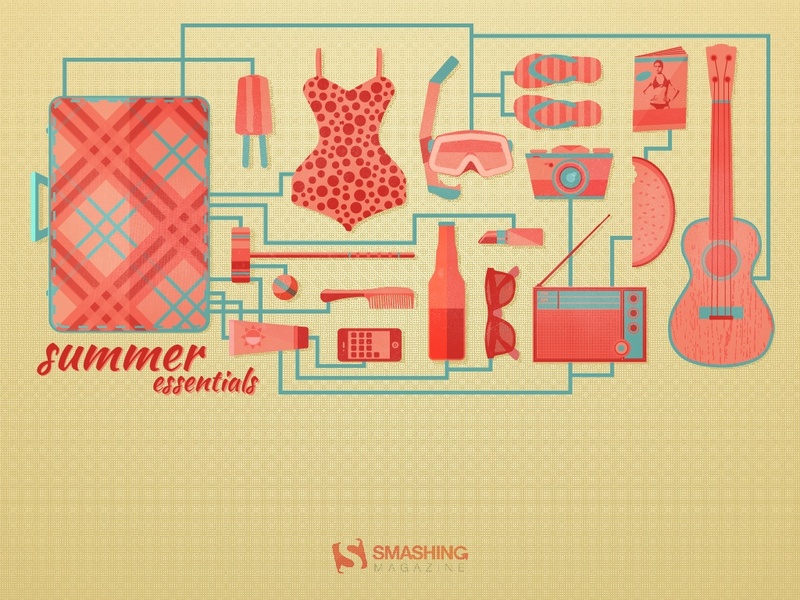 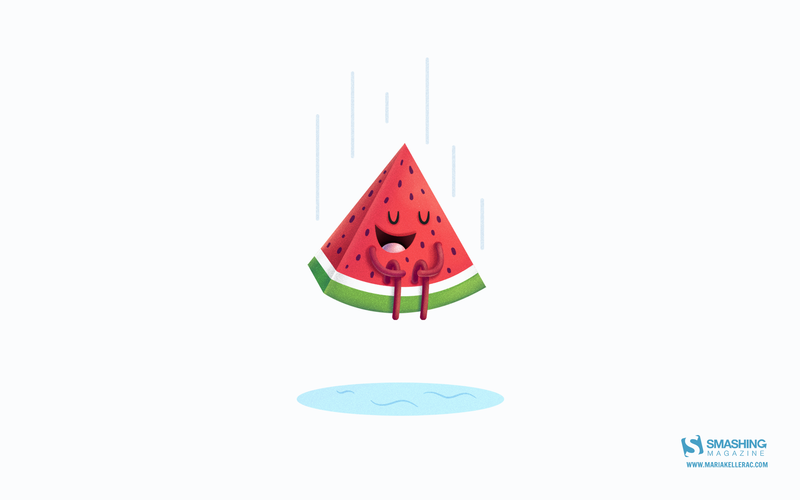 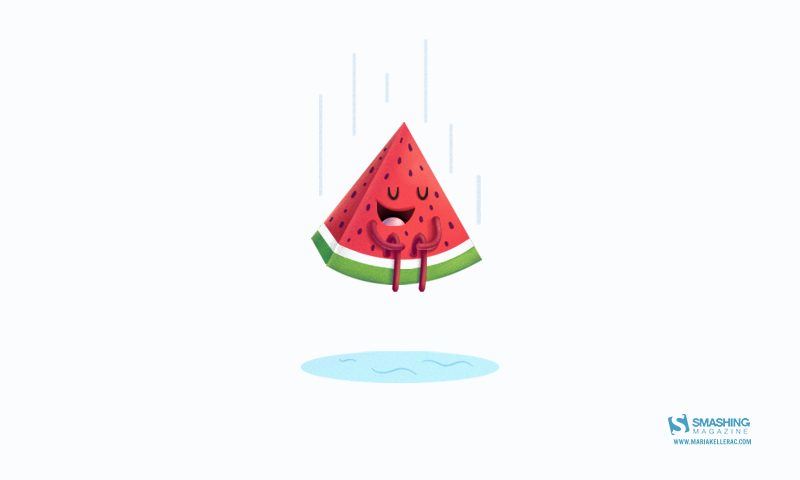 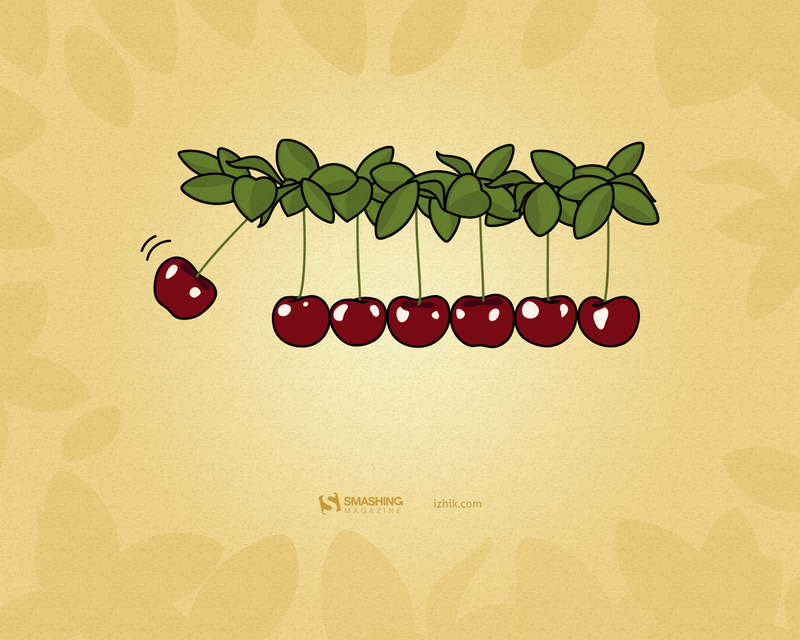 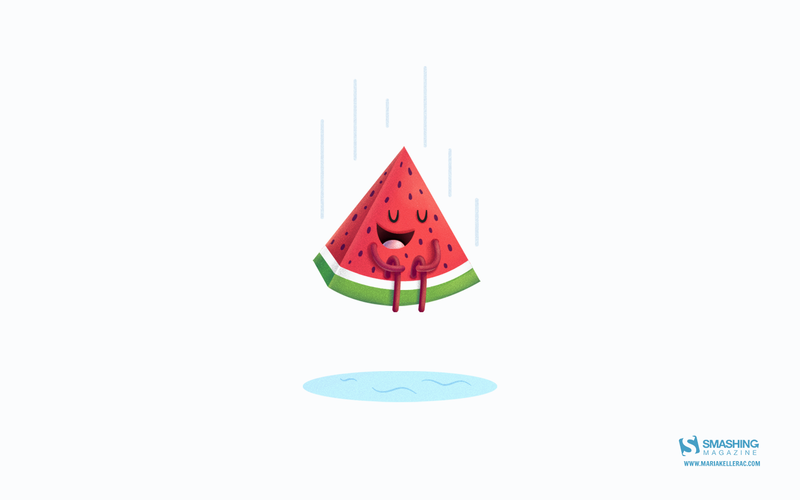 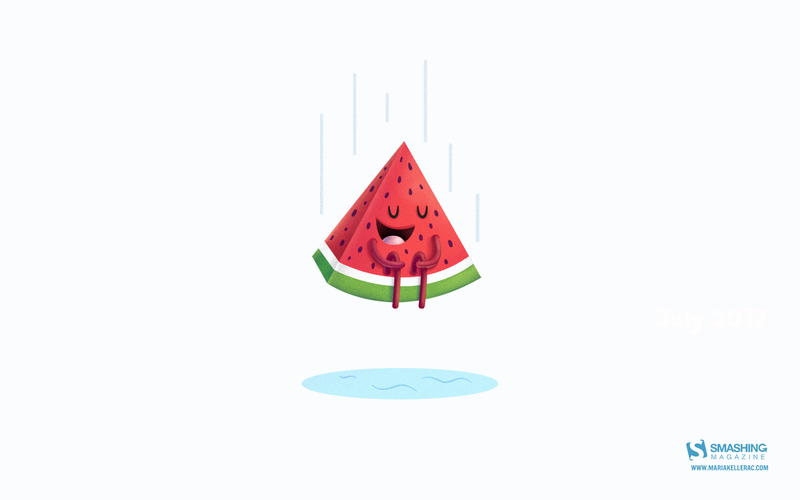 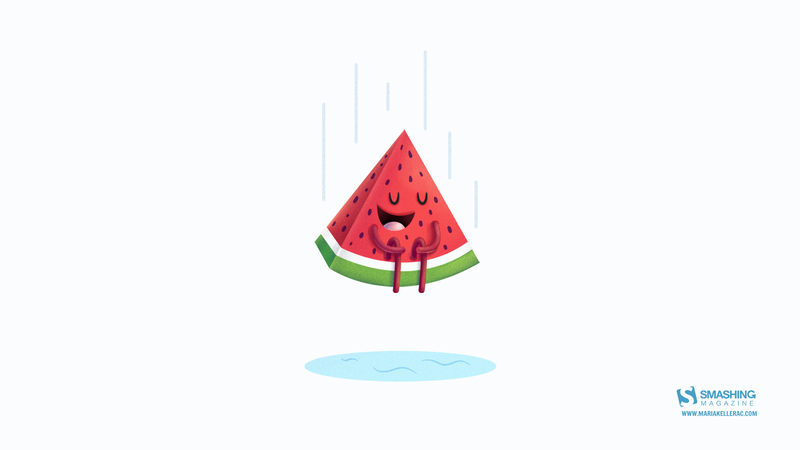 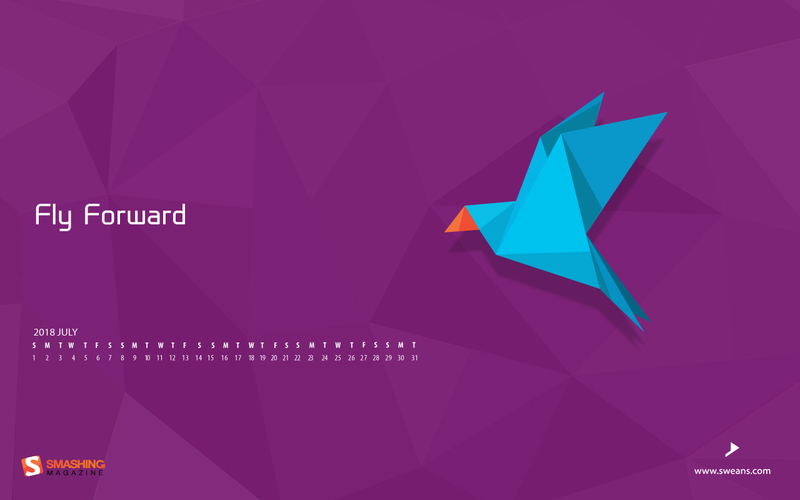 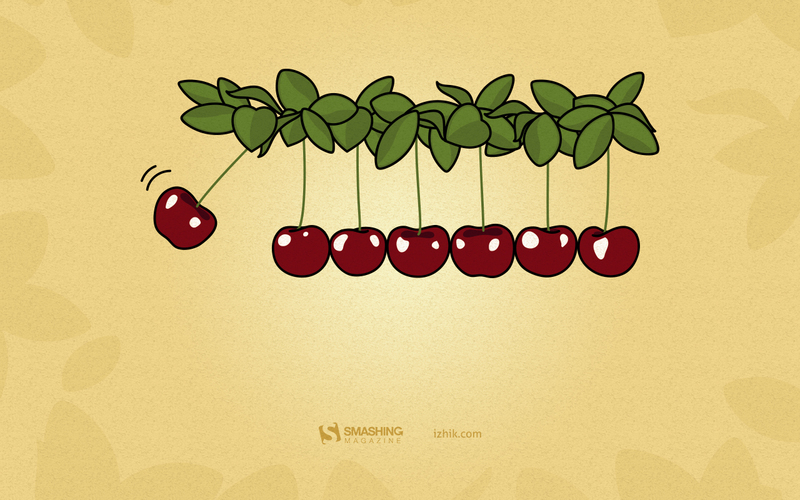 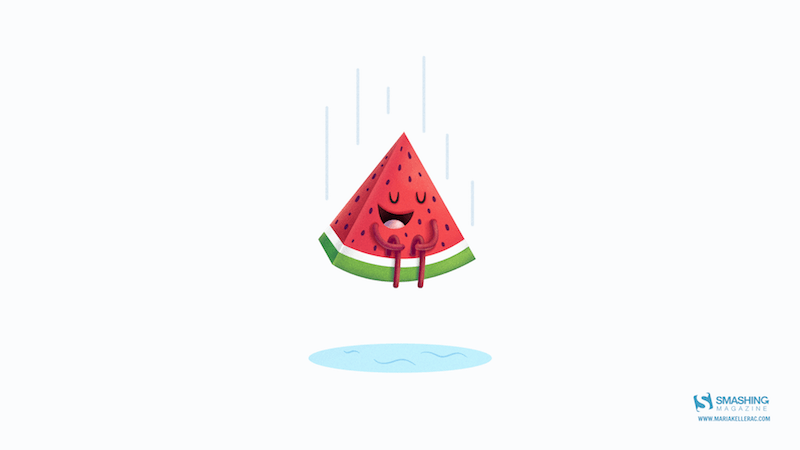 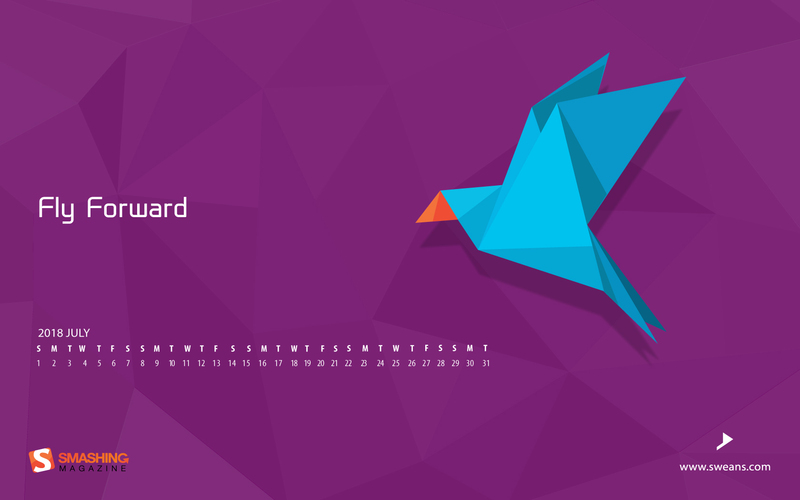 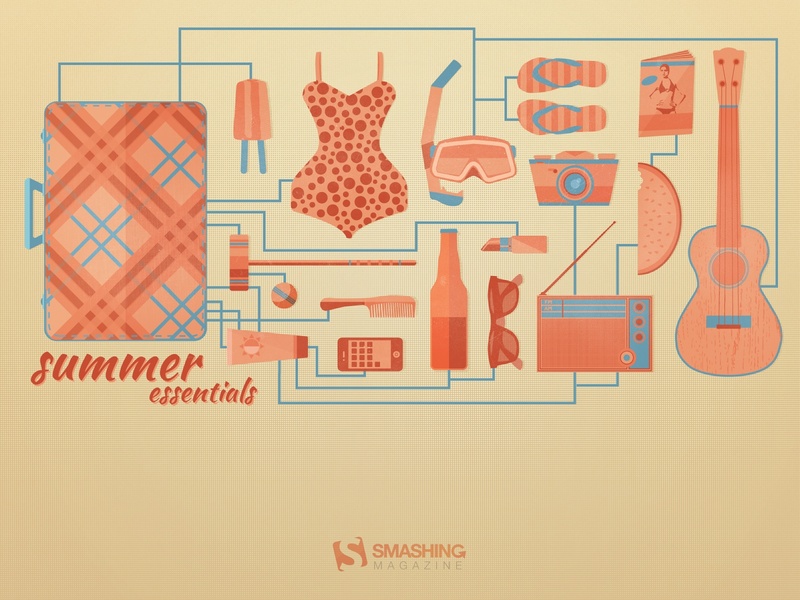 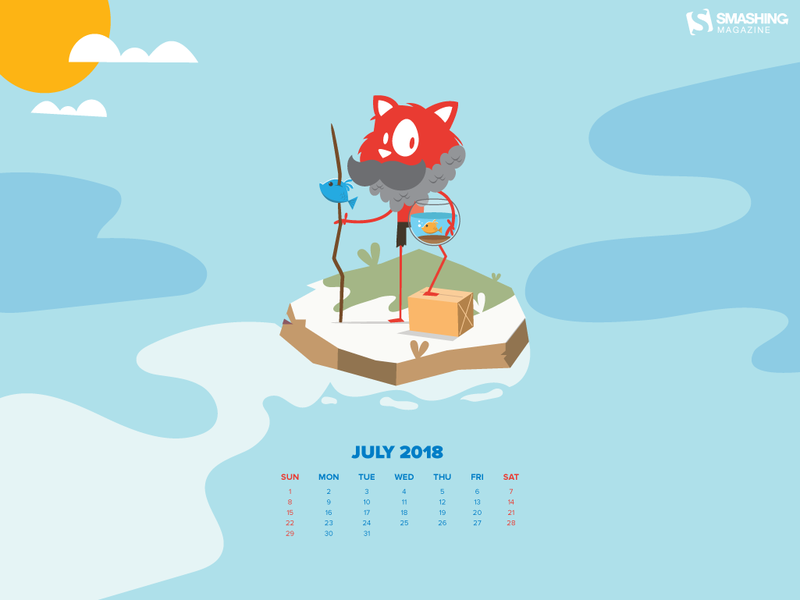 So why not bring a bit of that summer joy to your desktop, too? 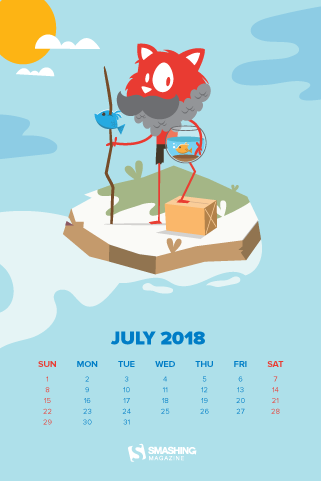 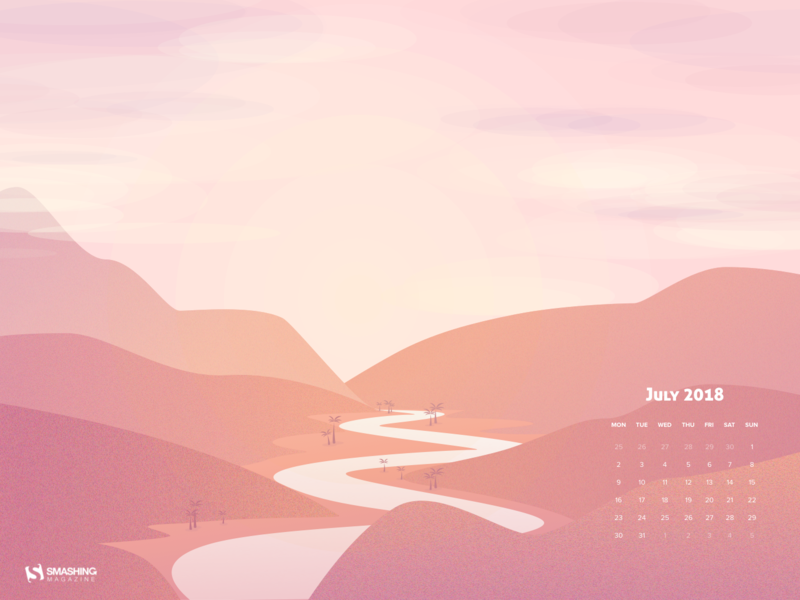 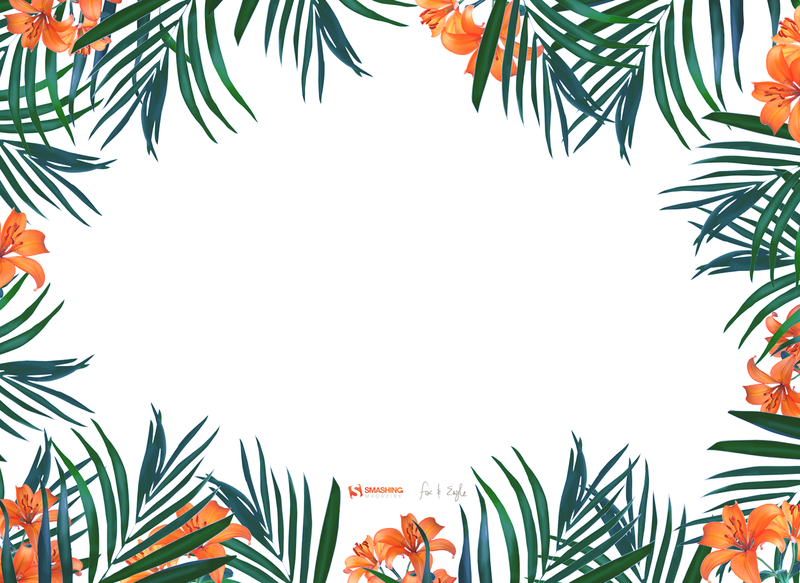 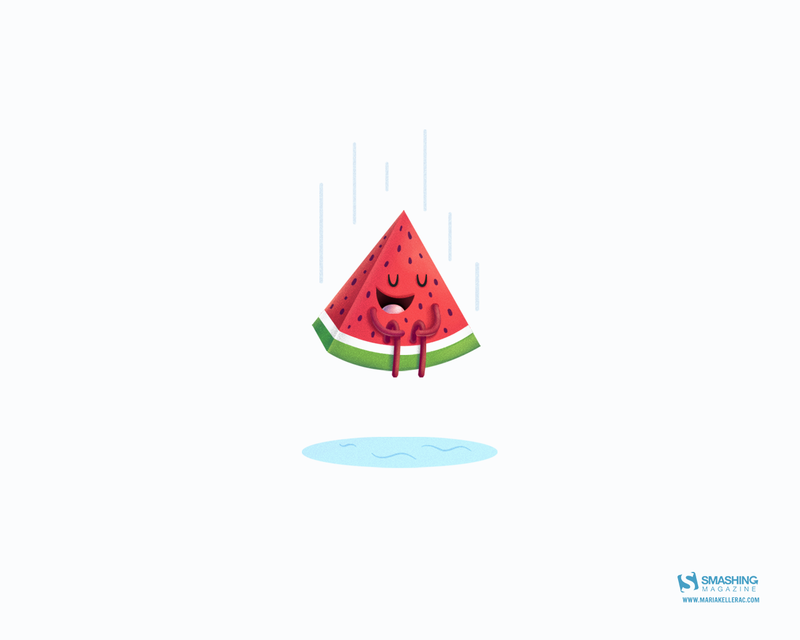 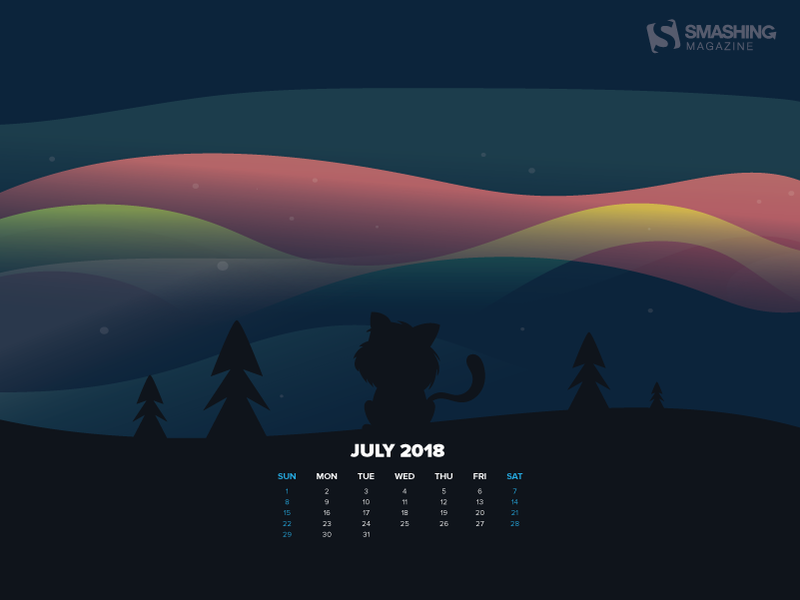 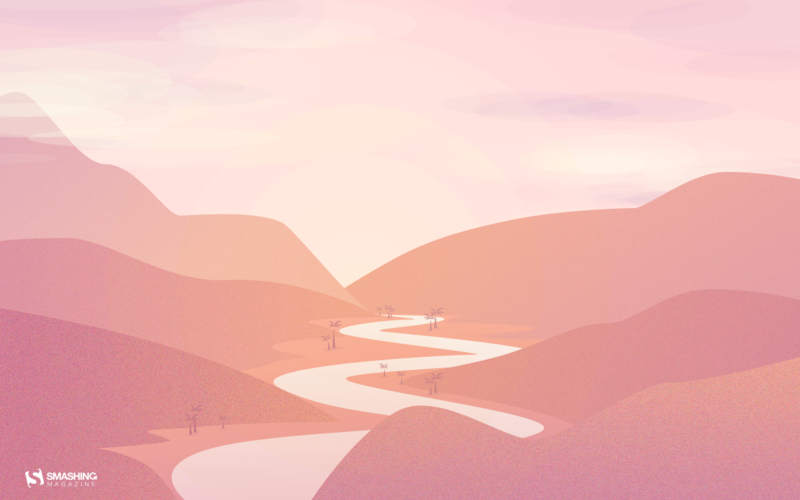 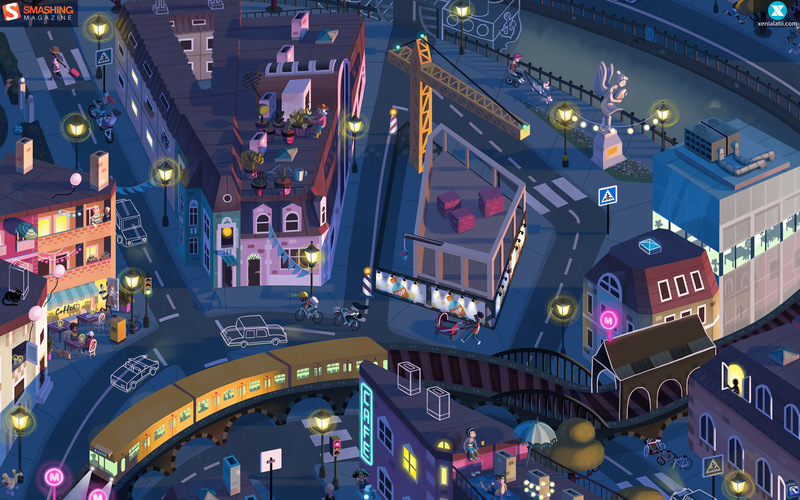 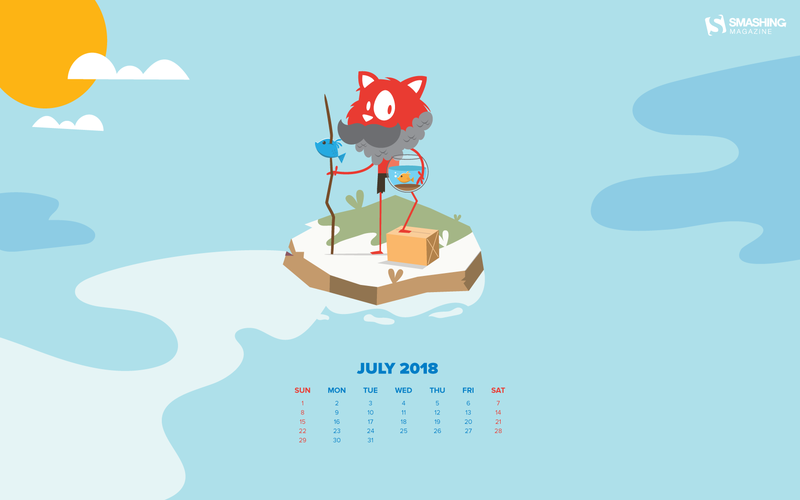 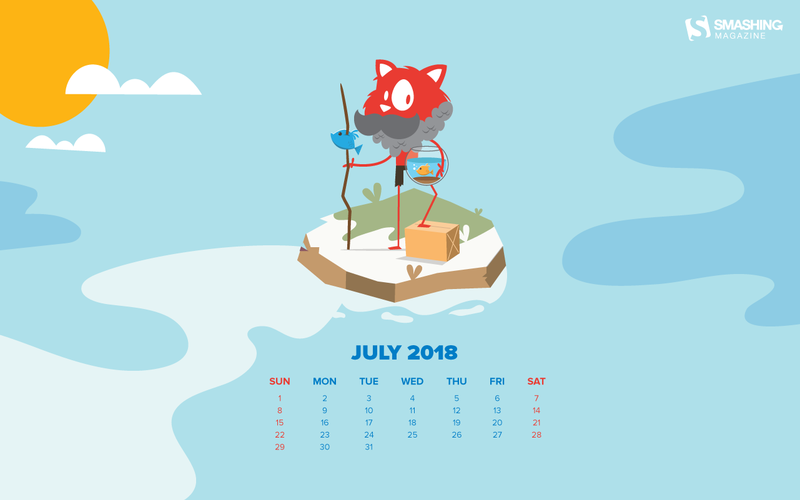 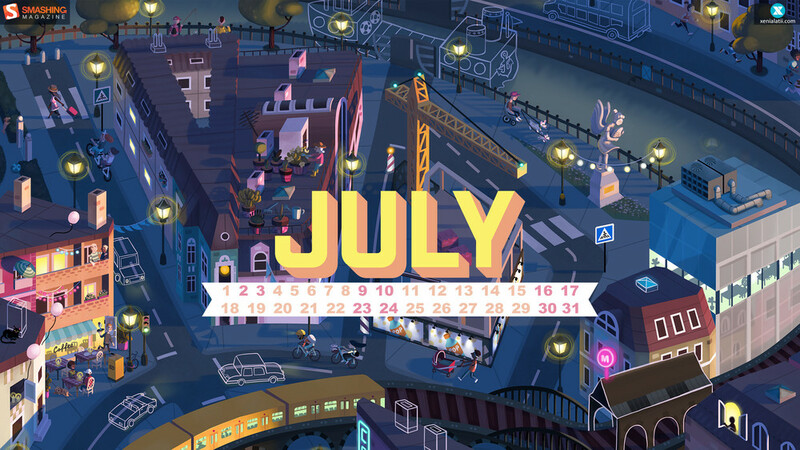 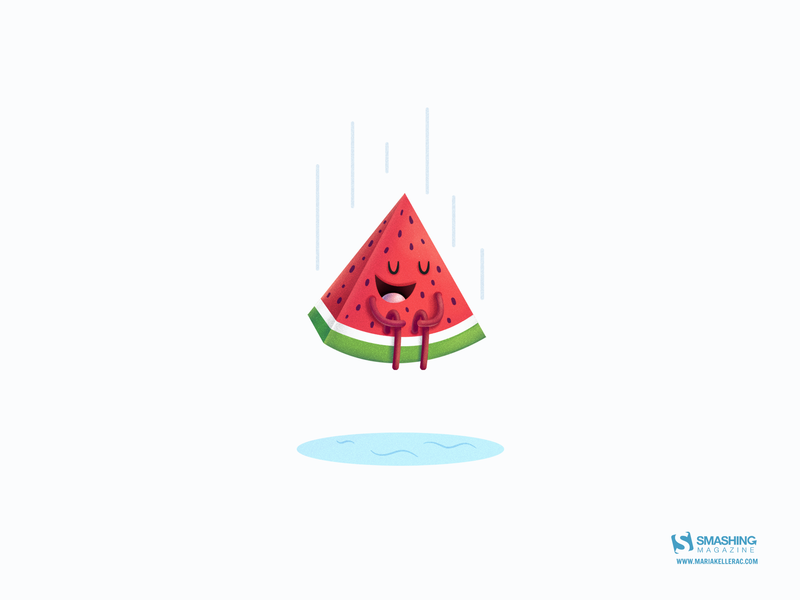 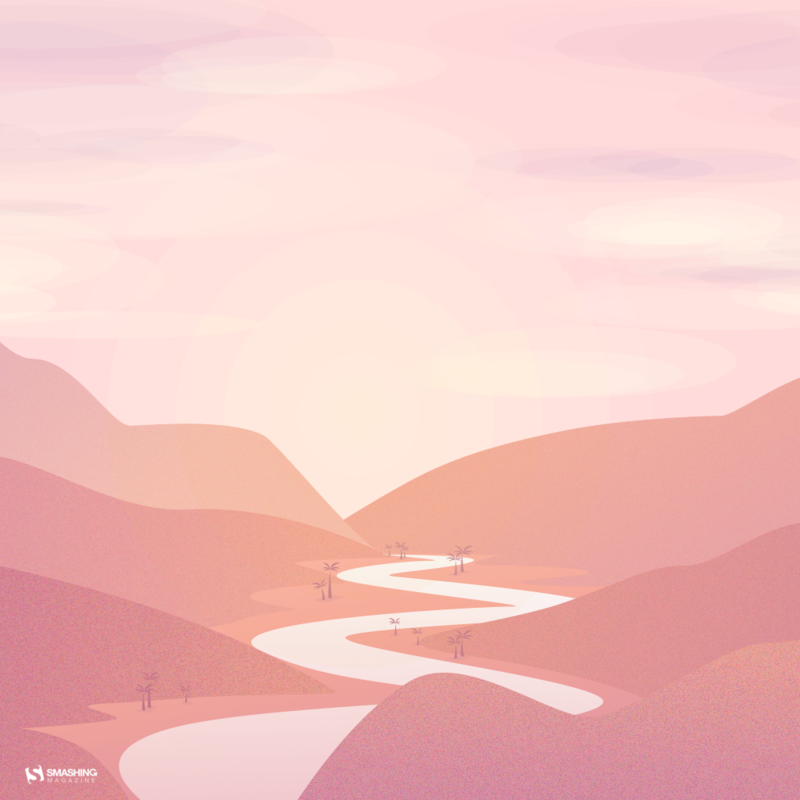 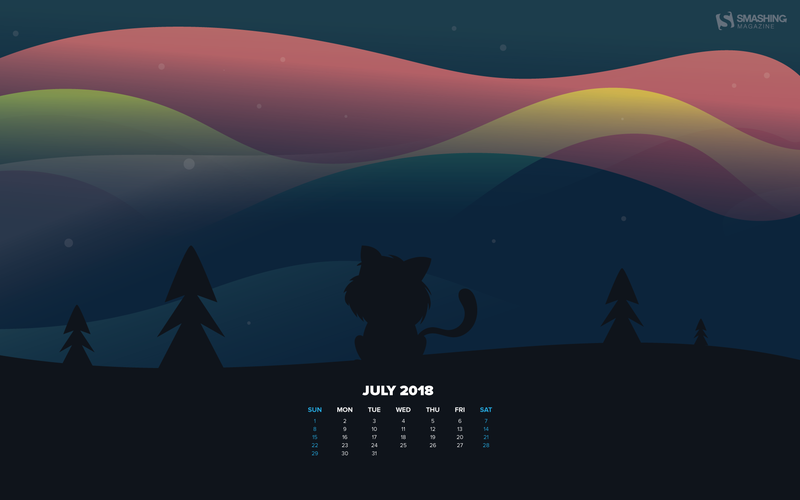 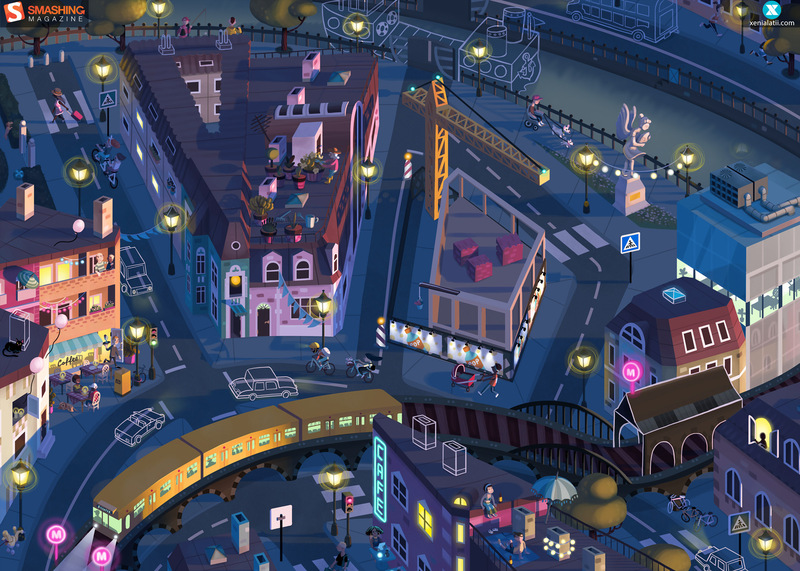 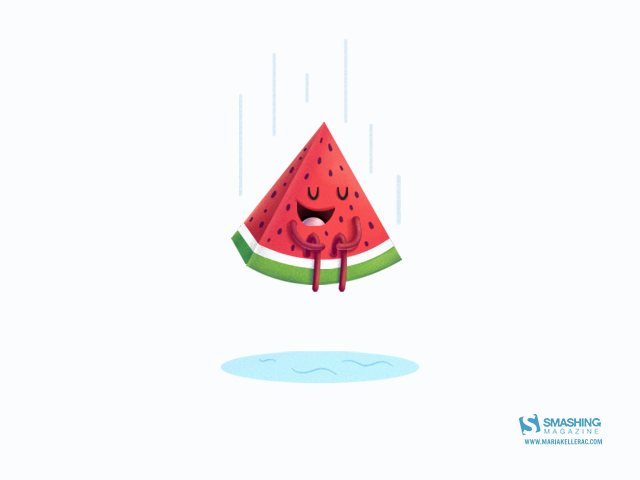 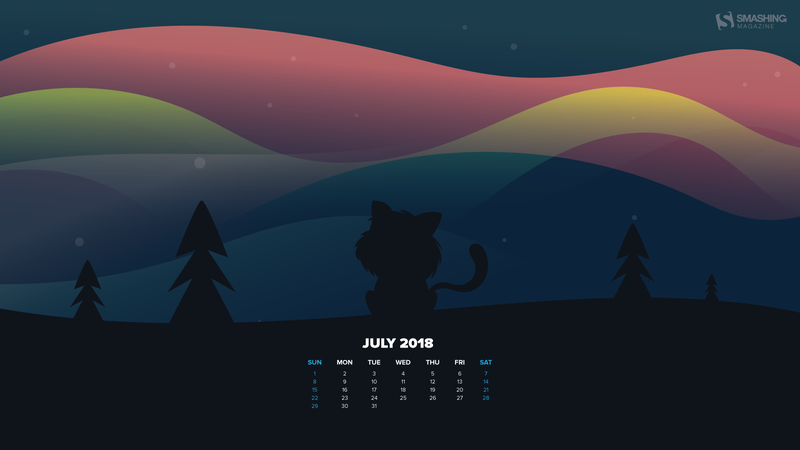 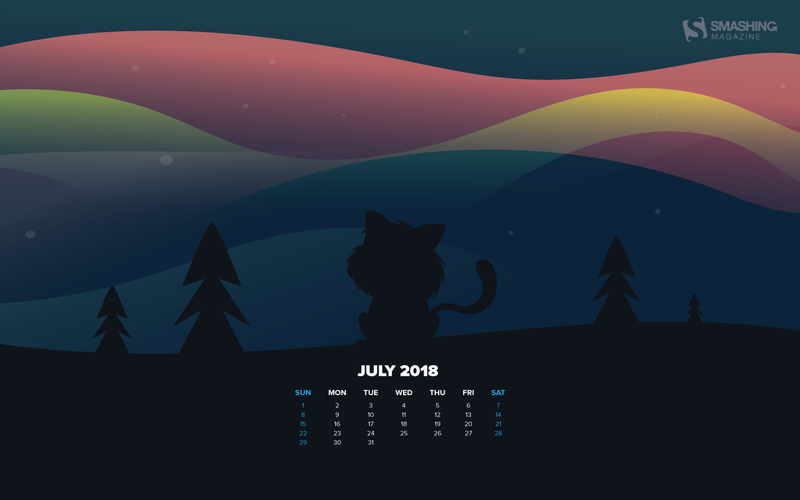 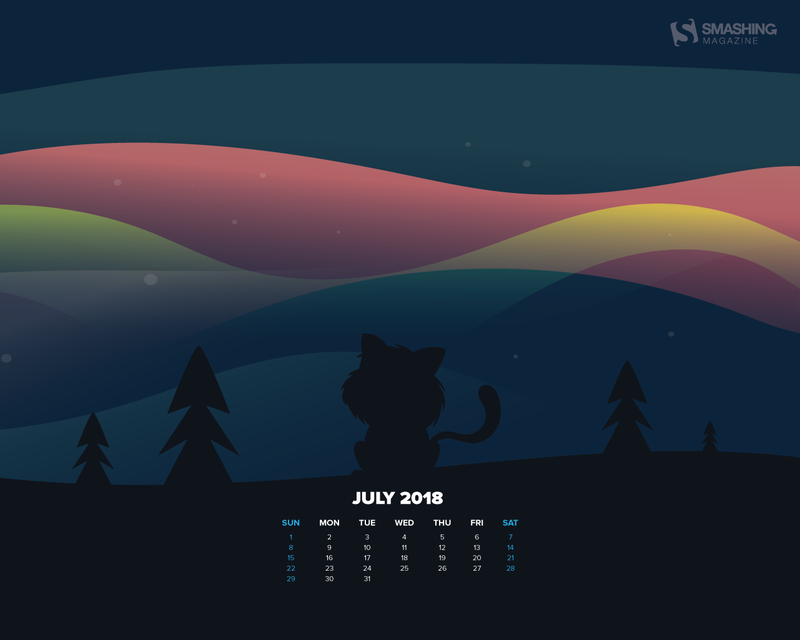 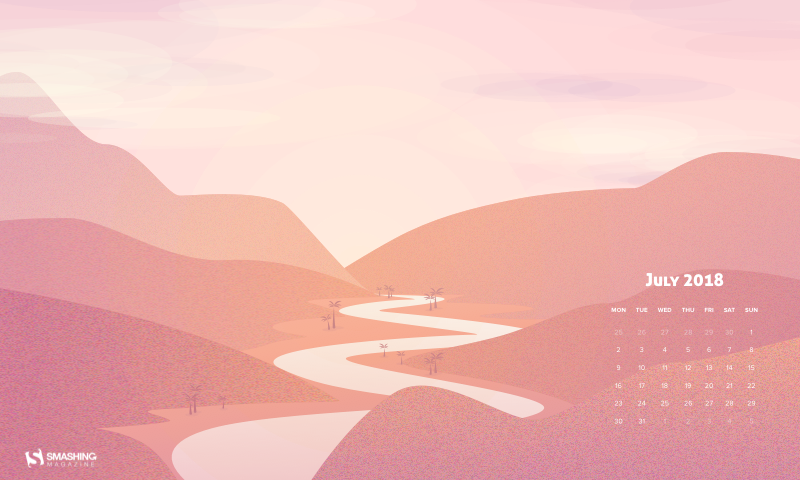 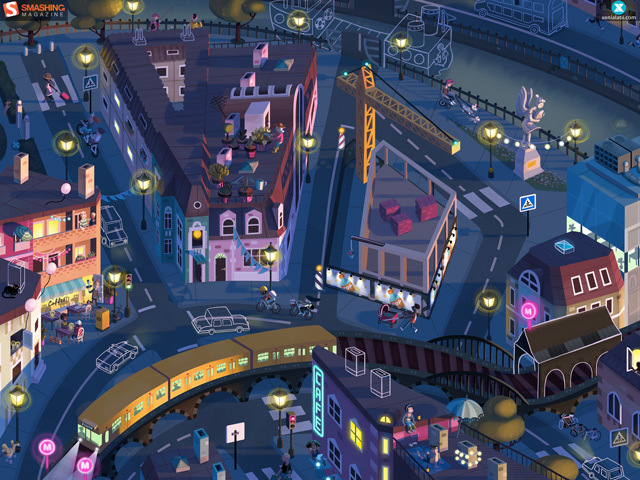 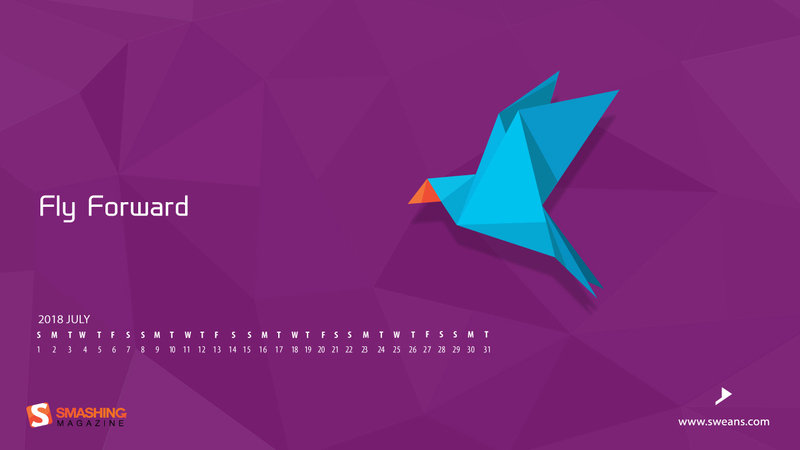 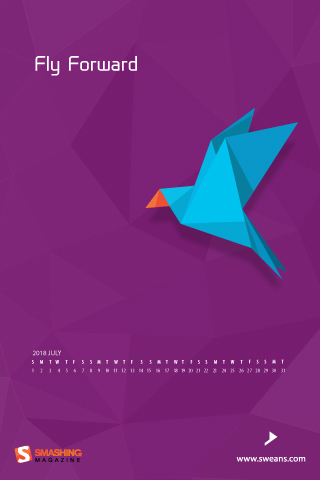 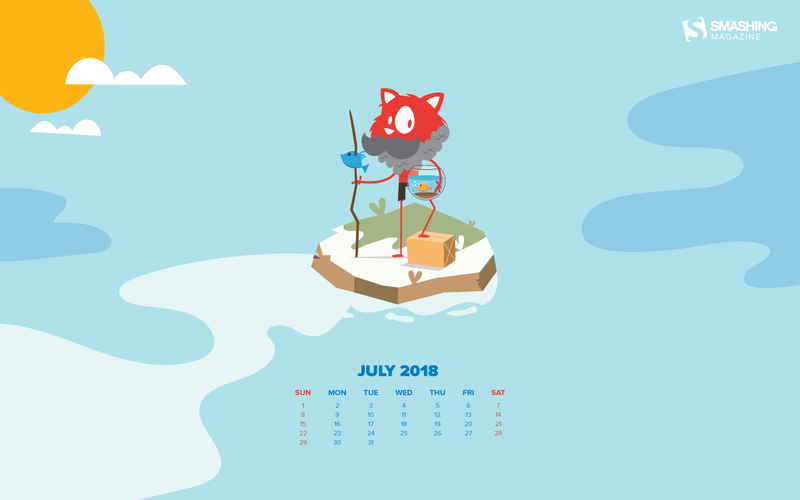 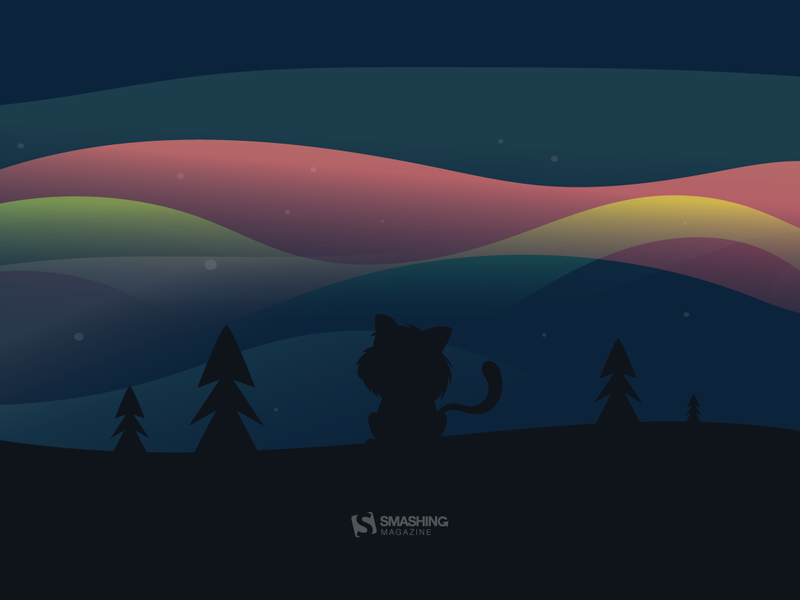 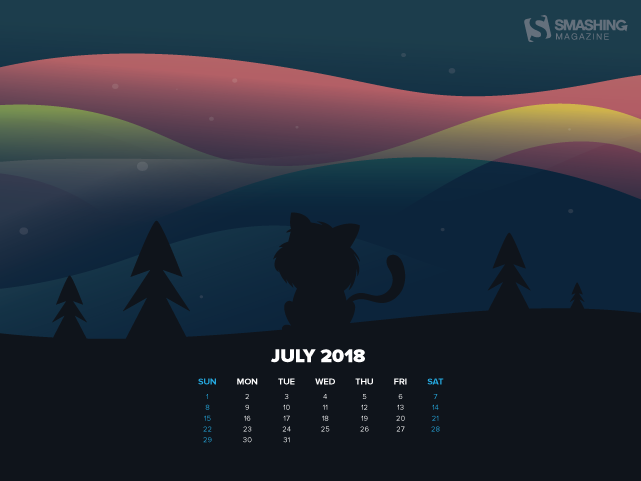 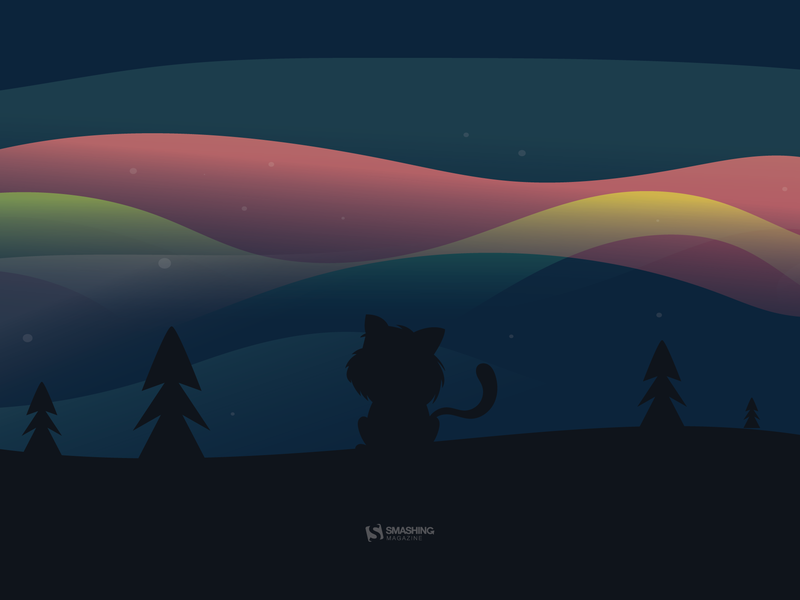 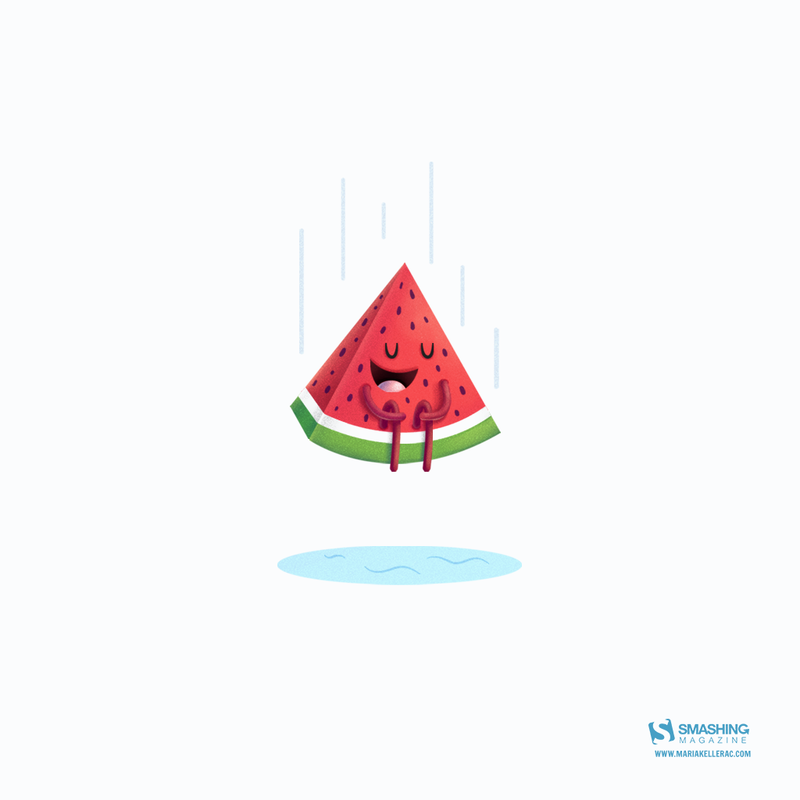 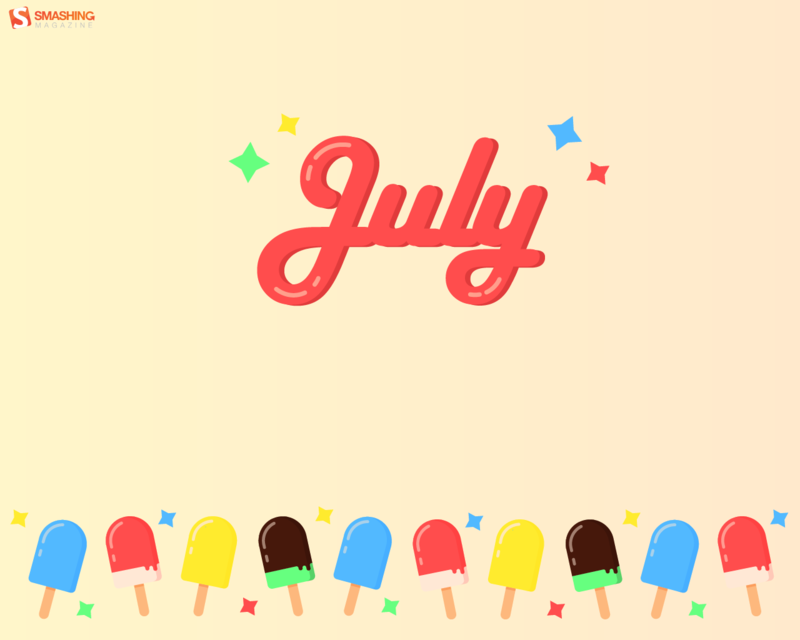 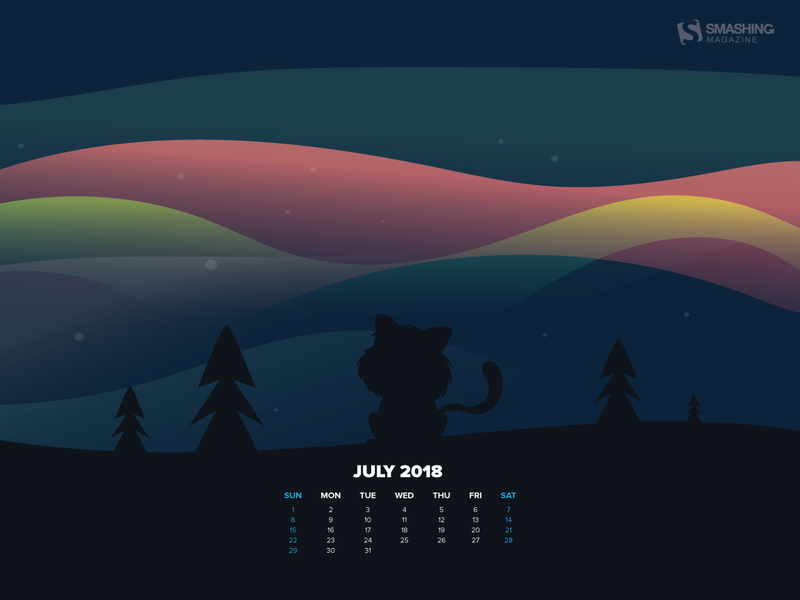 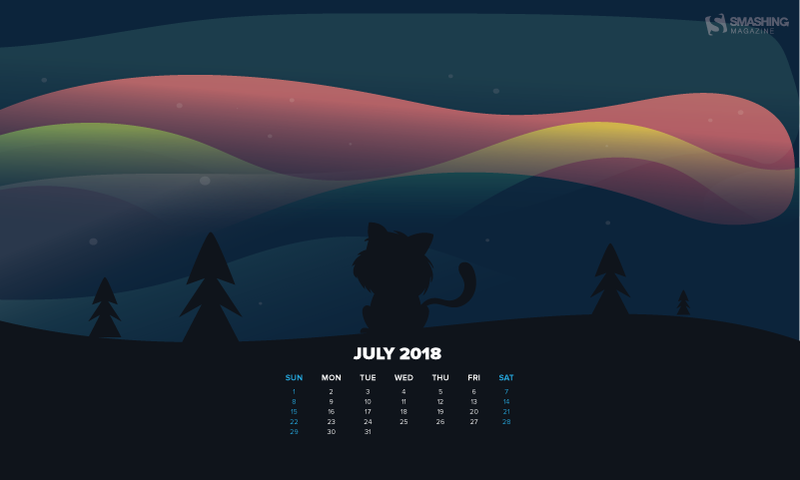 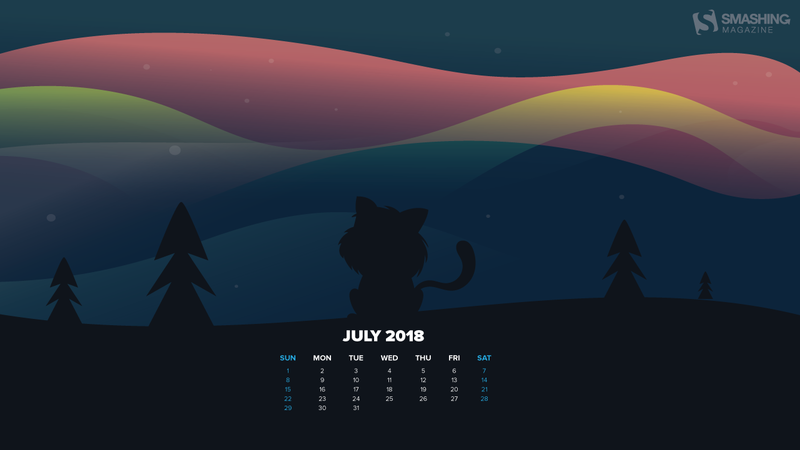 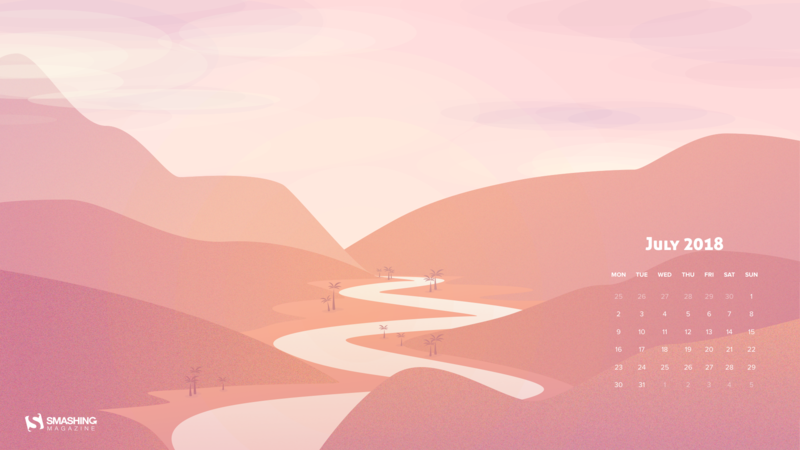 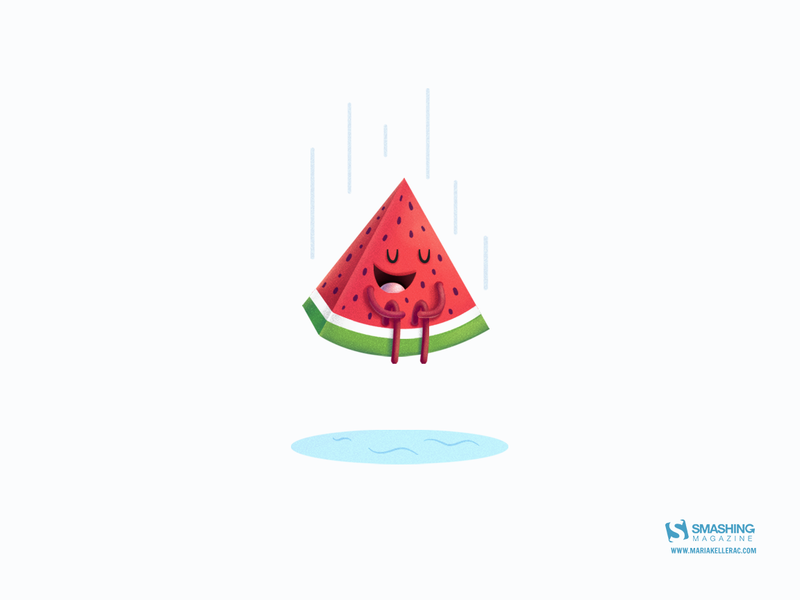 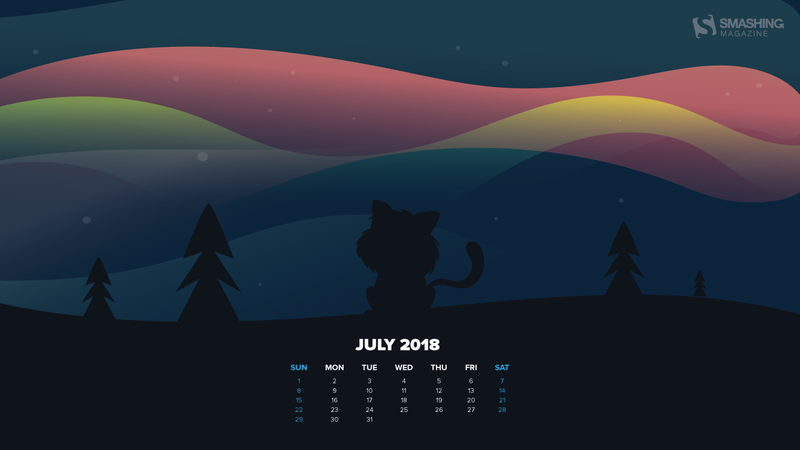 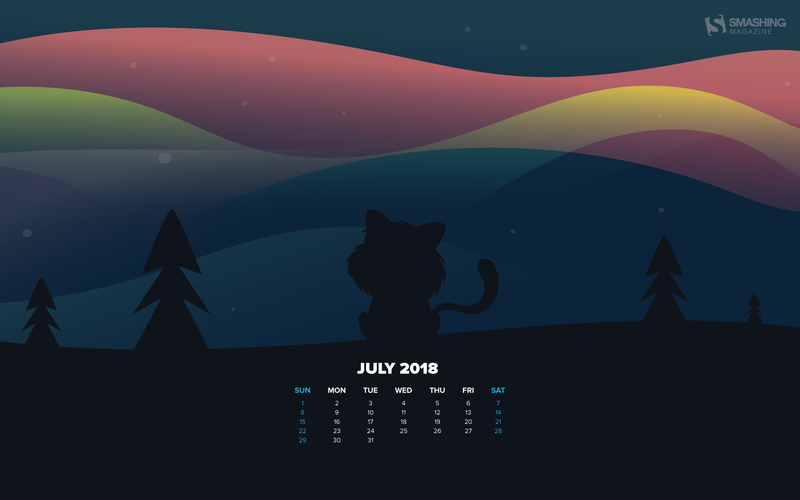 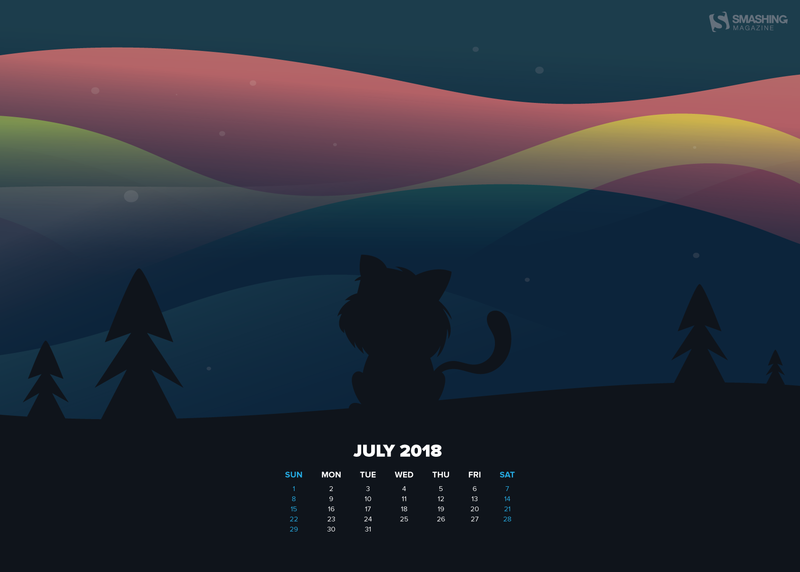 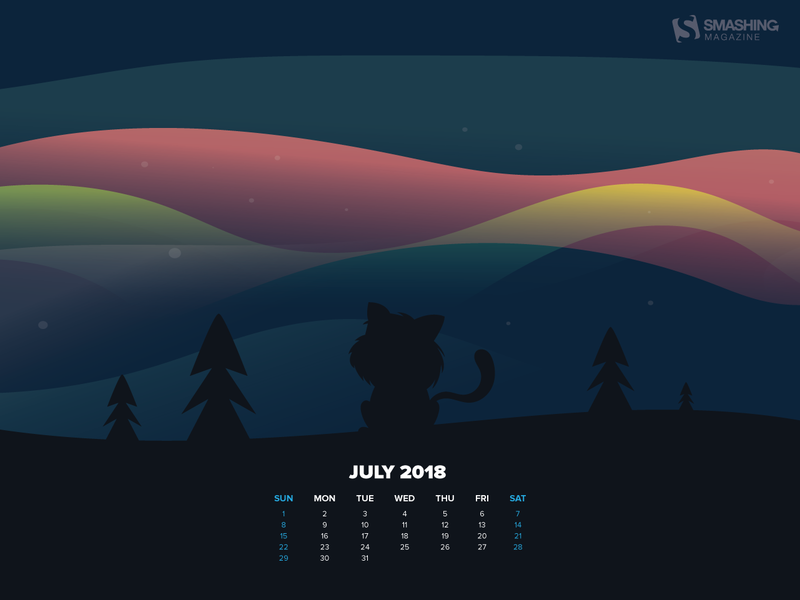 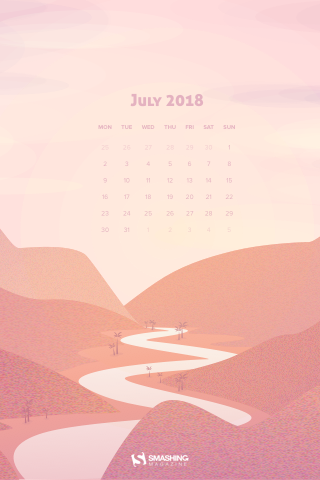 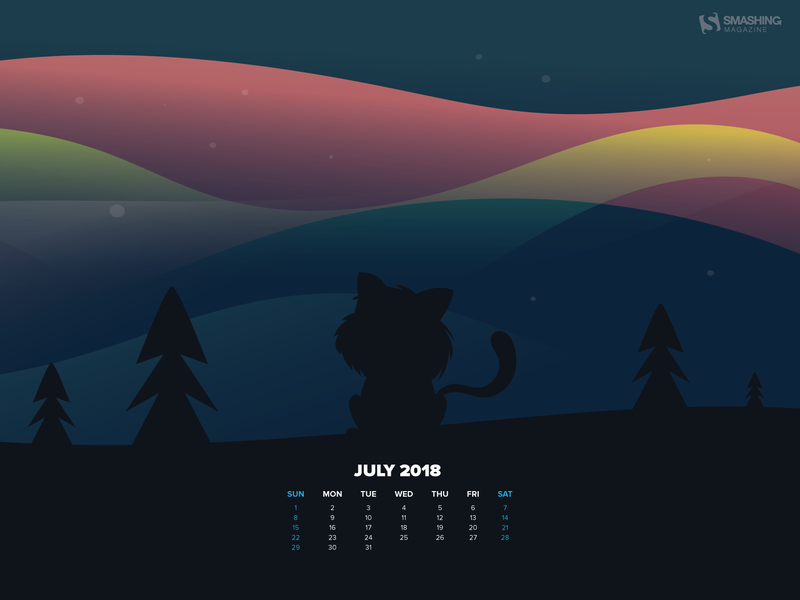 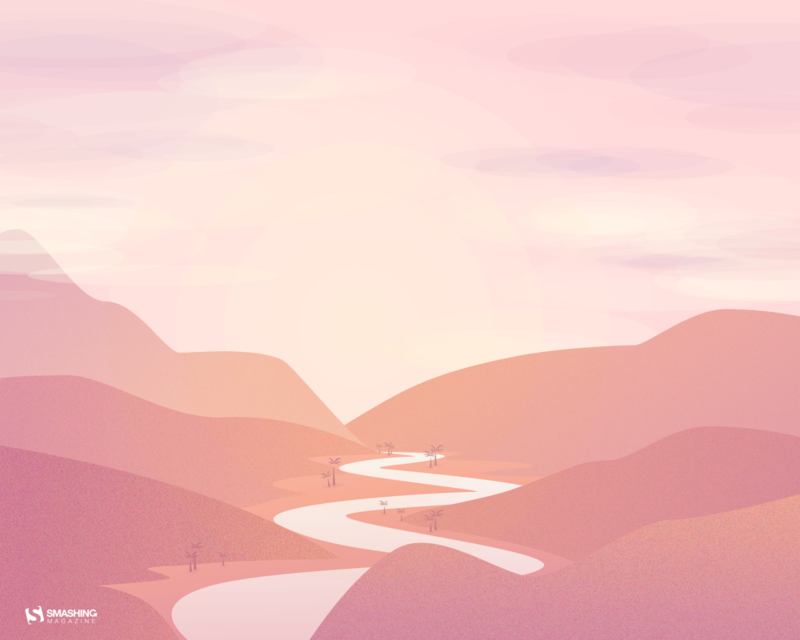 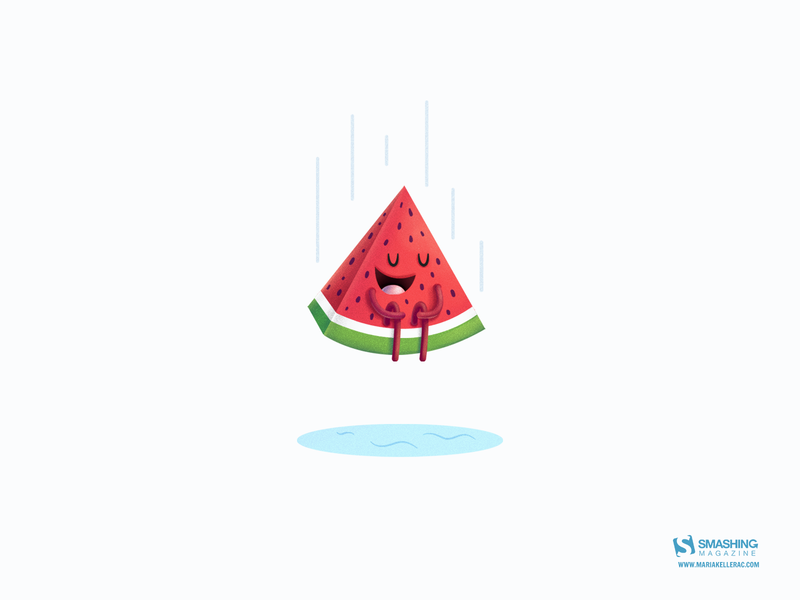 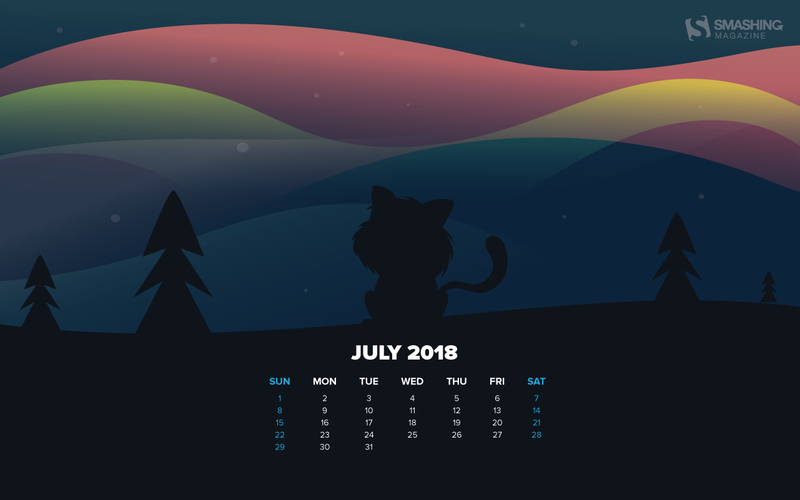 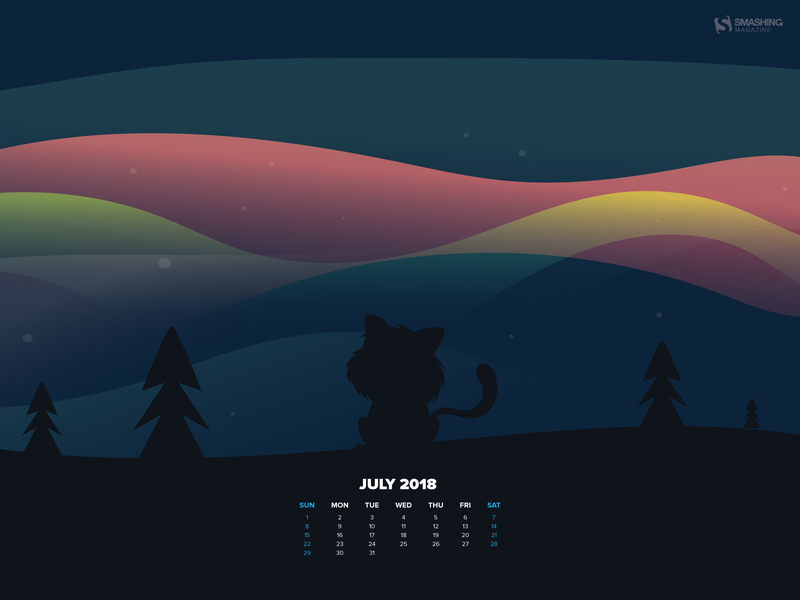 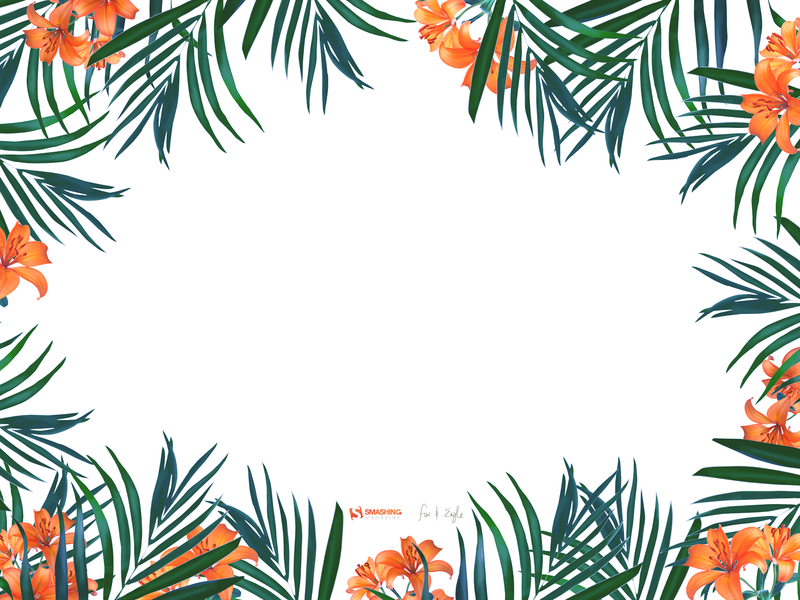 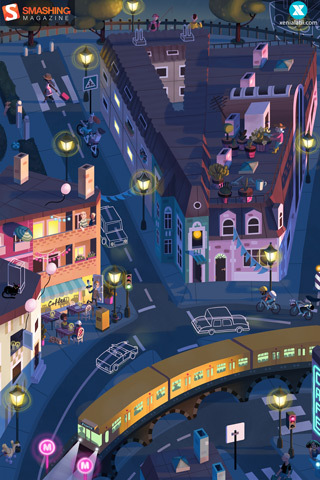 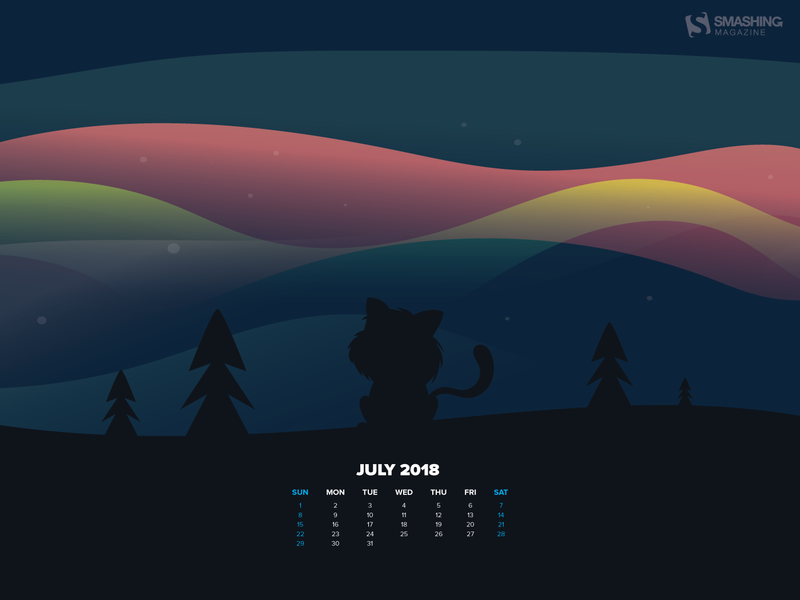 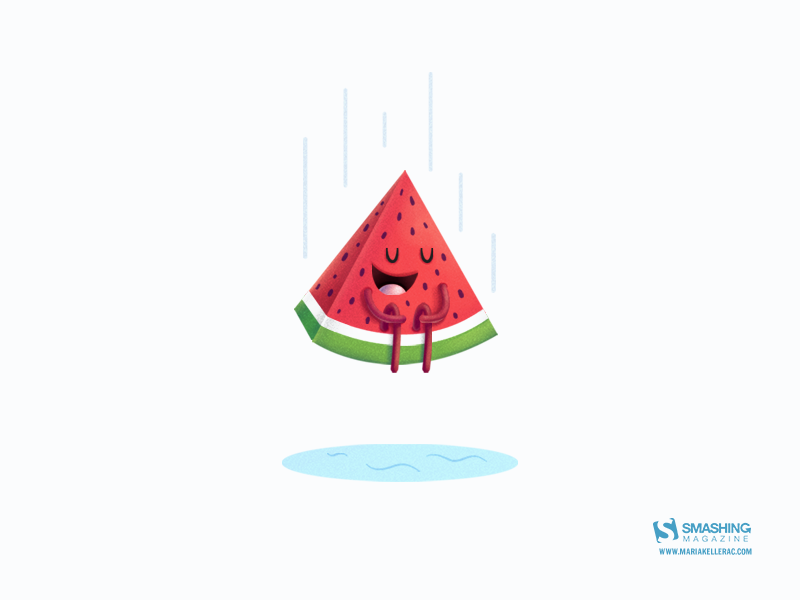 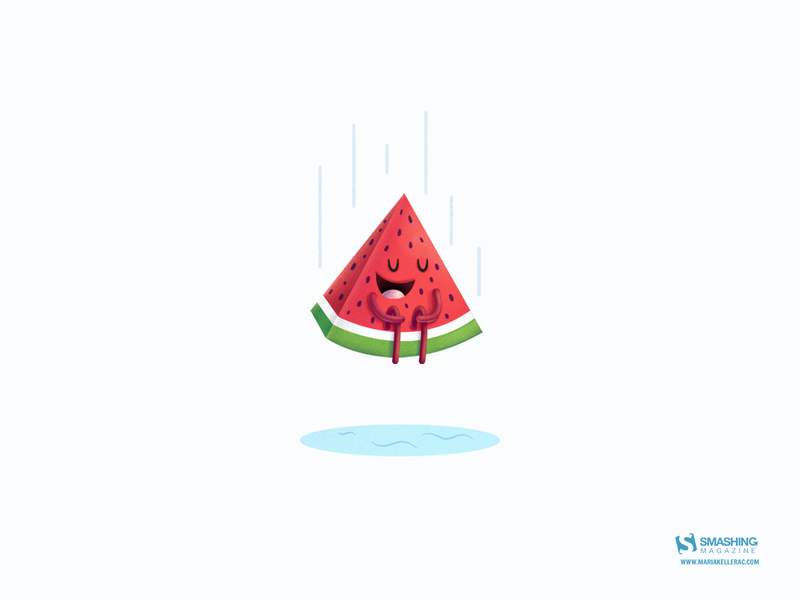 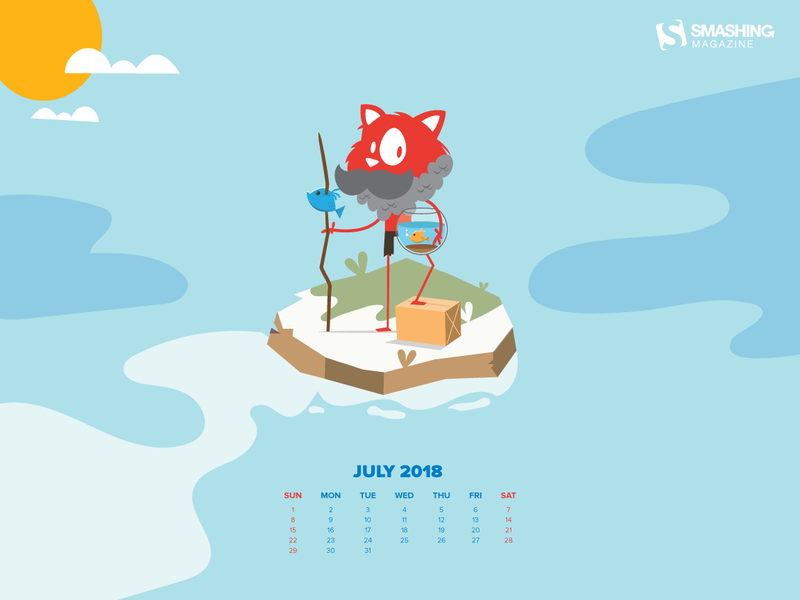 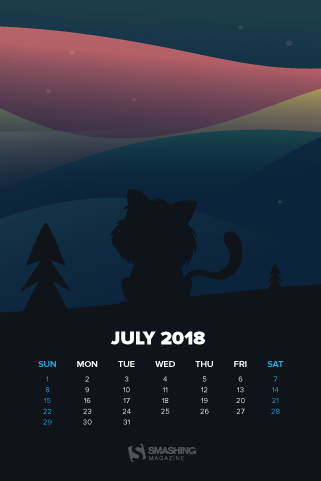 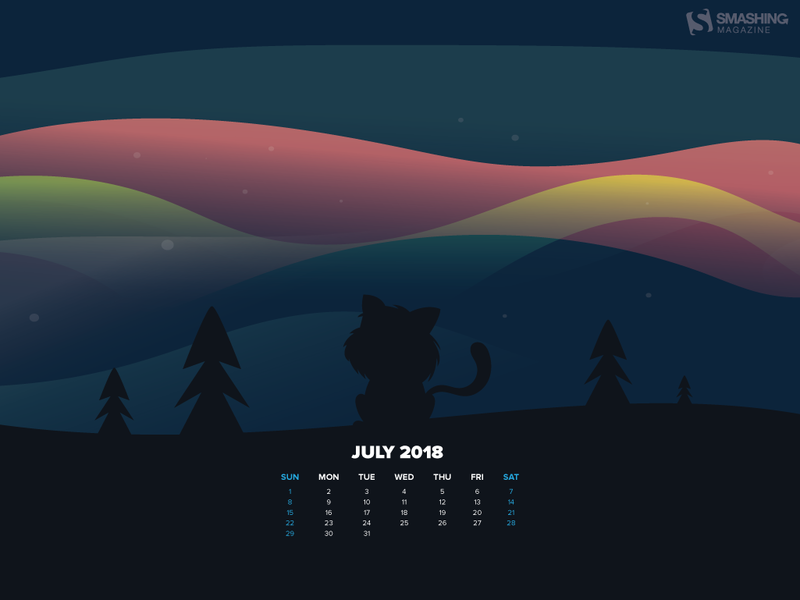 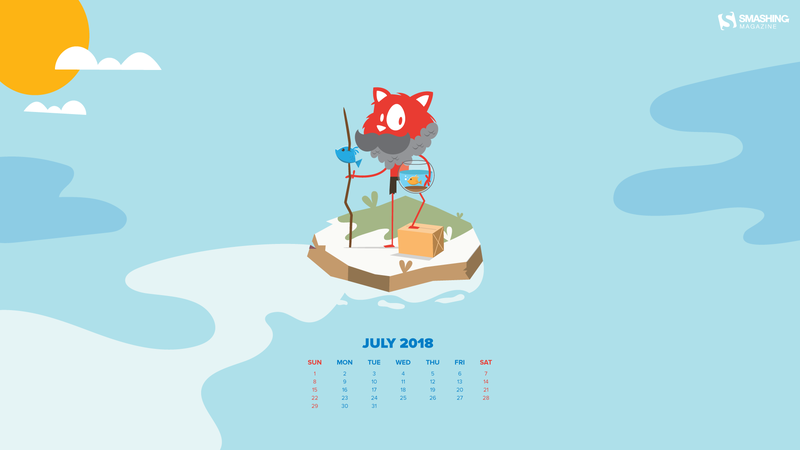 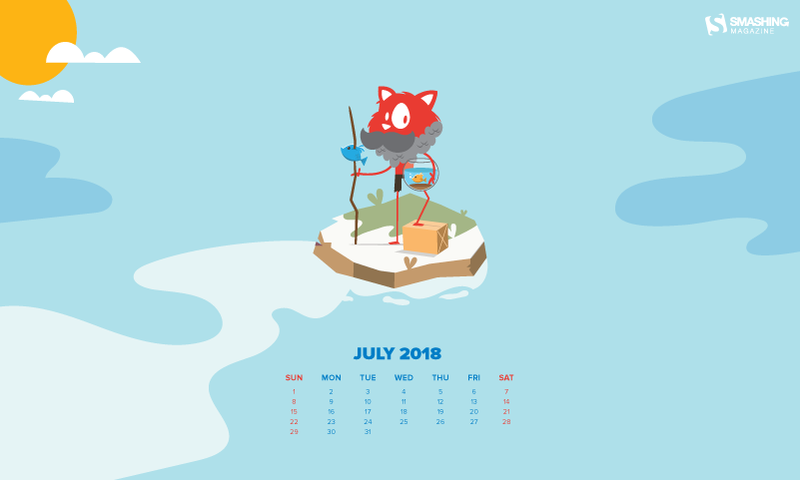 In this post, you’ll find free wallpapers for July 2018 created by artists and designers from across the globe as it has been our monthly tradition since more than nine years already. 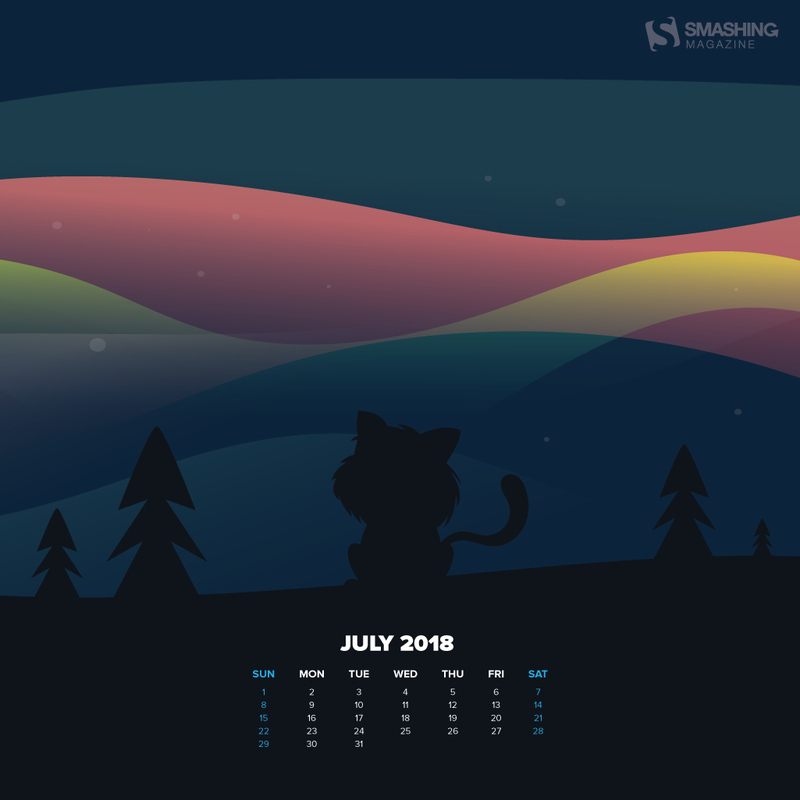 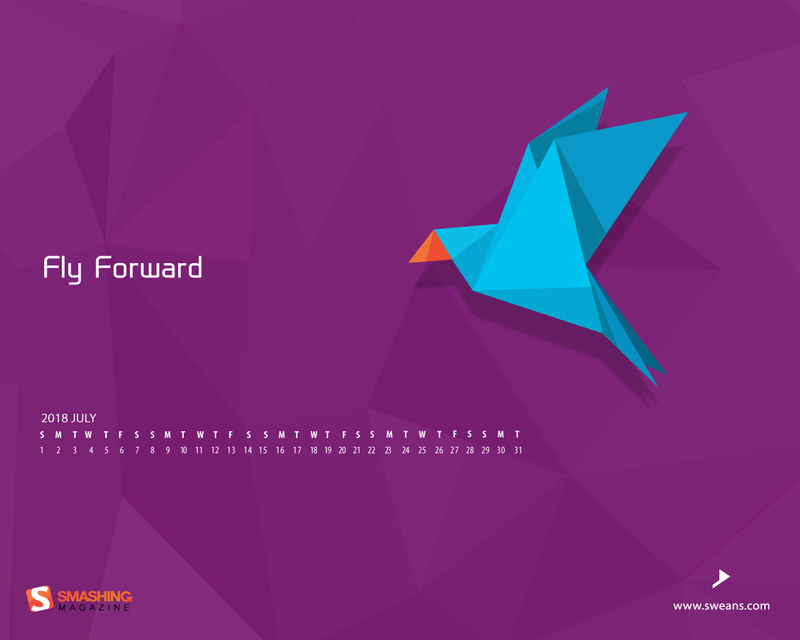 Please note that some of the wallpapers come in two versions as usual (with and without a calendar for the month), while the best-of selection at the end of the post only covers the non-calendar versions. 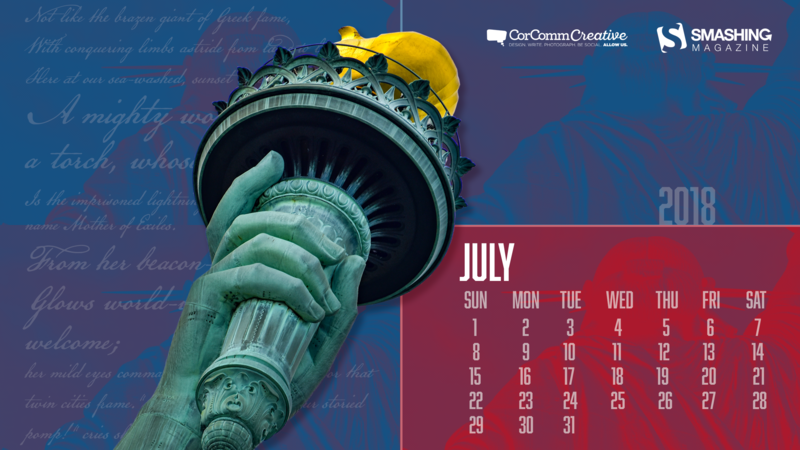 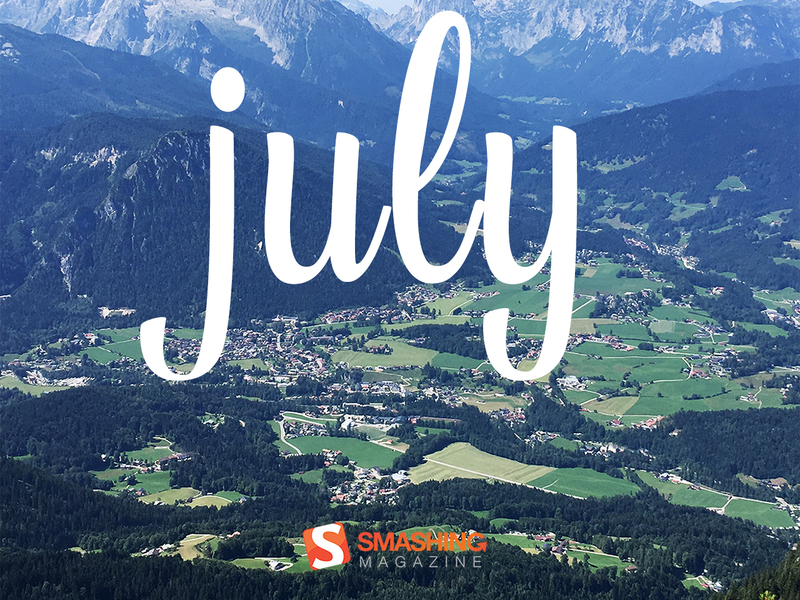 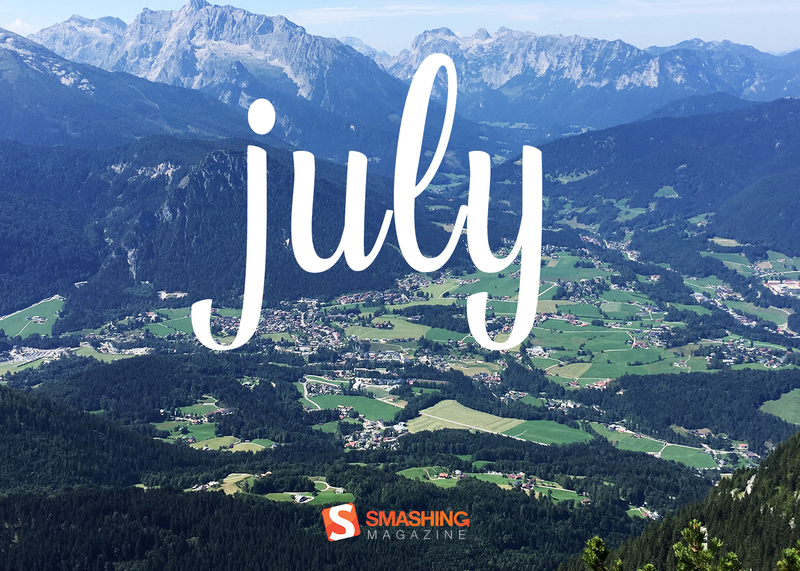 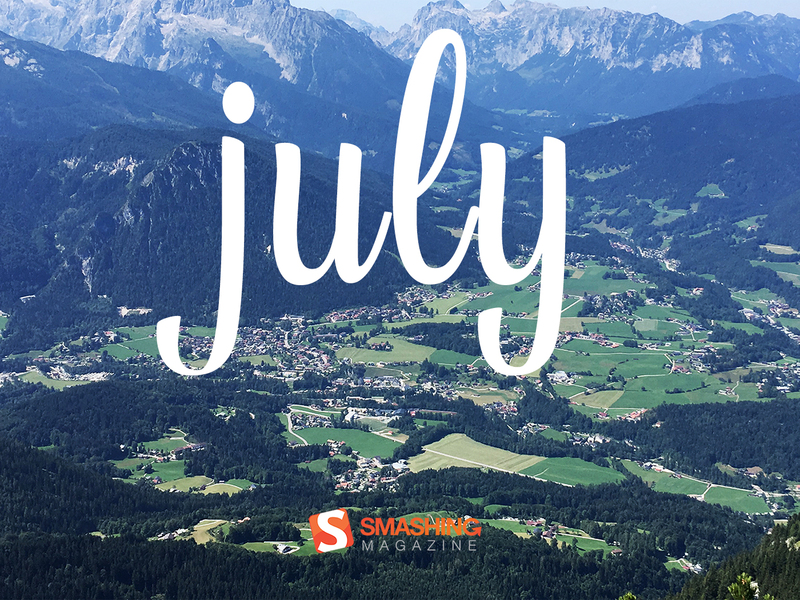 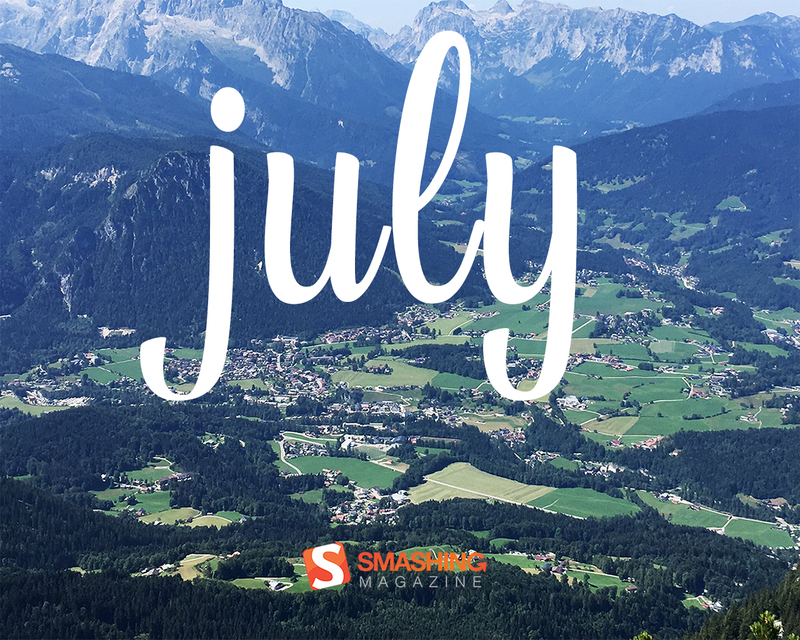 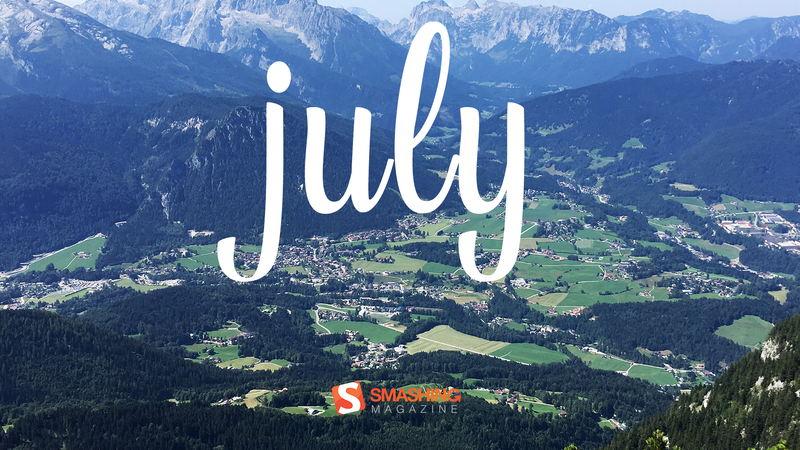 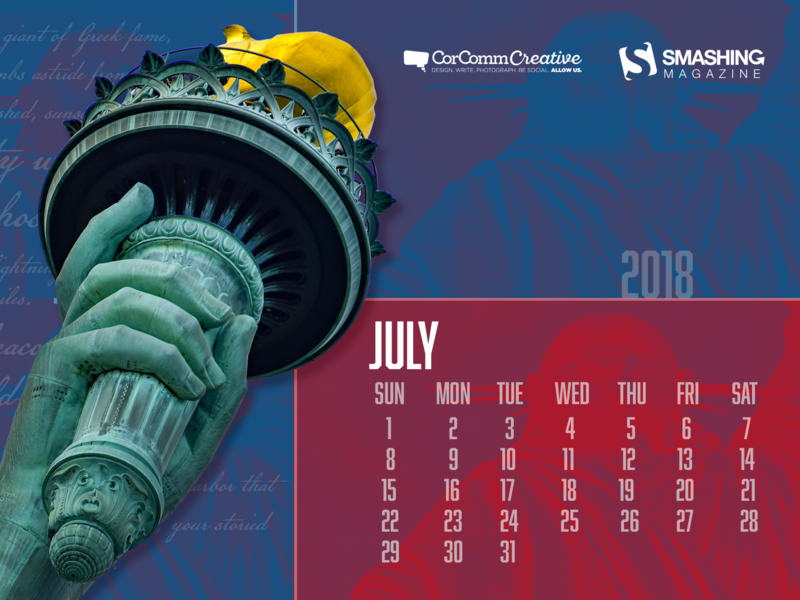 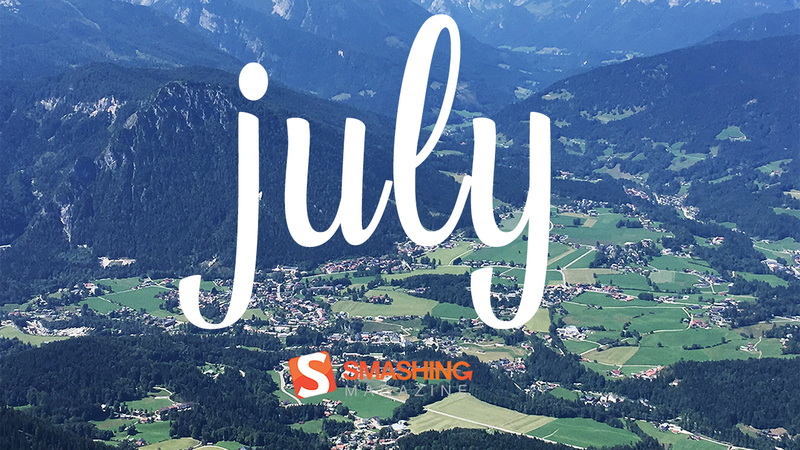 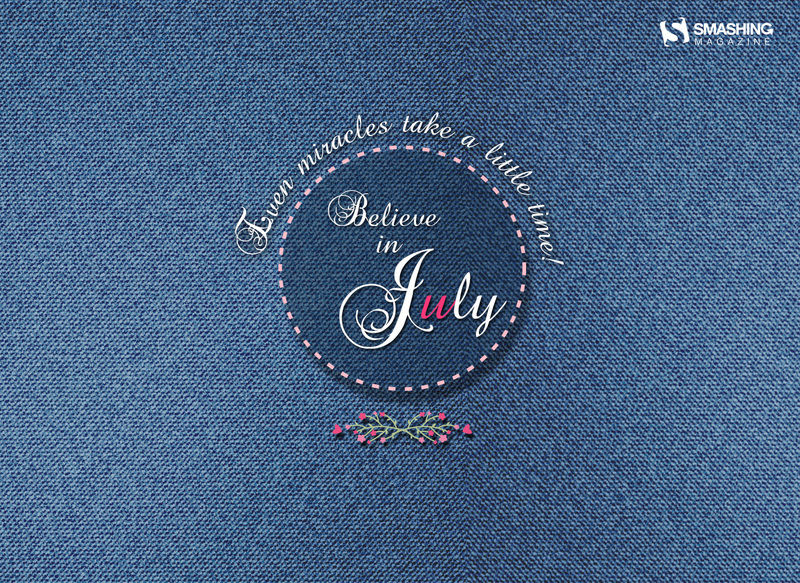 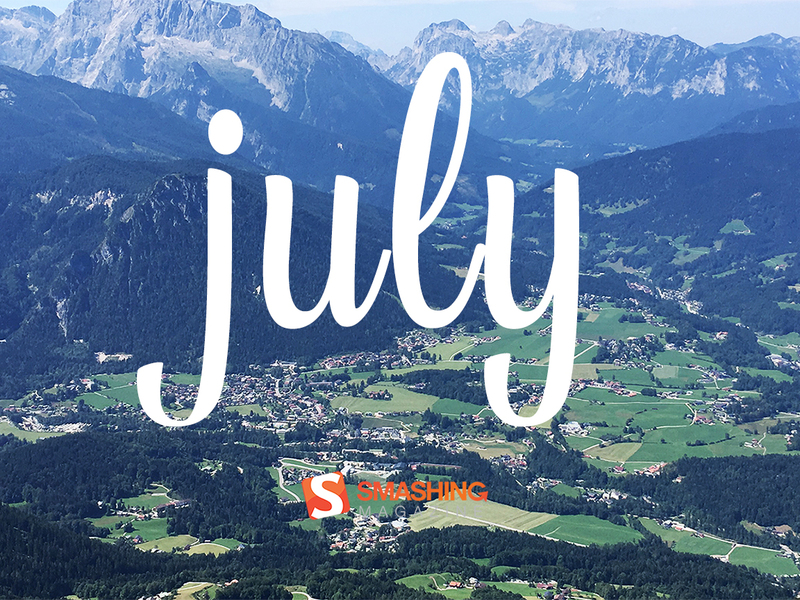 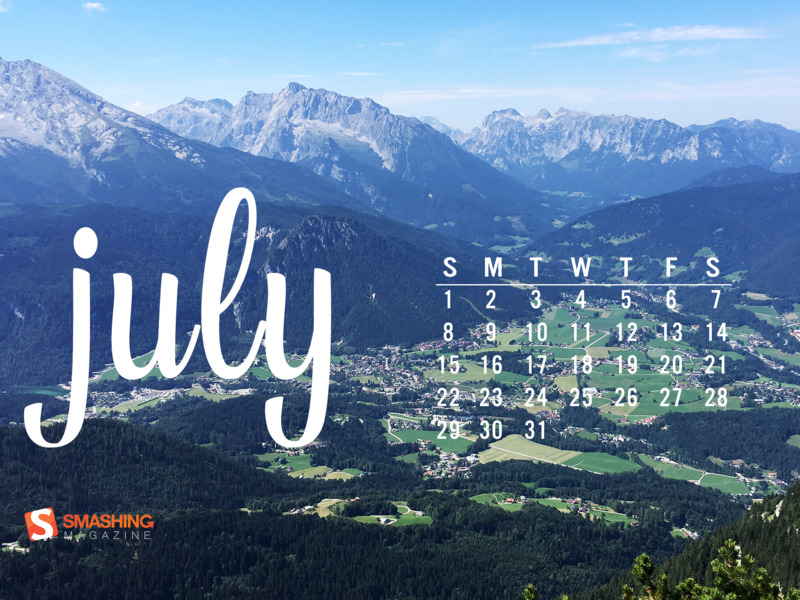 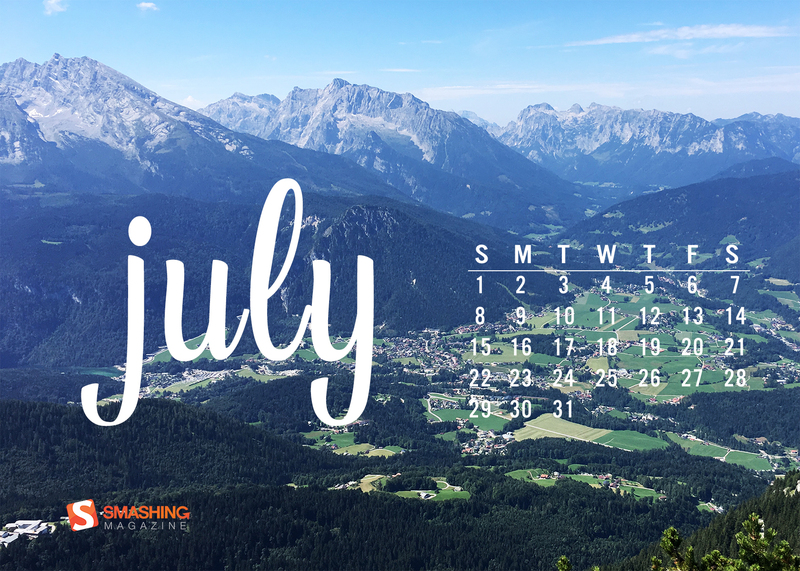 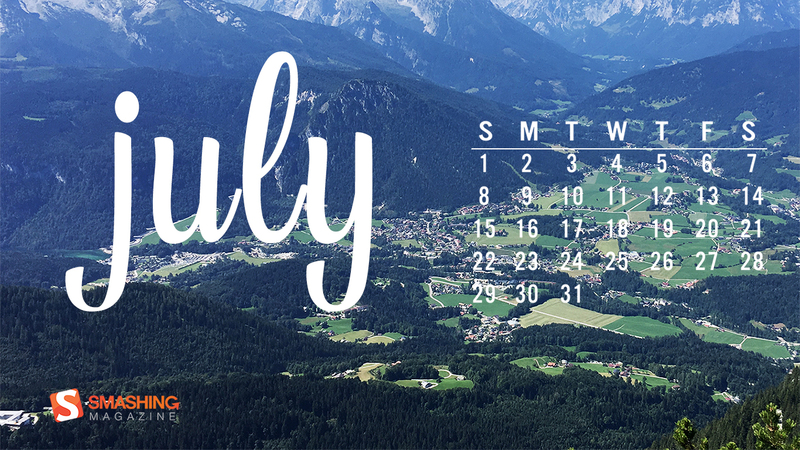 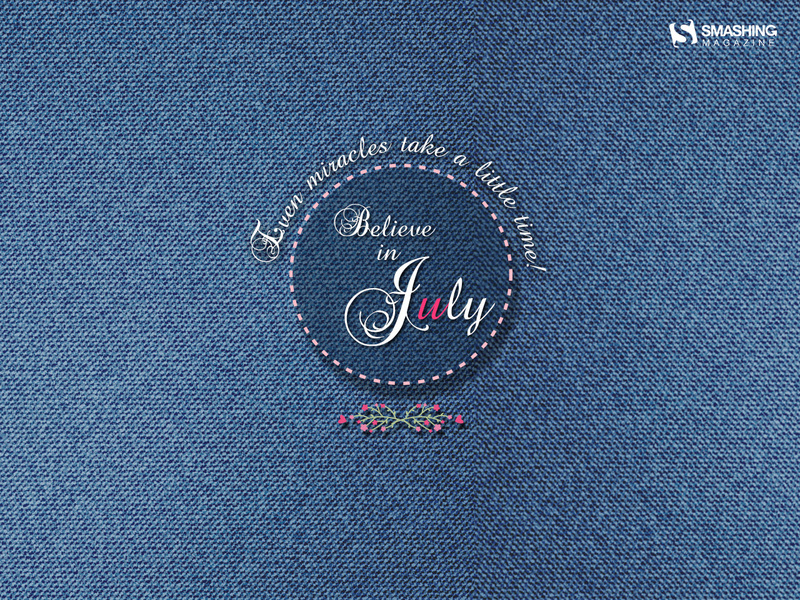 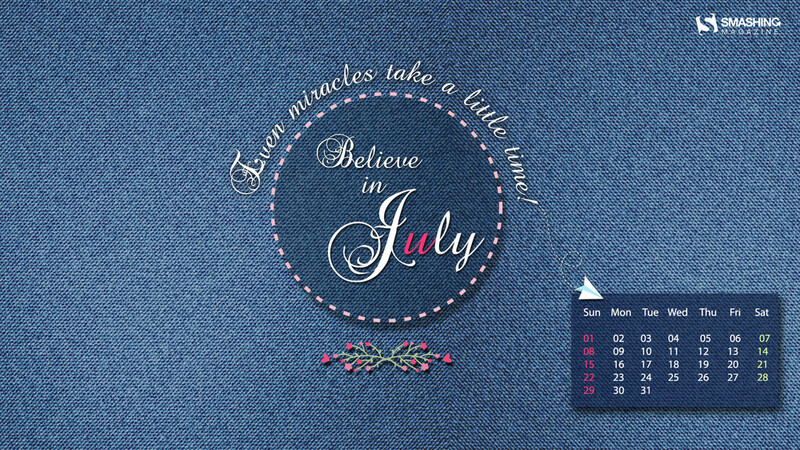 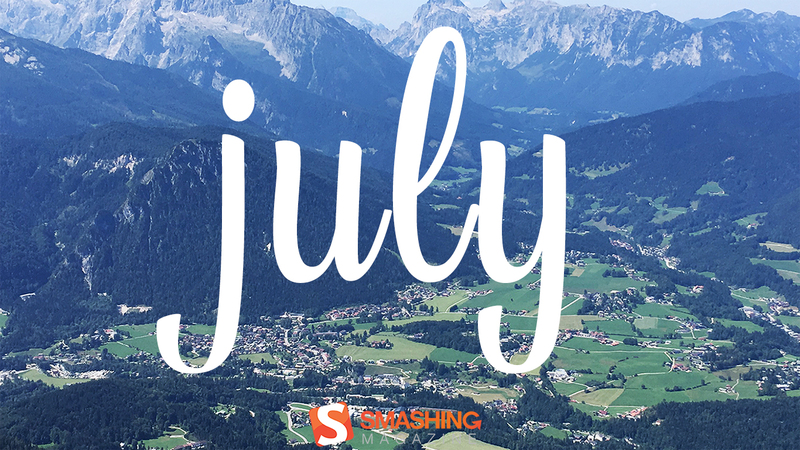 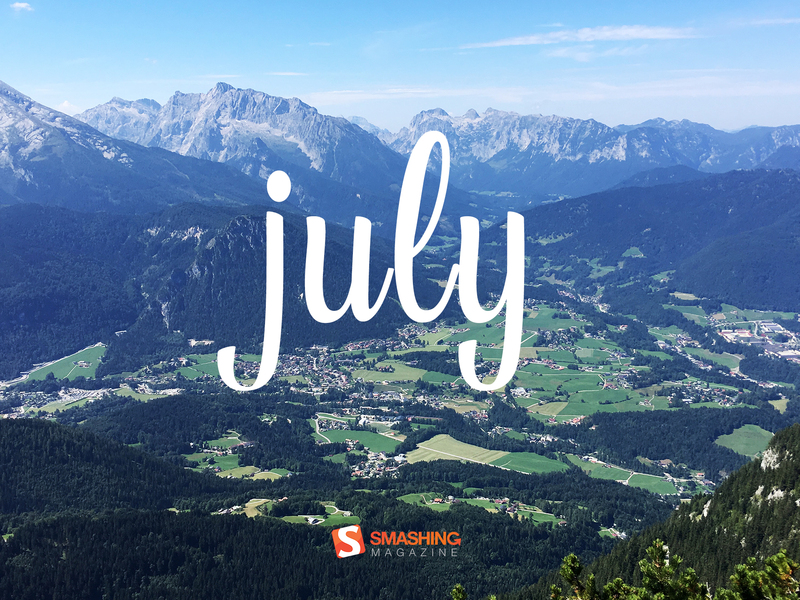 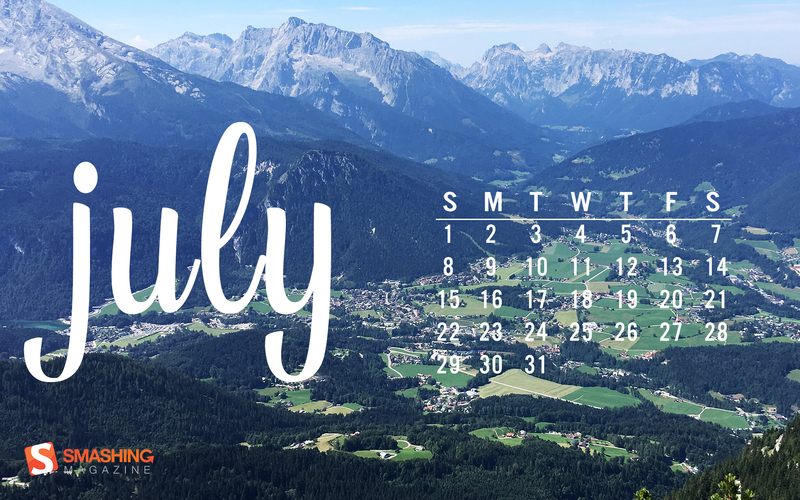 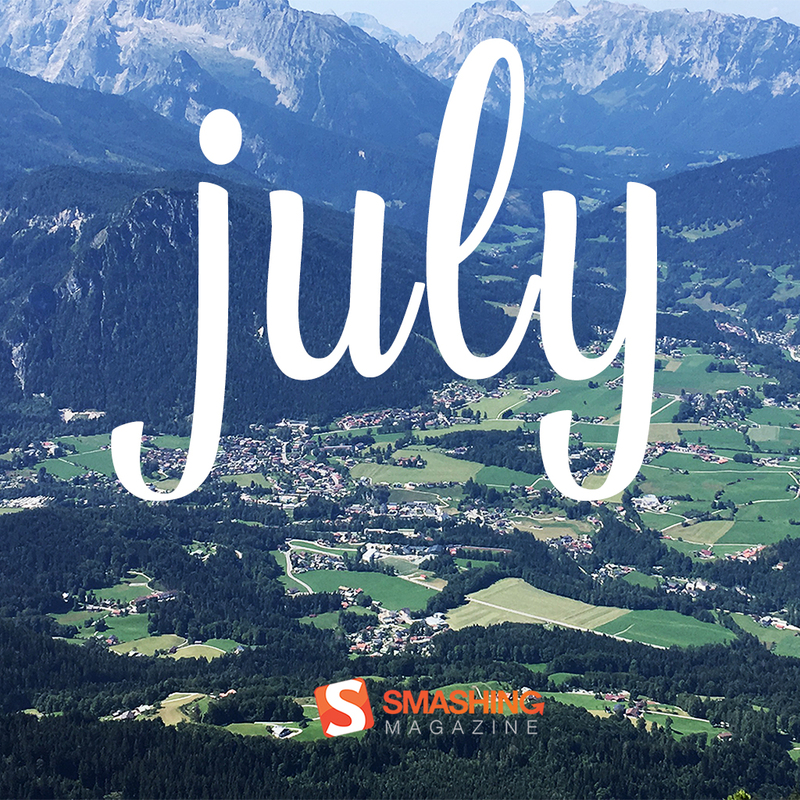 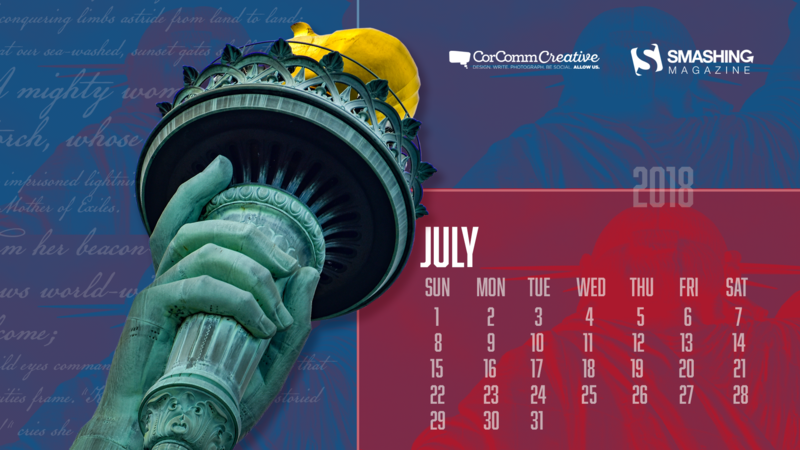 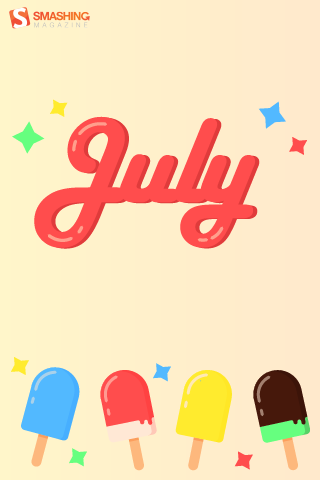 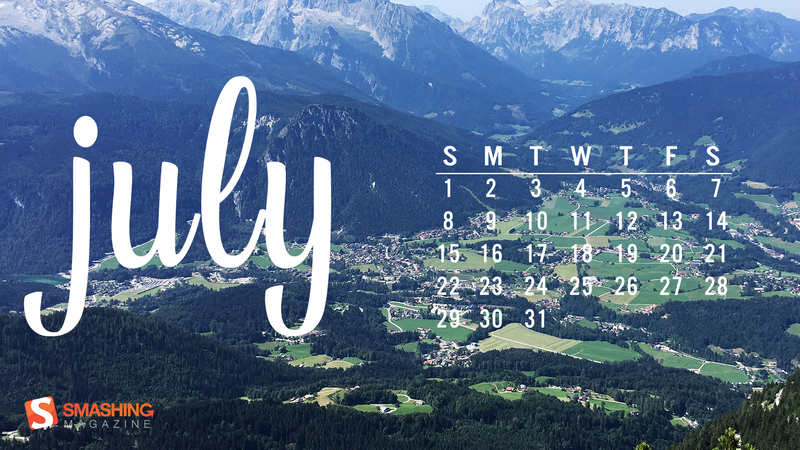 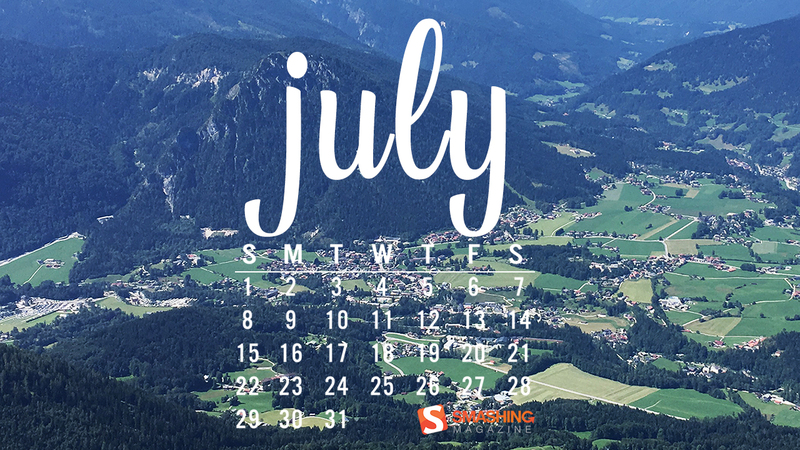 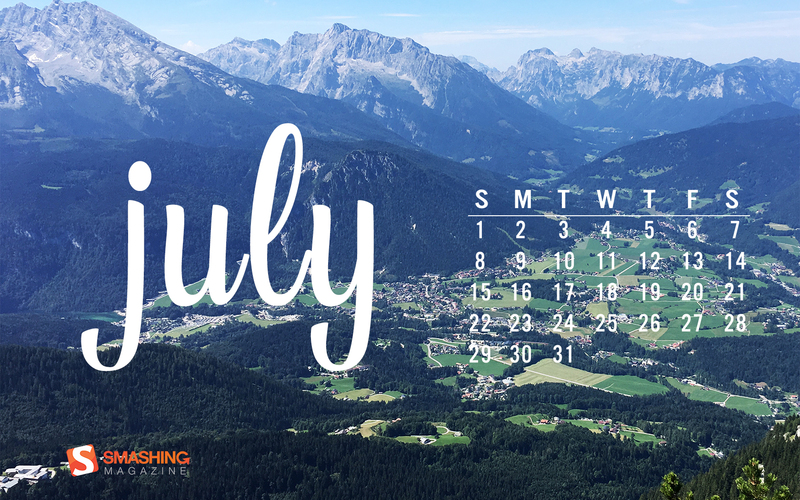 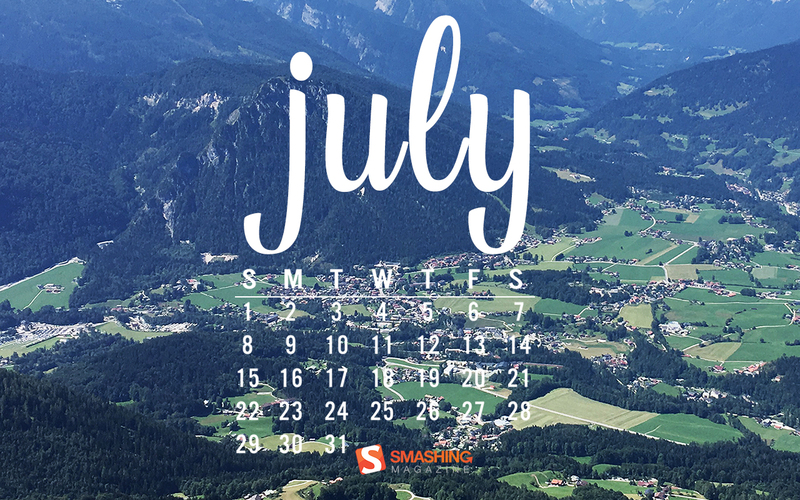 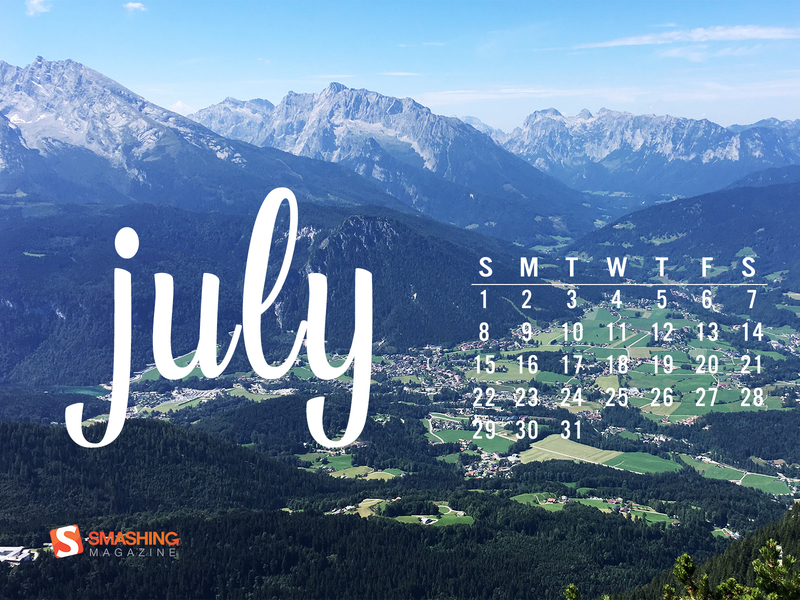 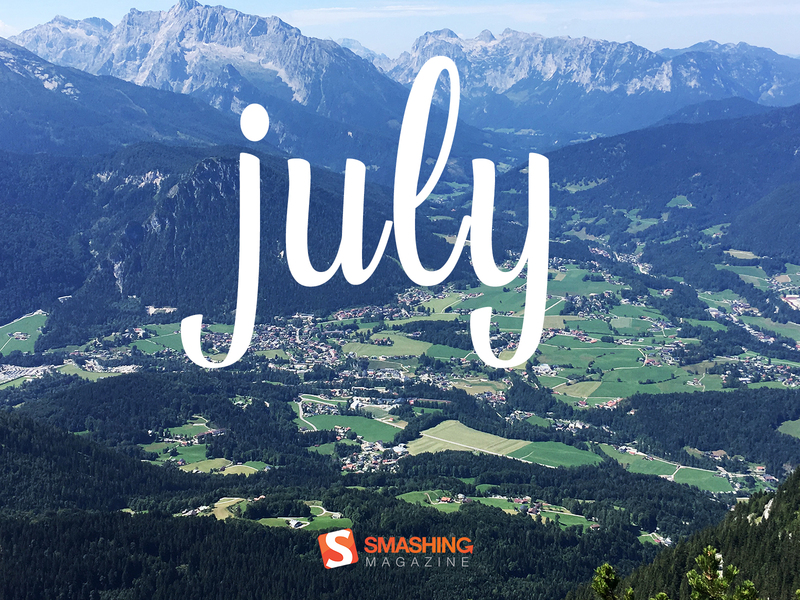 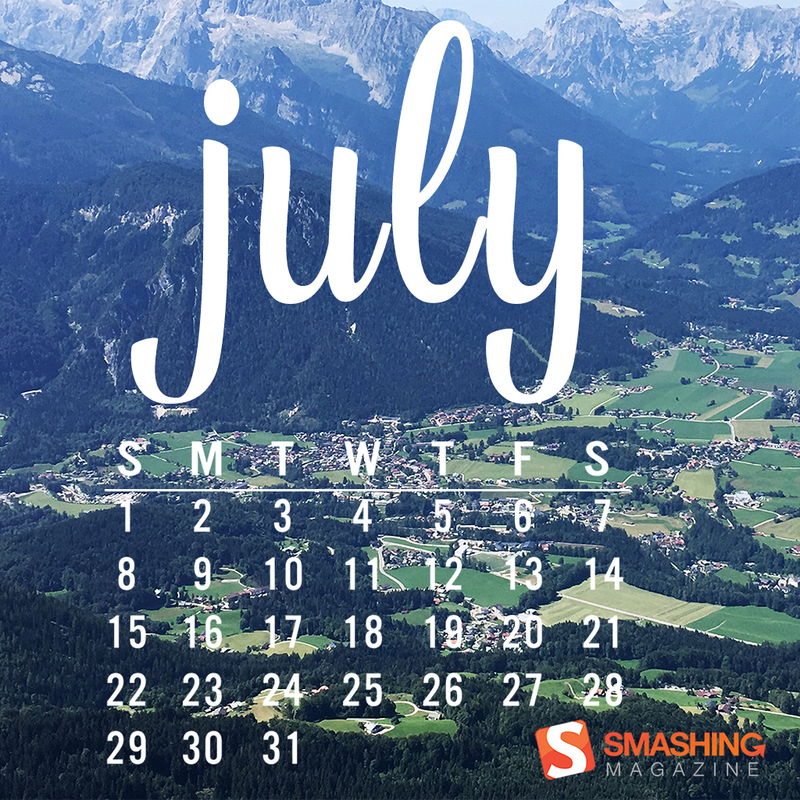 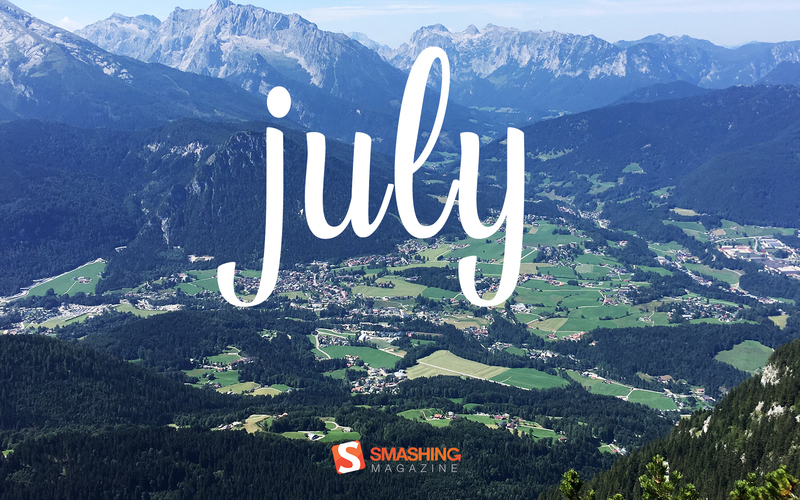 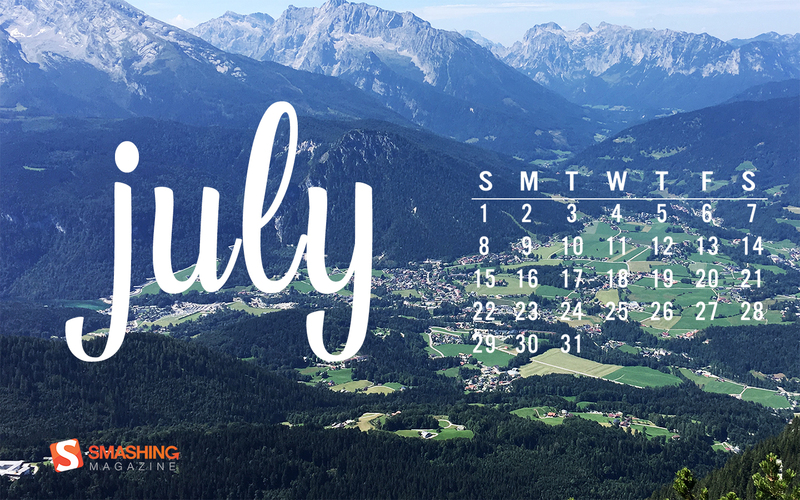 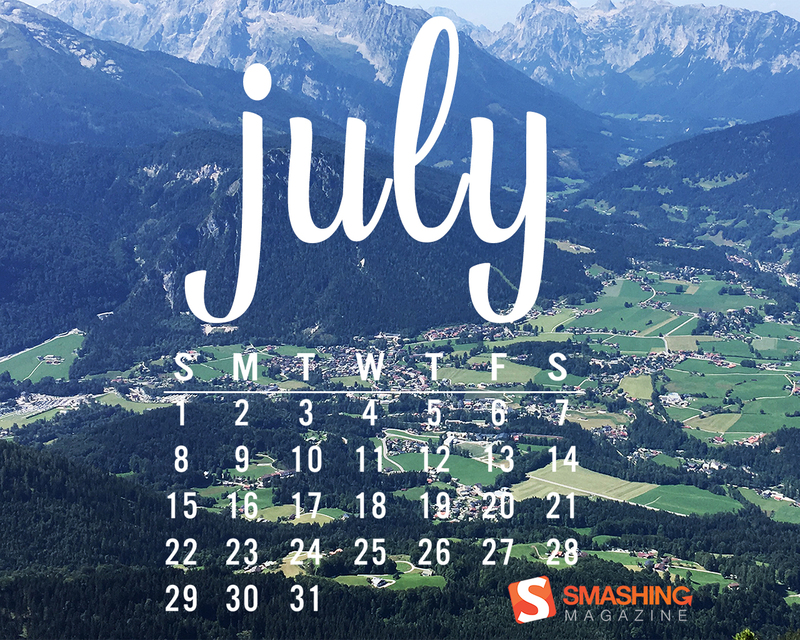 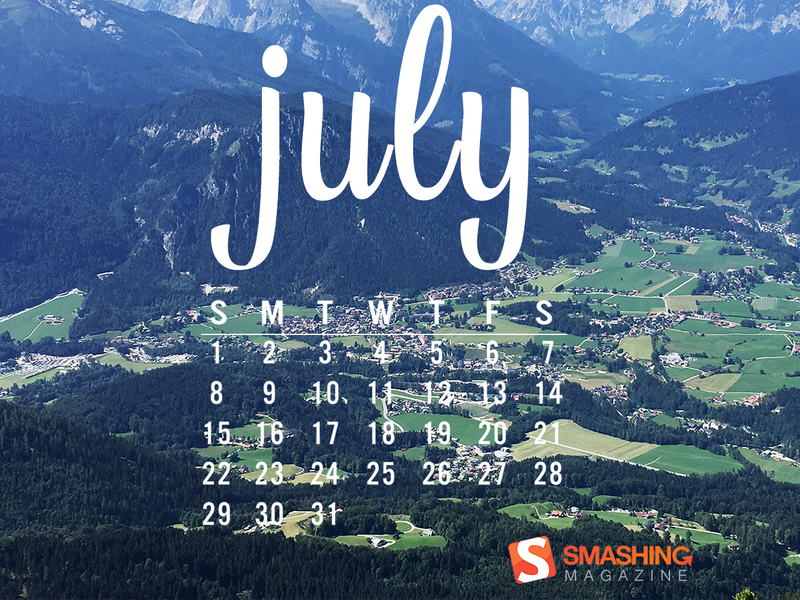 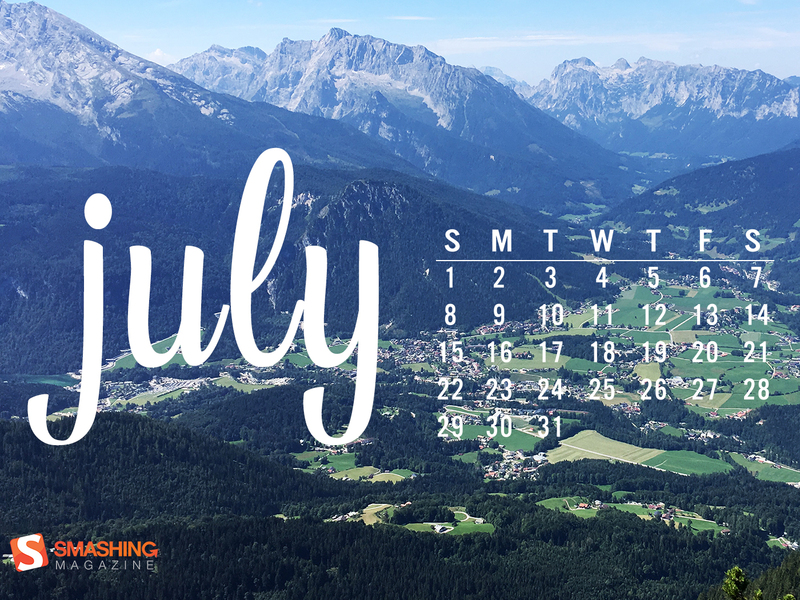 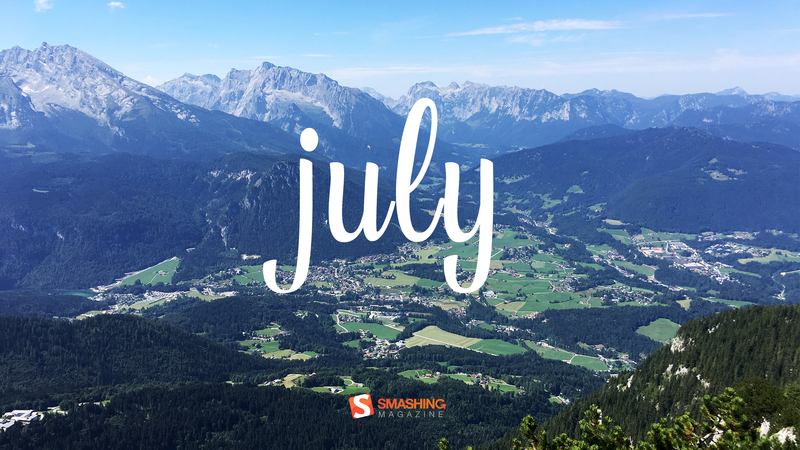 Have a great July — no matter what you have planned! 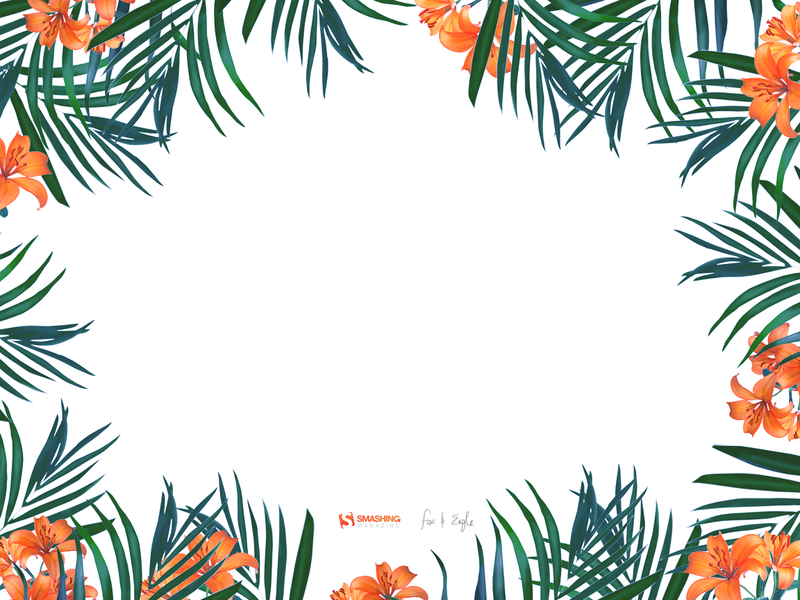 Warm summer weather inspired the color palette. — Designed by Marijana Pivac from Croatia. 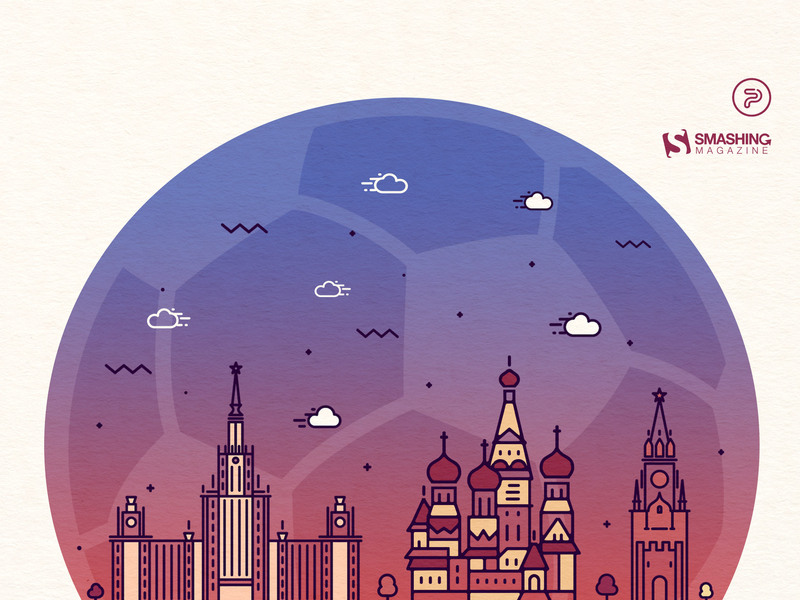 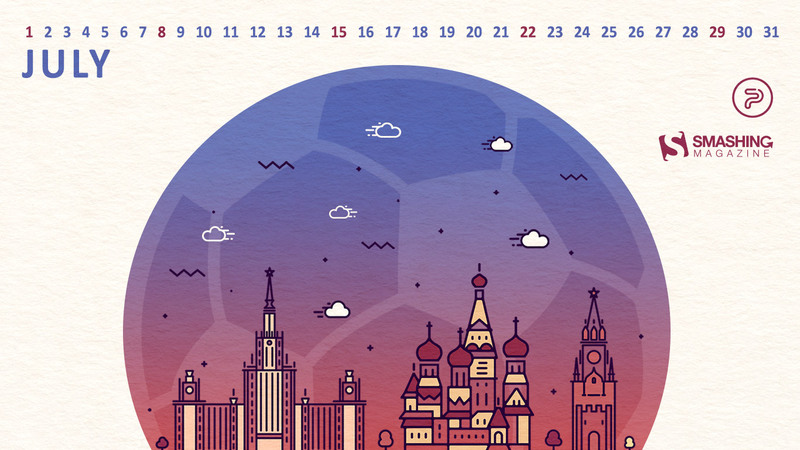 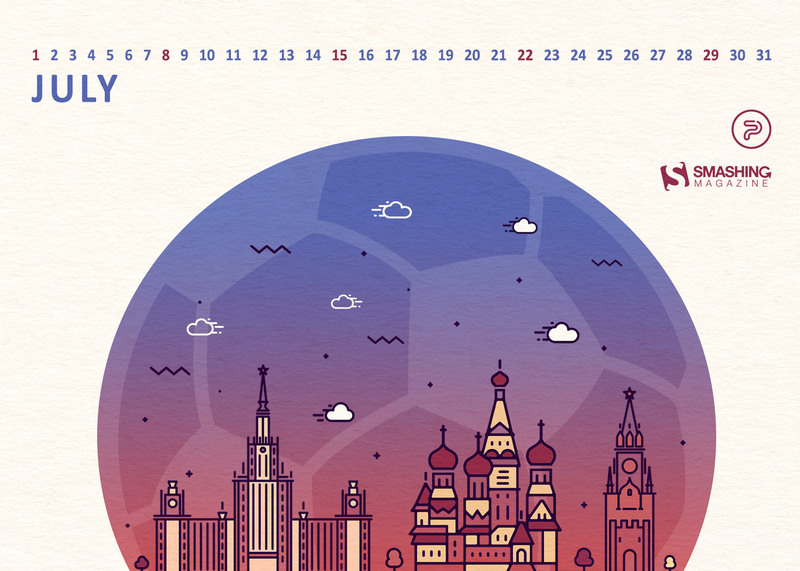 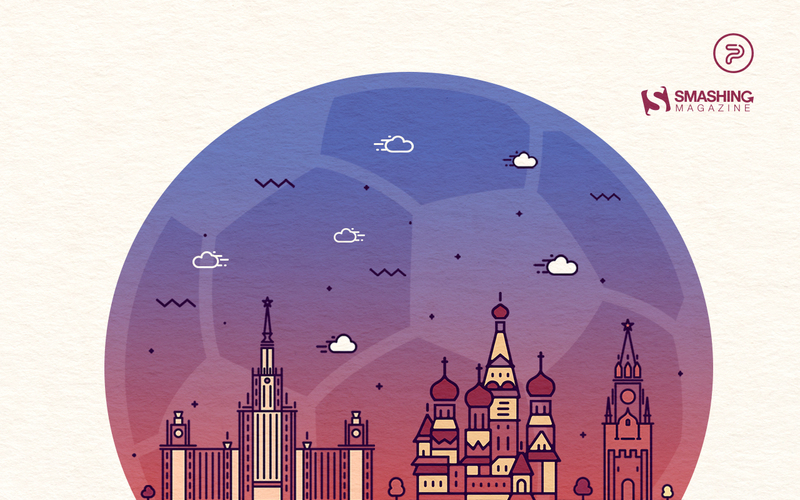 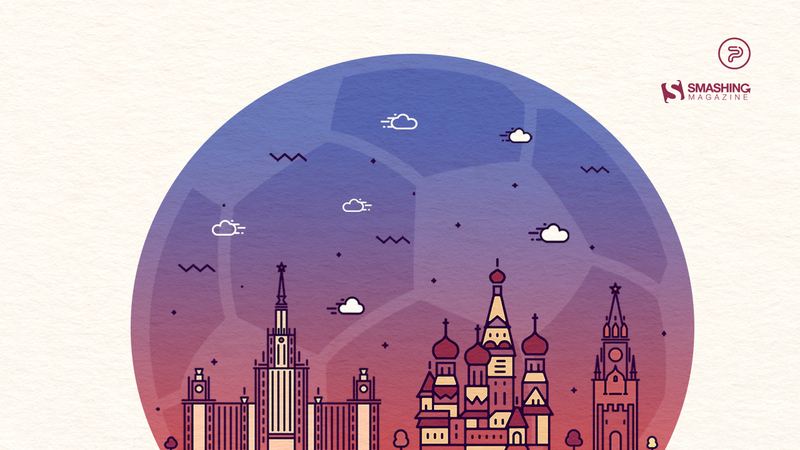 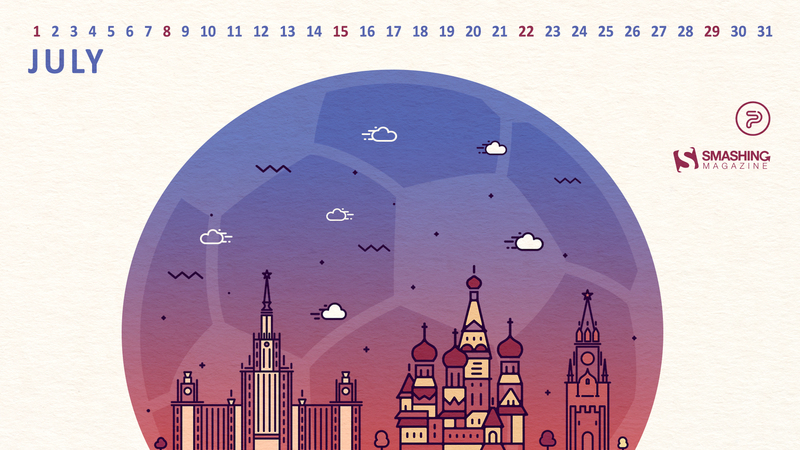 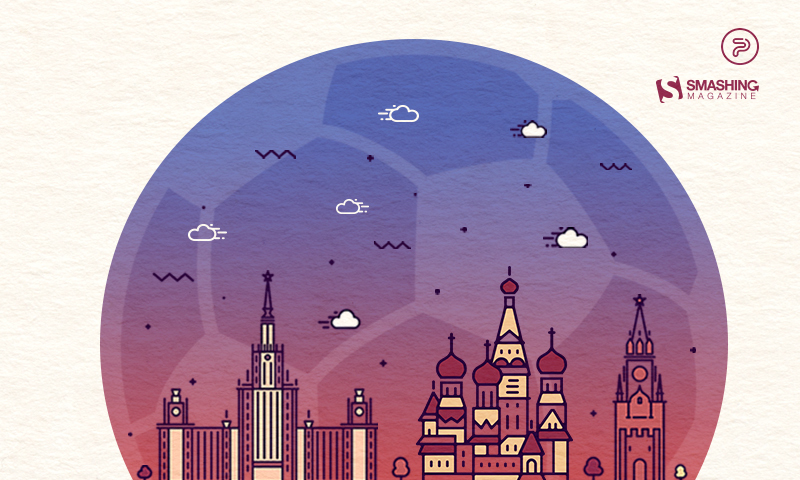 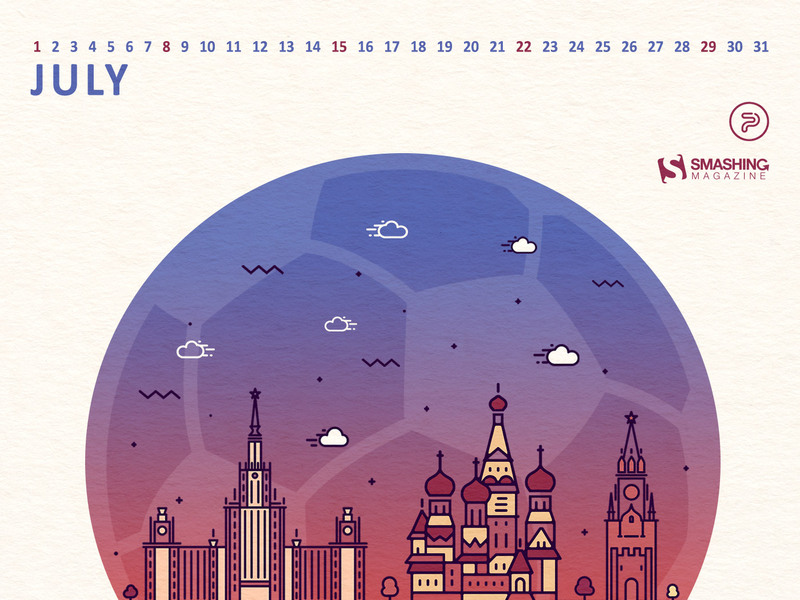 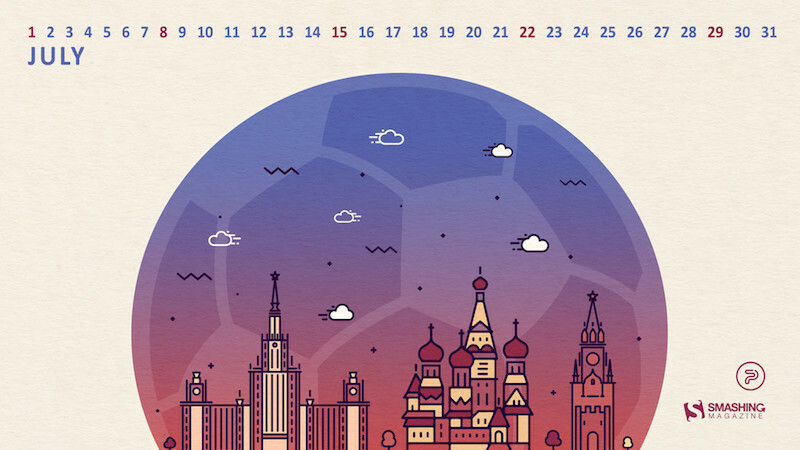 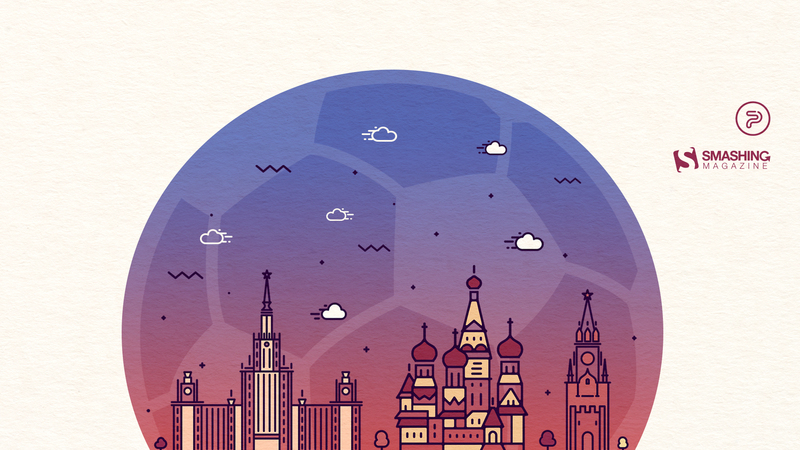 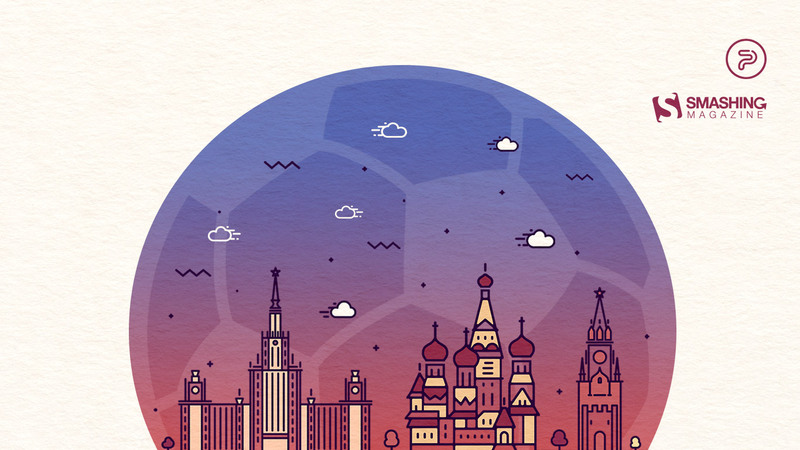 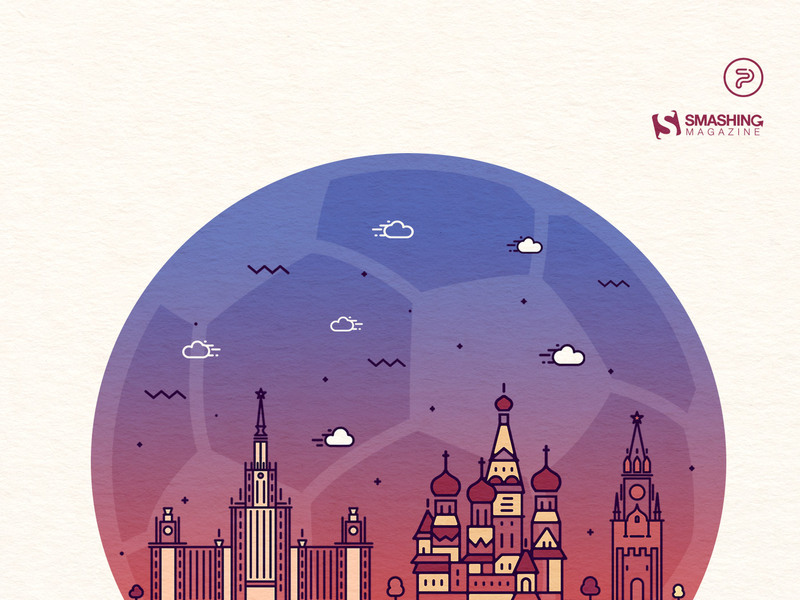 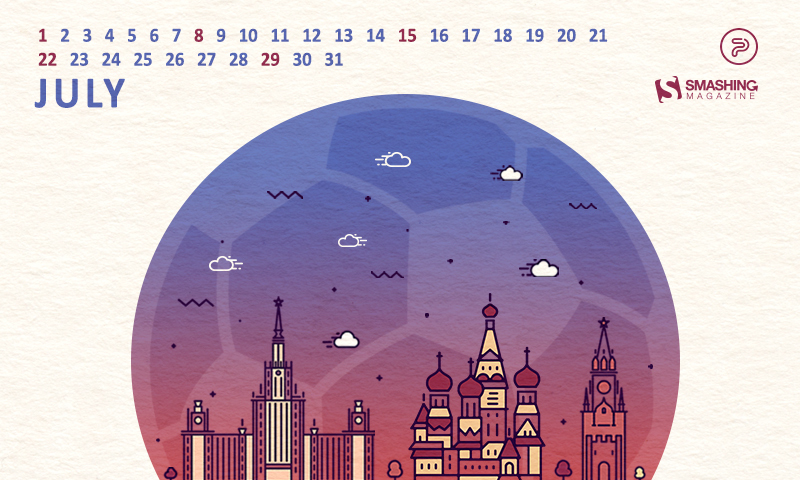 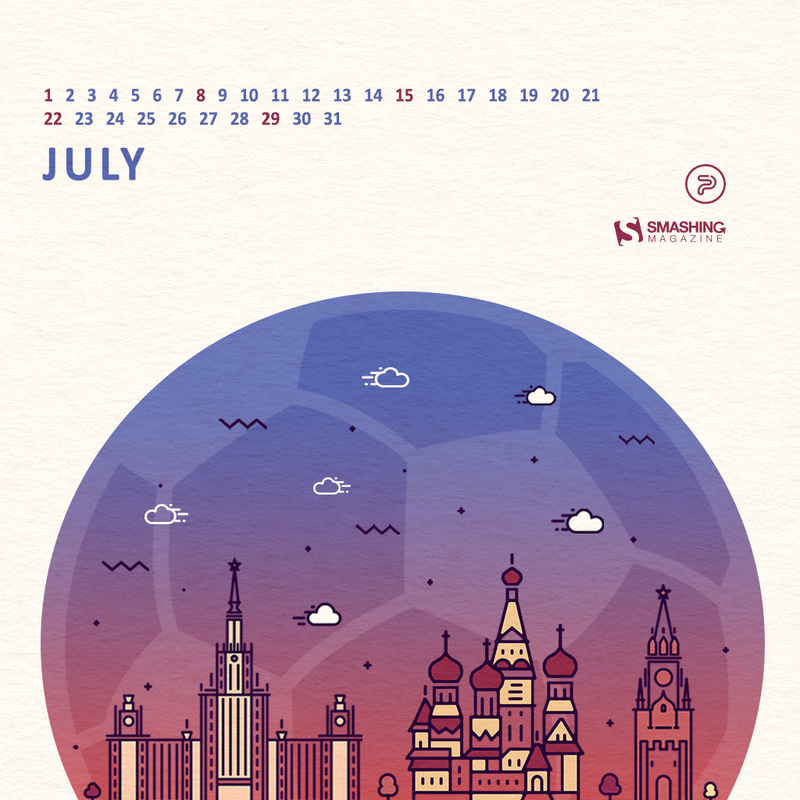 This summer started out hot, with eyes wide open and monitoring the World Cup in Russia. 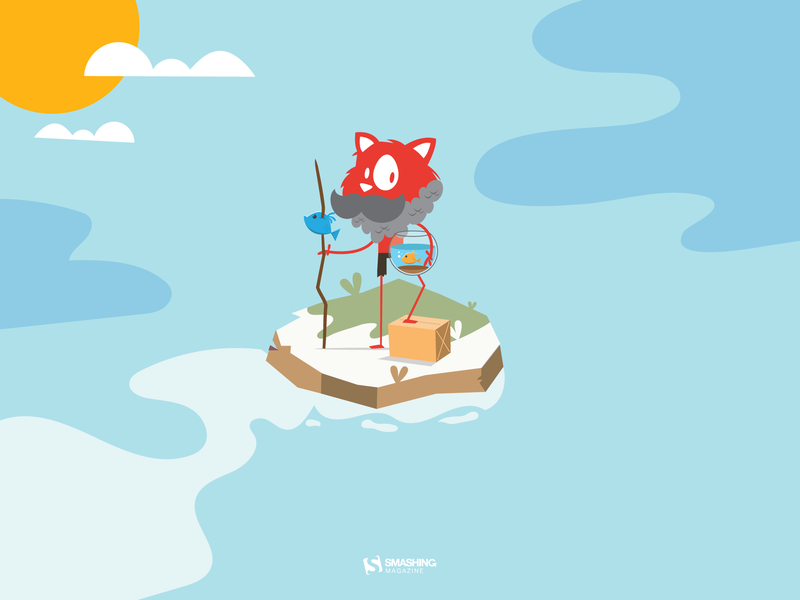 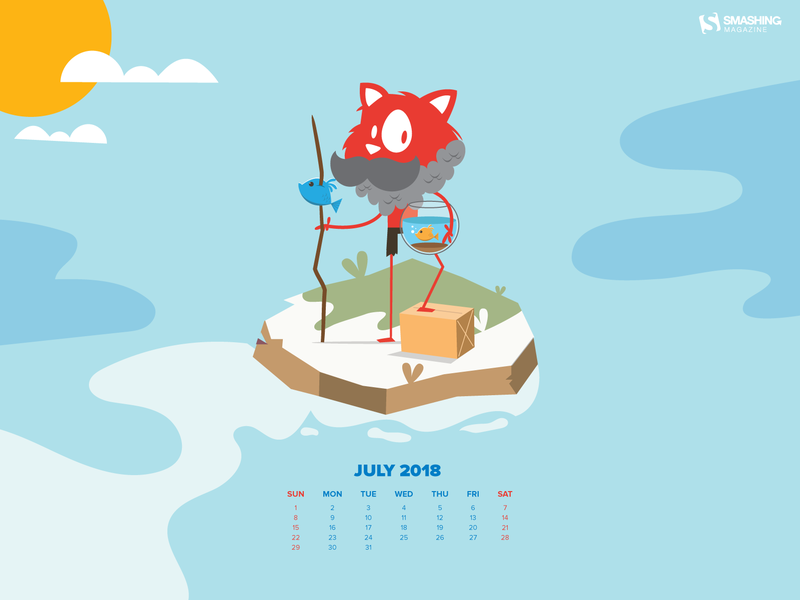 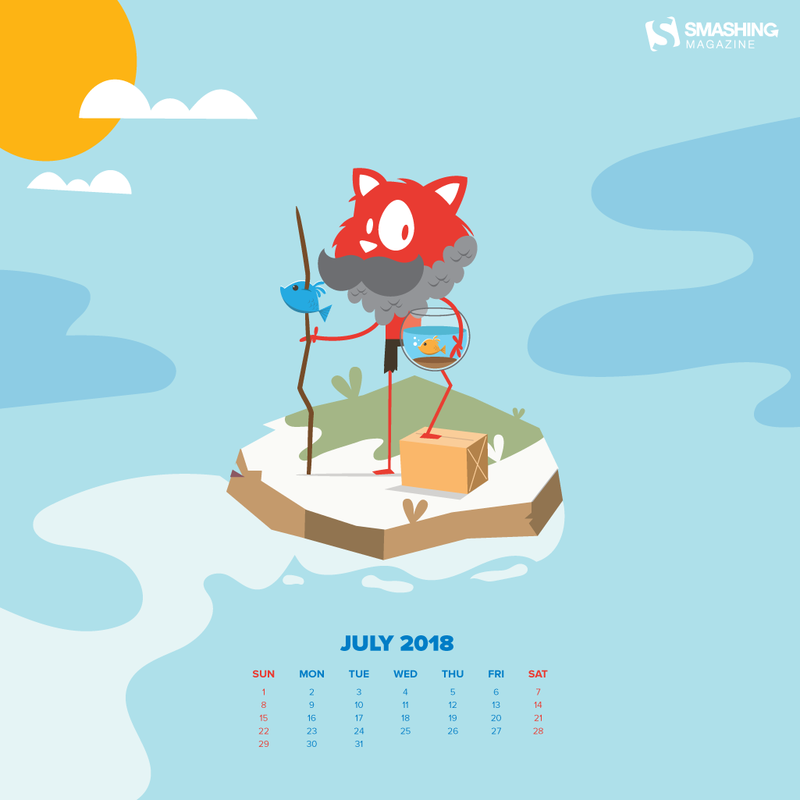 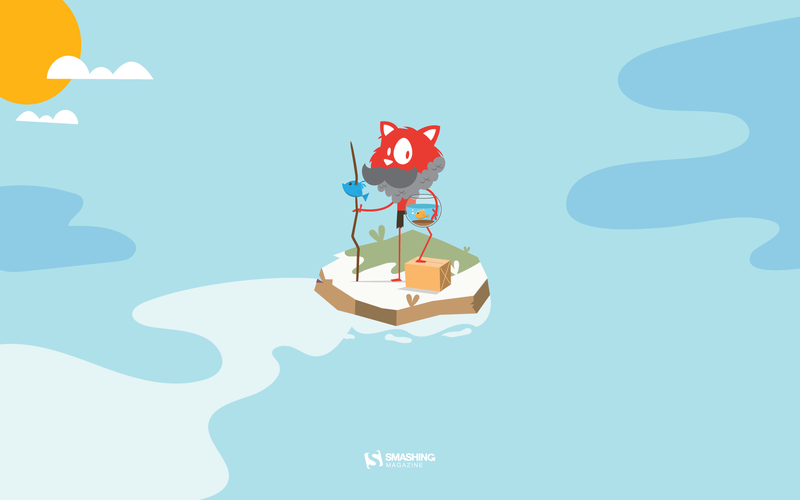 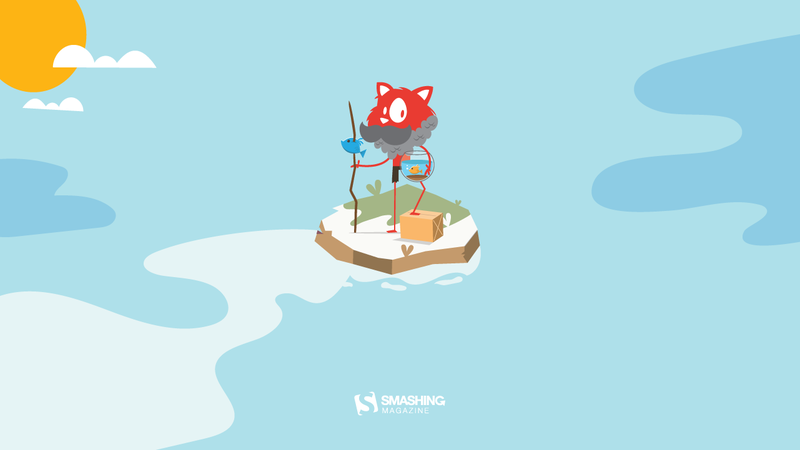 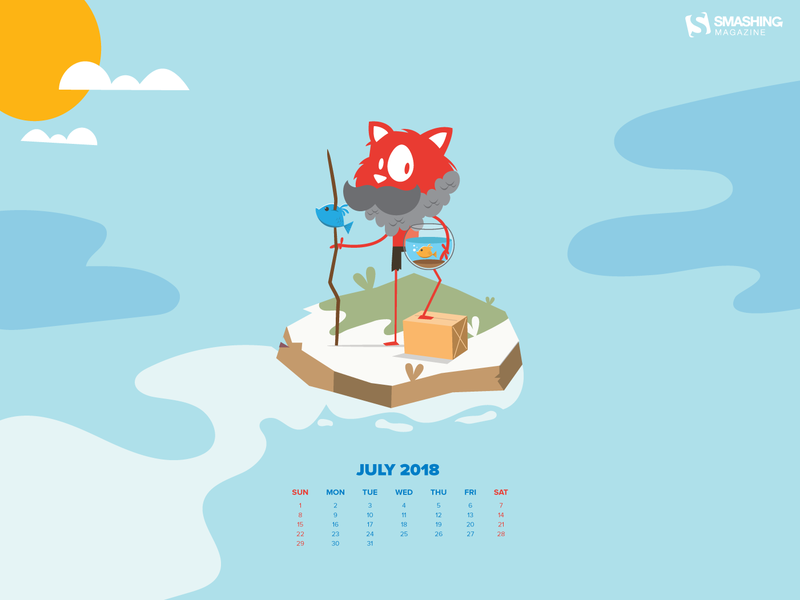 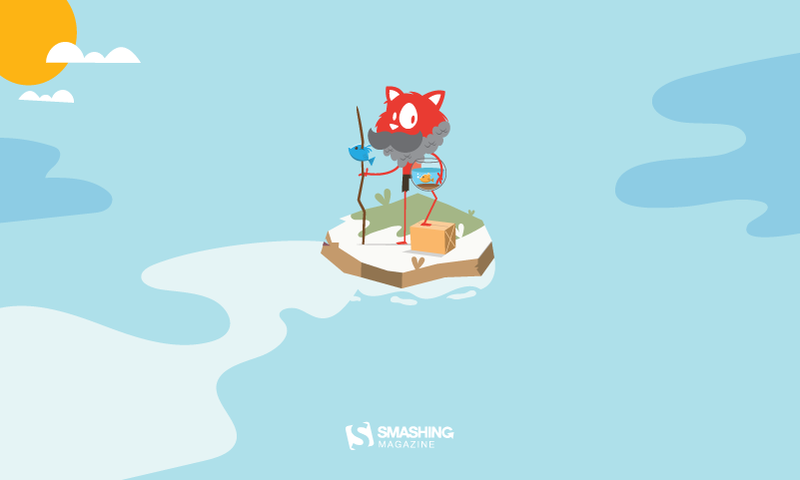 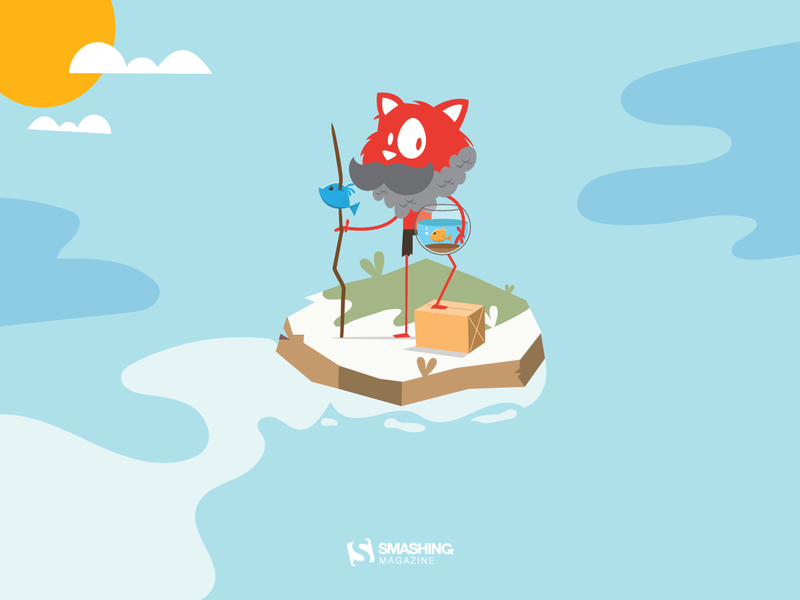 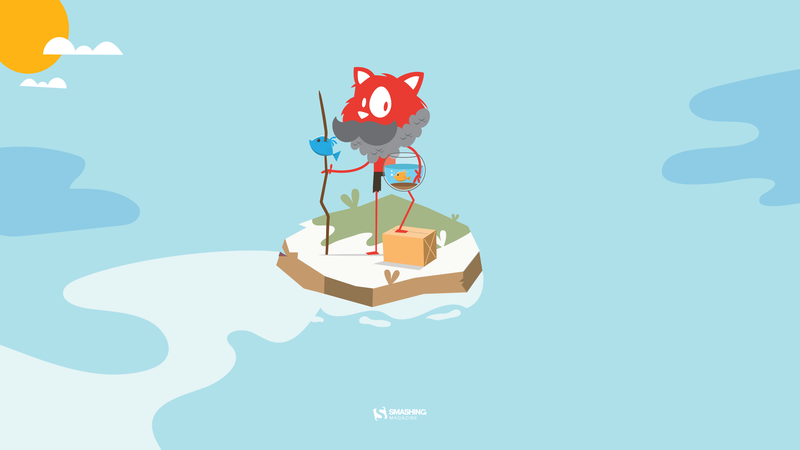 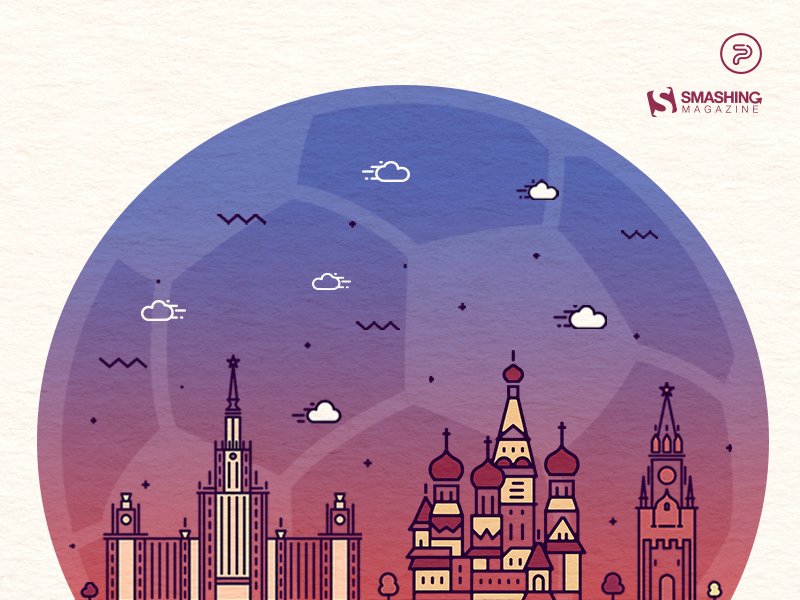 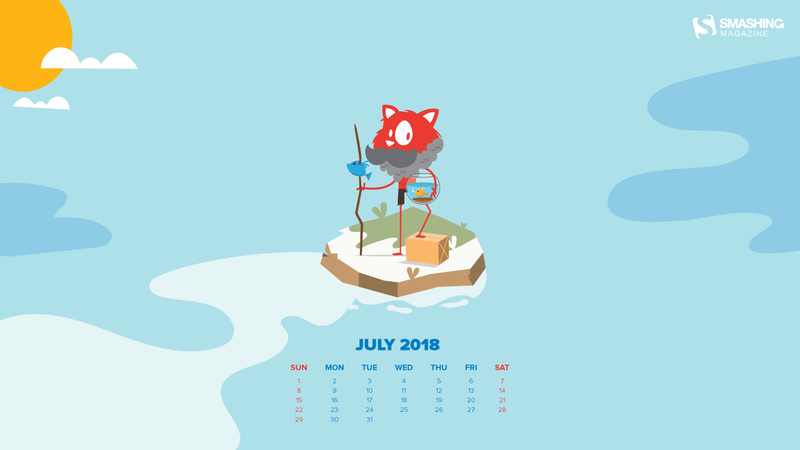 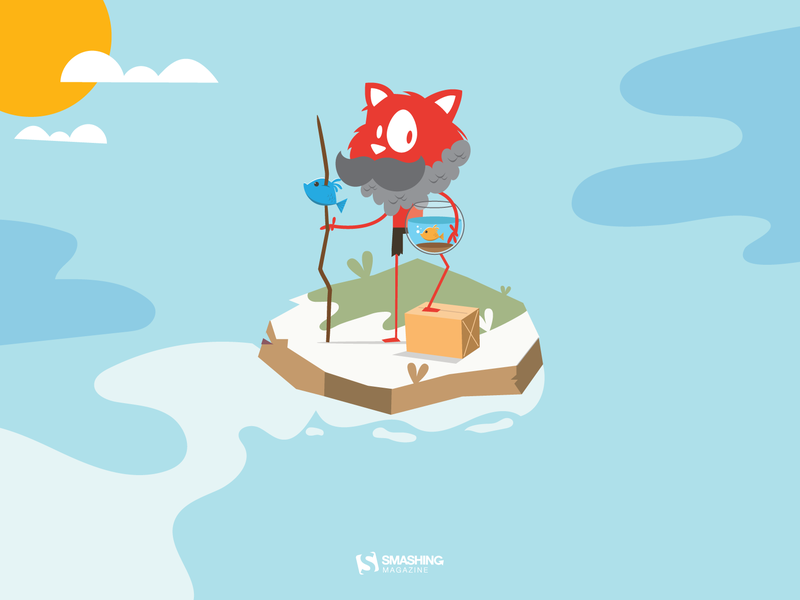 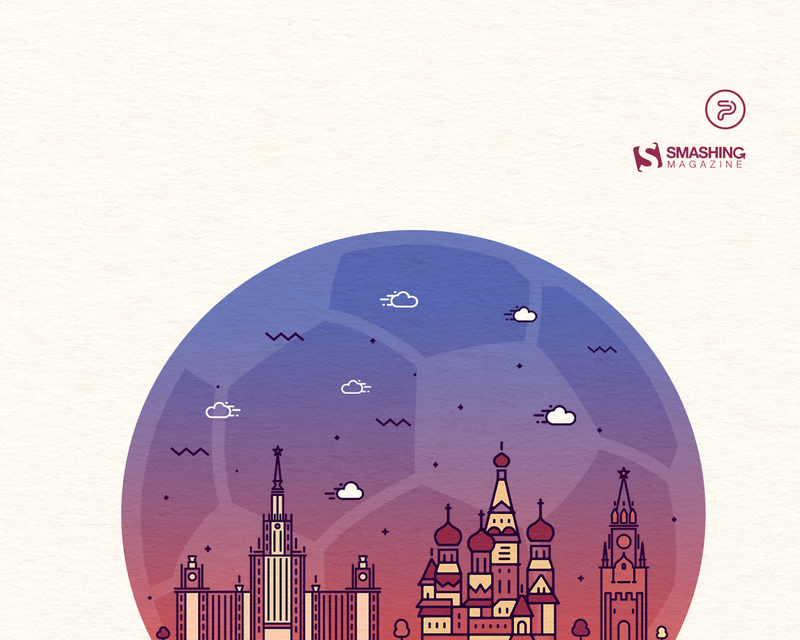 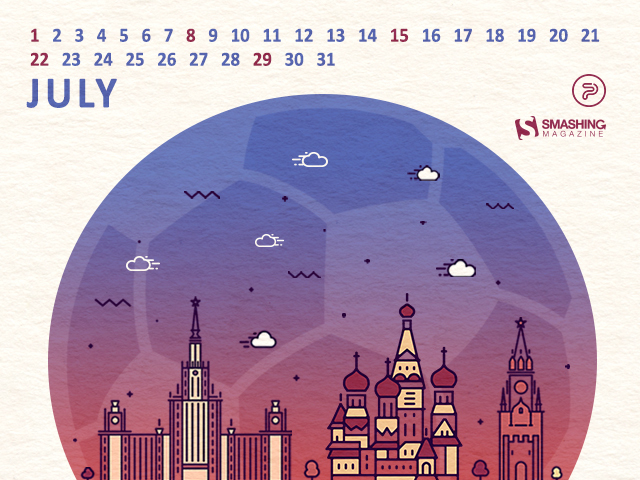 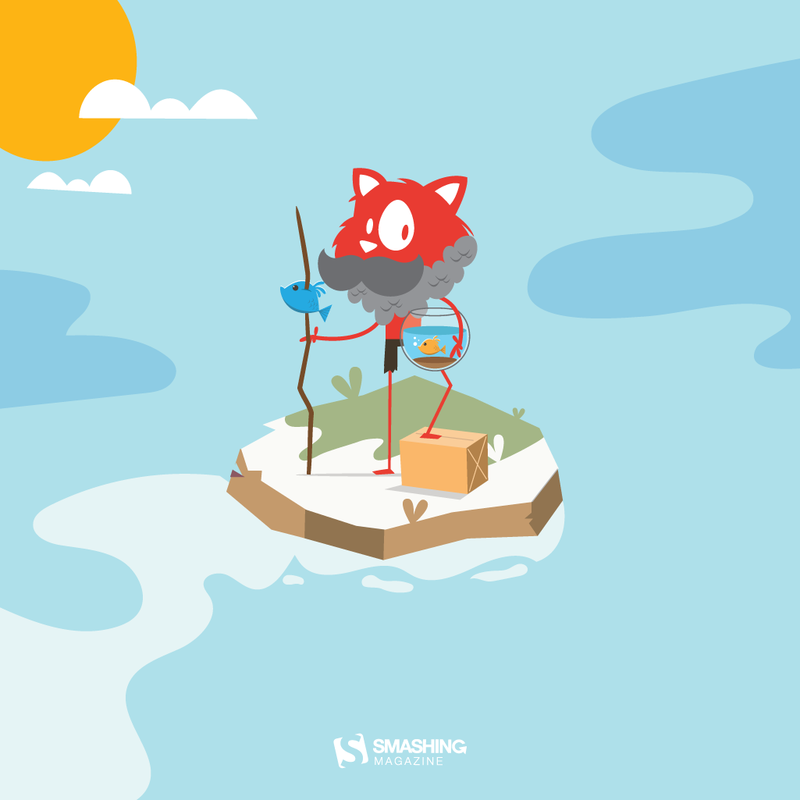 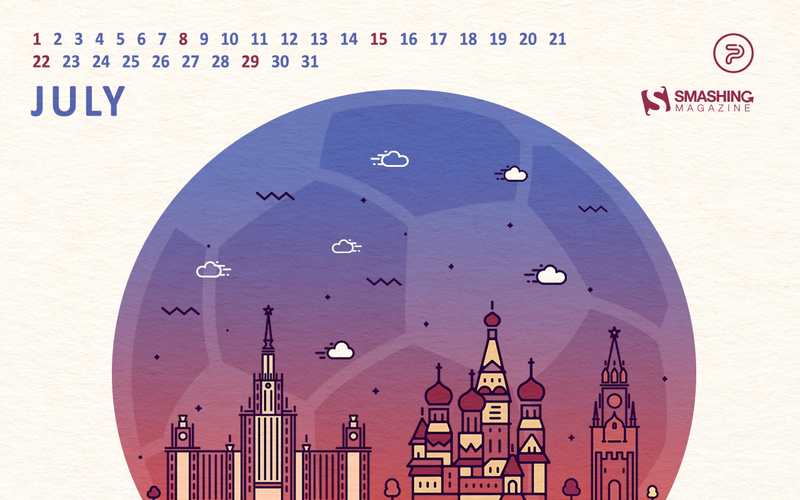 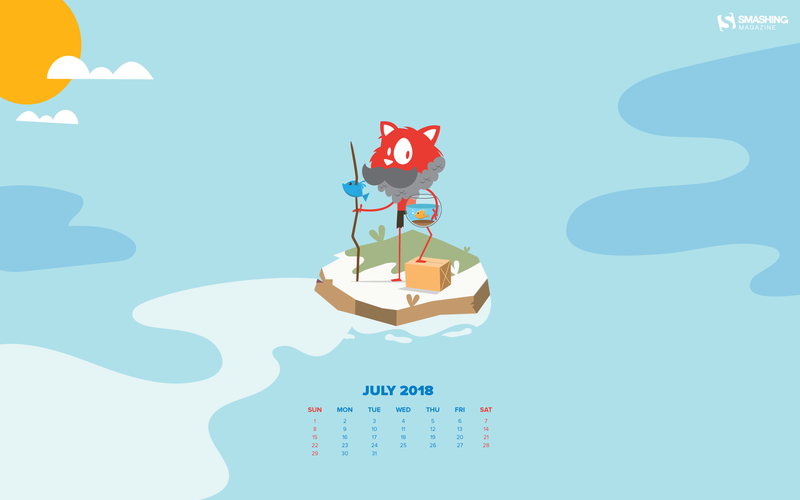 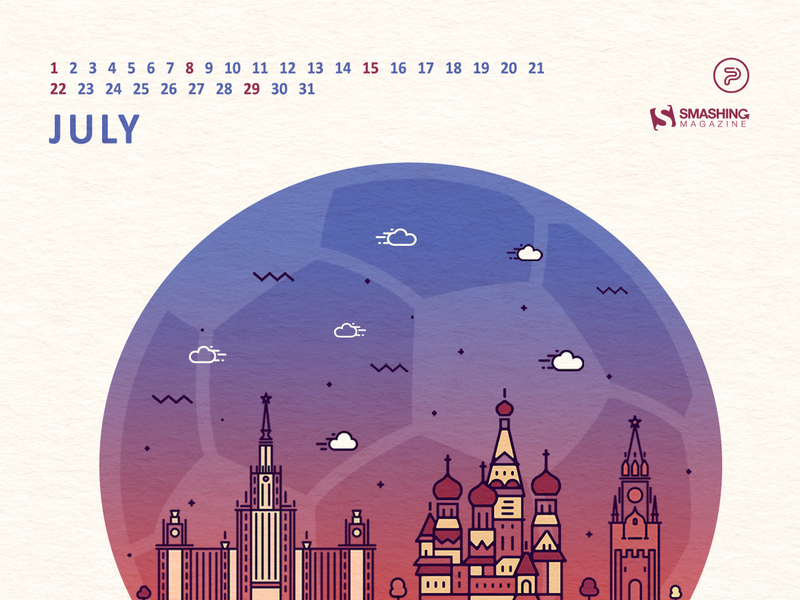 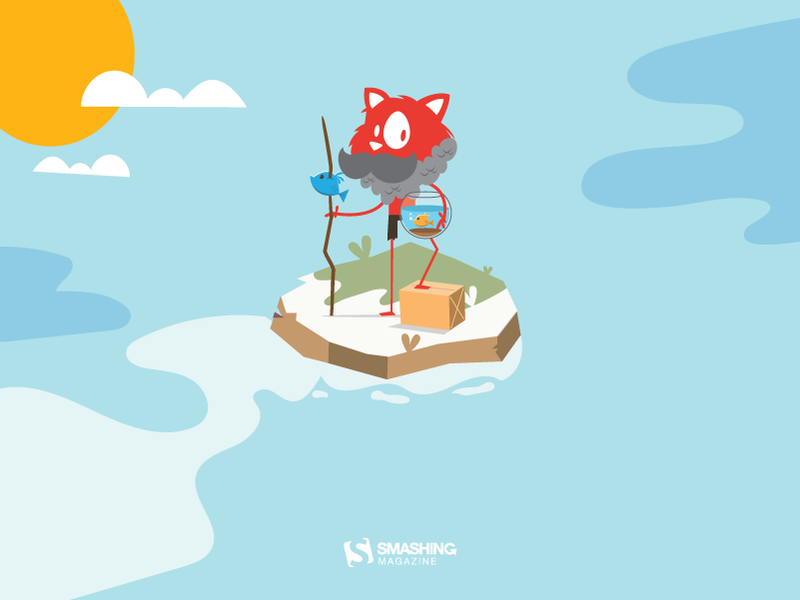 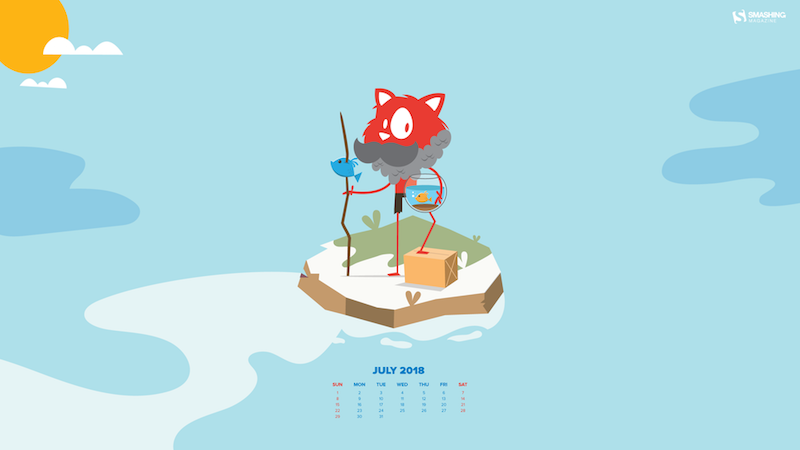 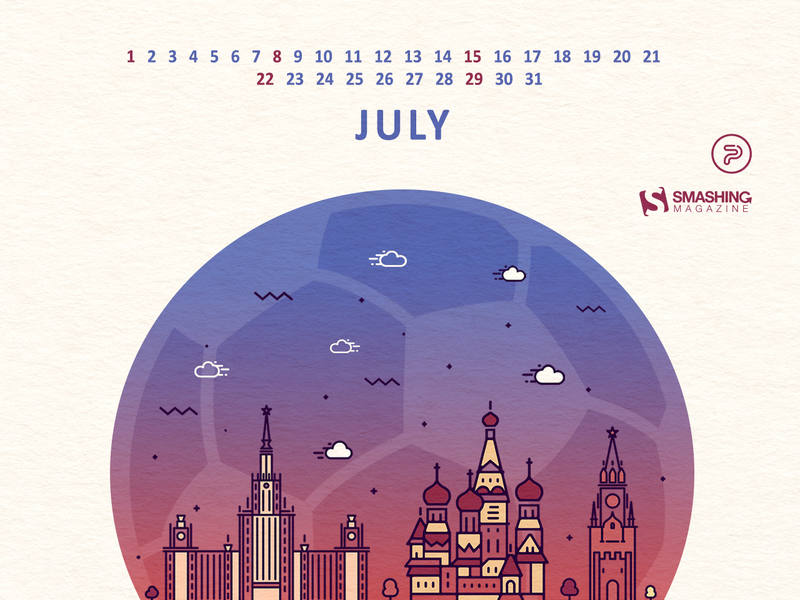 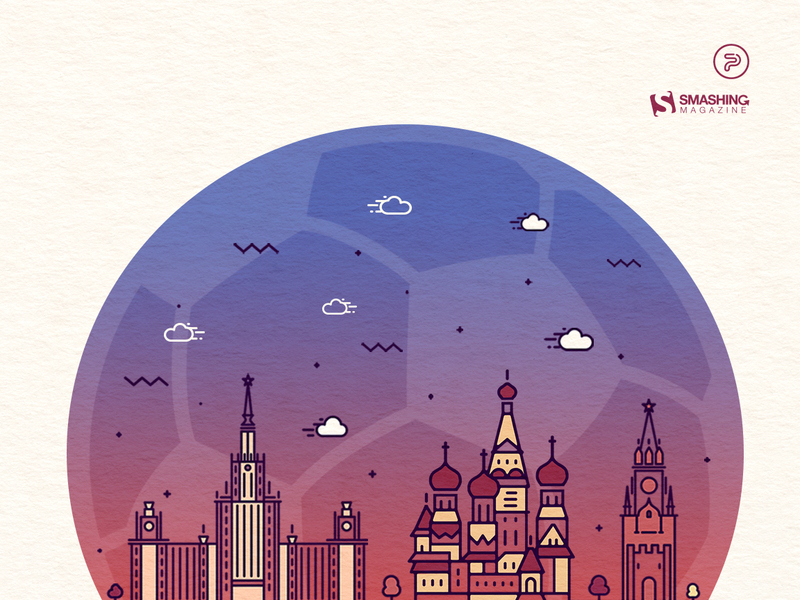 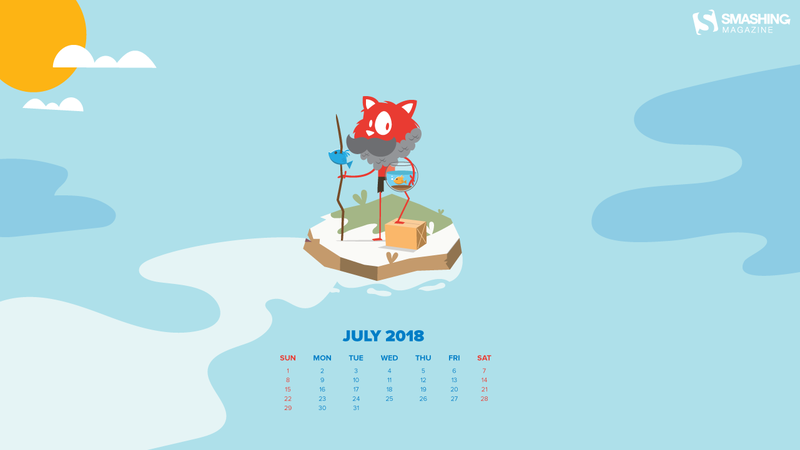 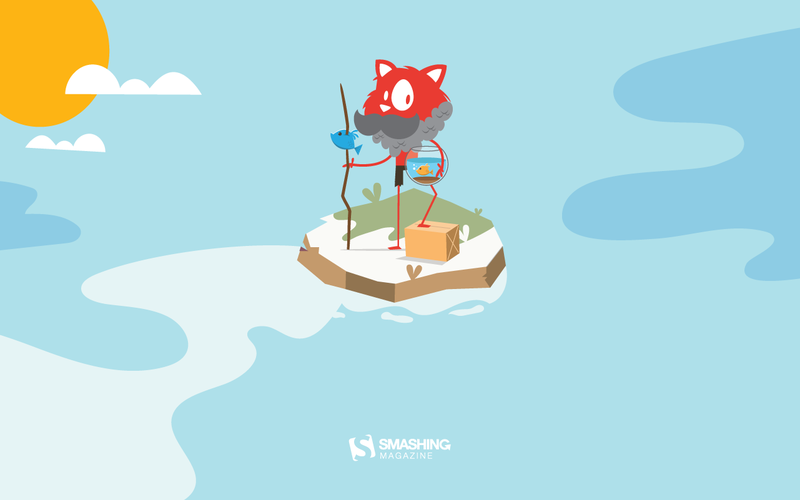 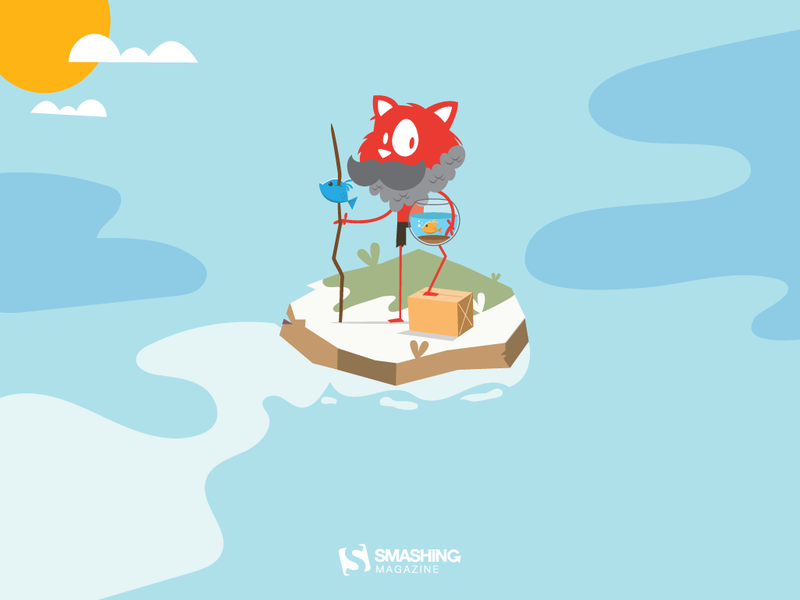 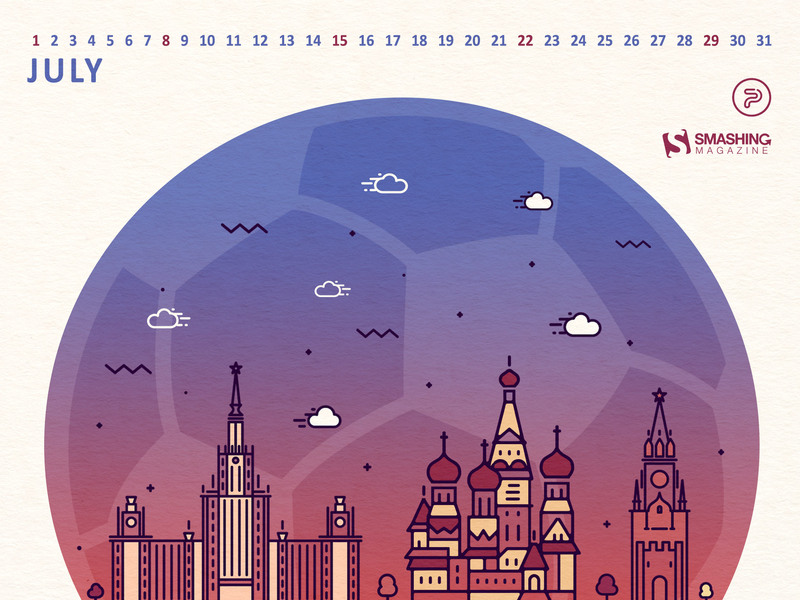 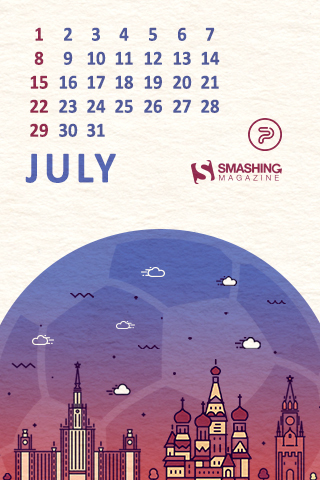 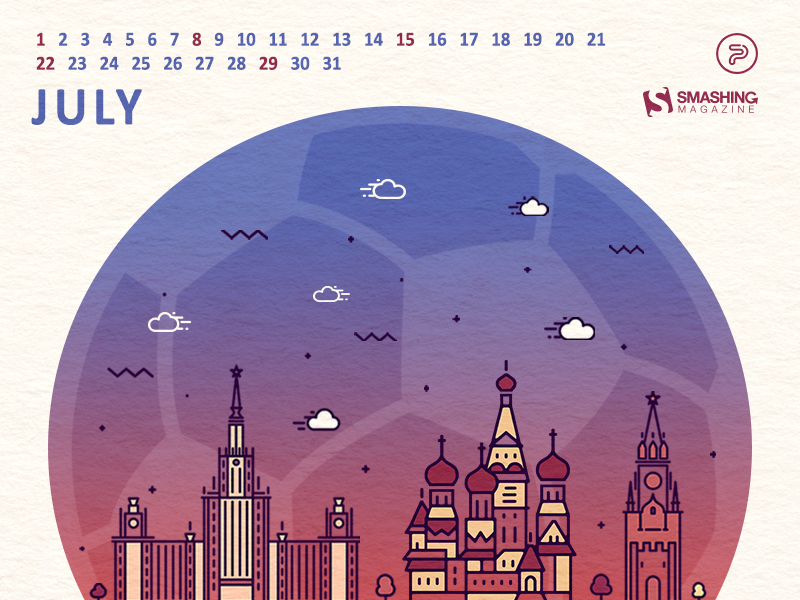 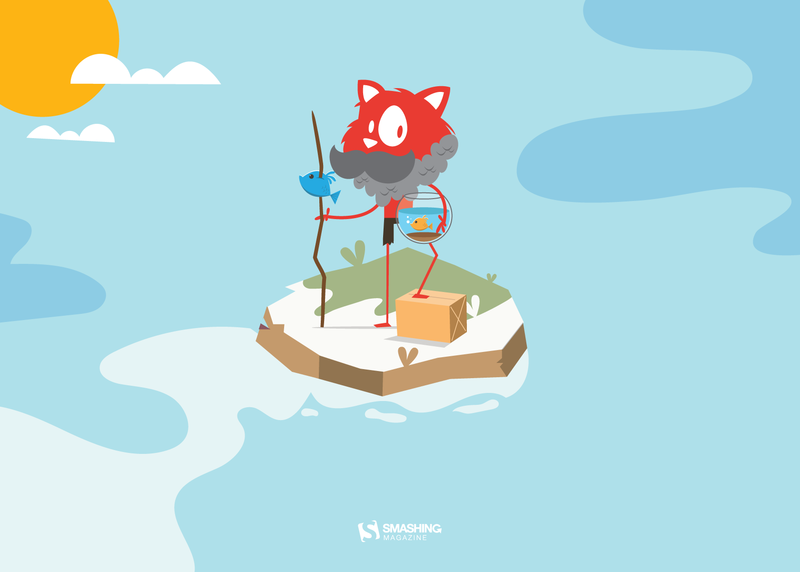 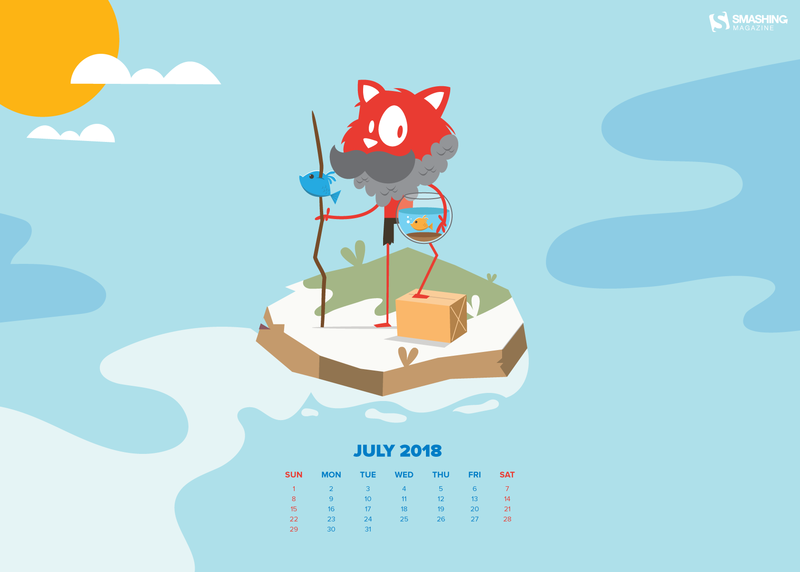 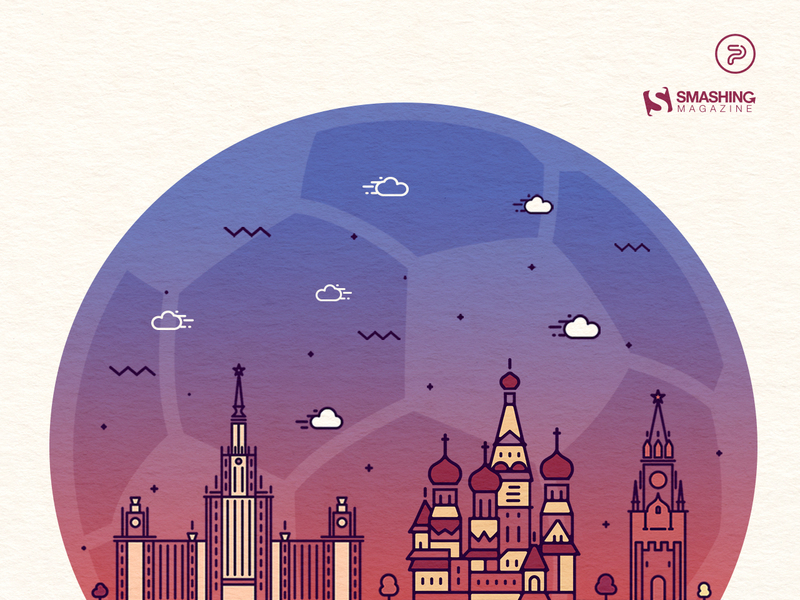 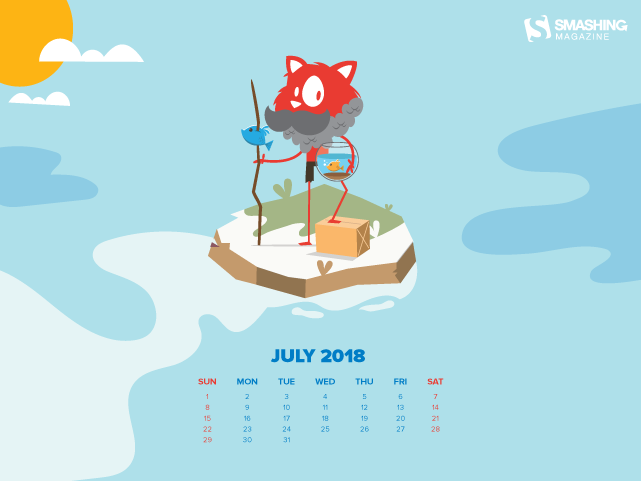 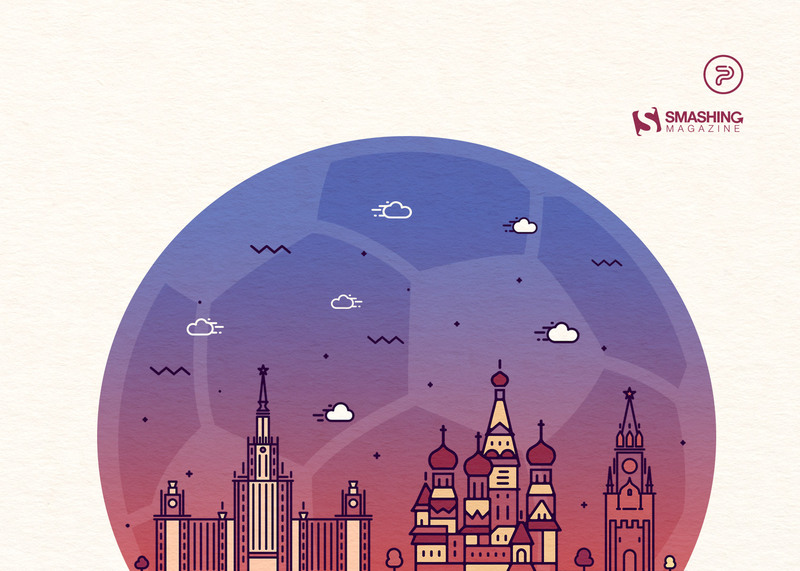 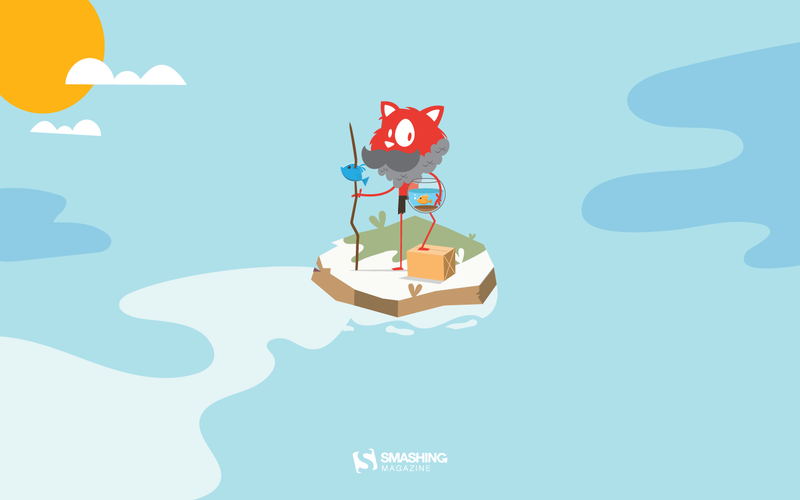 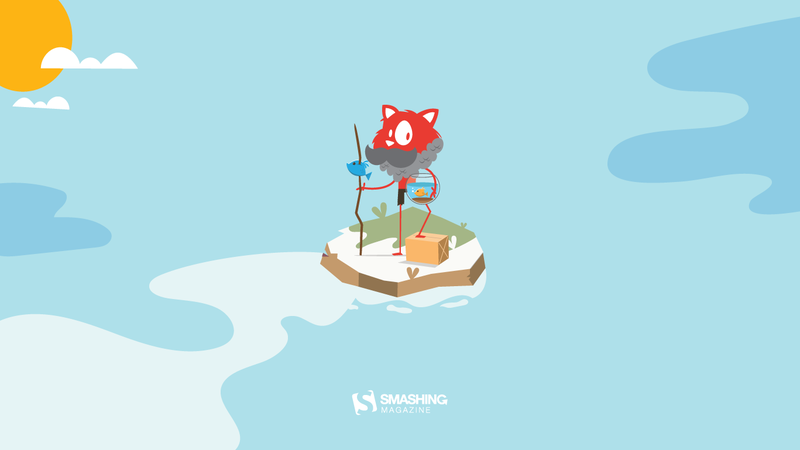 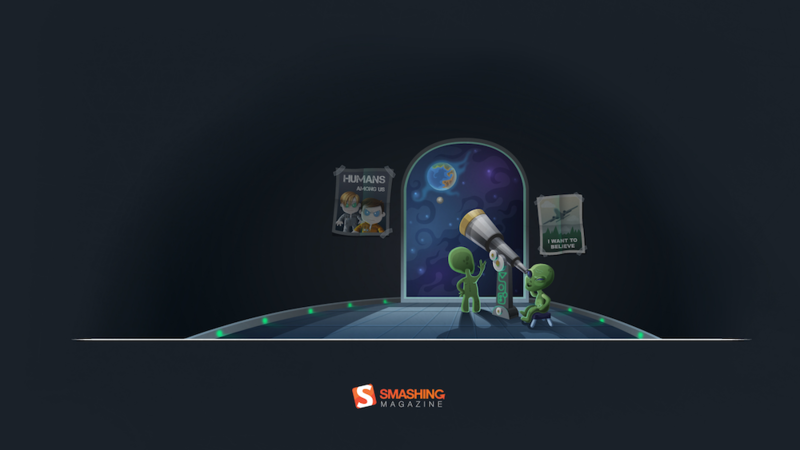 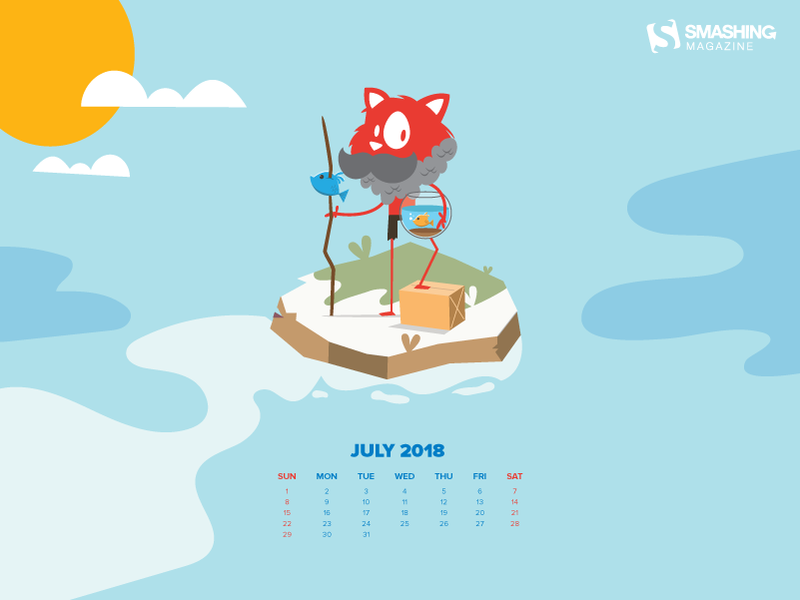 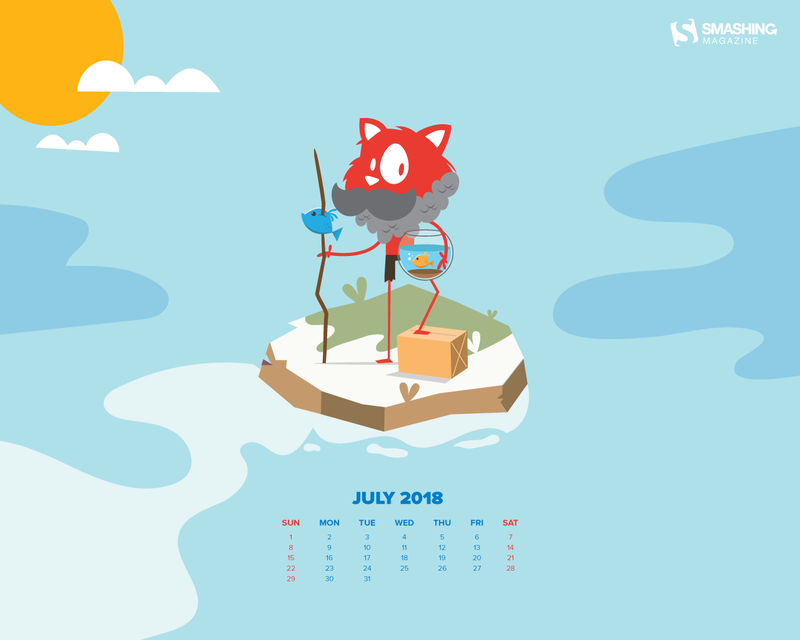 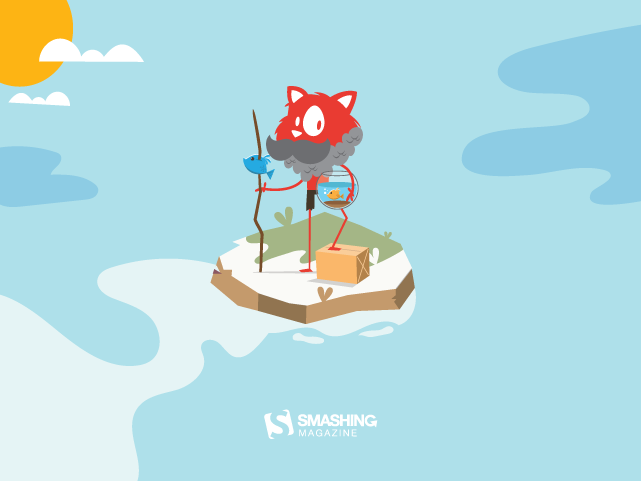 We wanted to decorate your desktop this July with this colorful Red Square illustration, just before the eagerly anticipated finale, hoping to see the trophy awarded to our players. — Designed by PopArt Studio from Serbia. July is National Ice Cream Month! National Ice Cream Day is celebrated on the 3rd Sunday in July. On this day people celebrate with a bowl, cup or cone filled with their favorite flavor of ice cream. 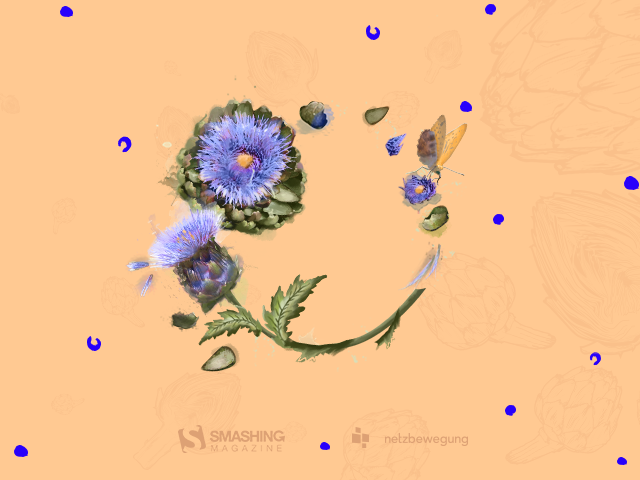 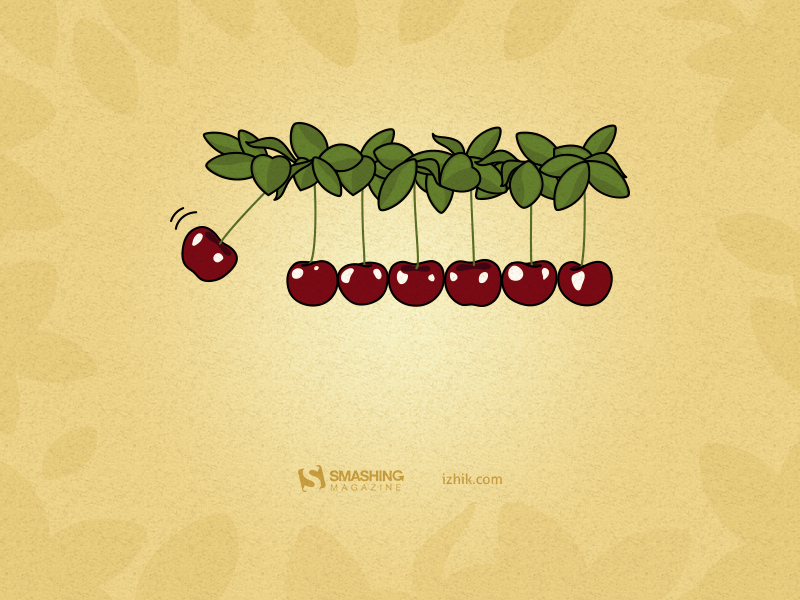 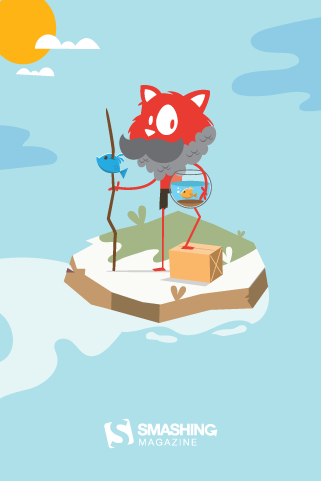 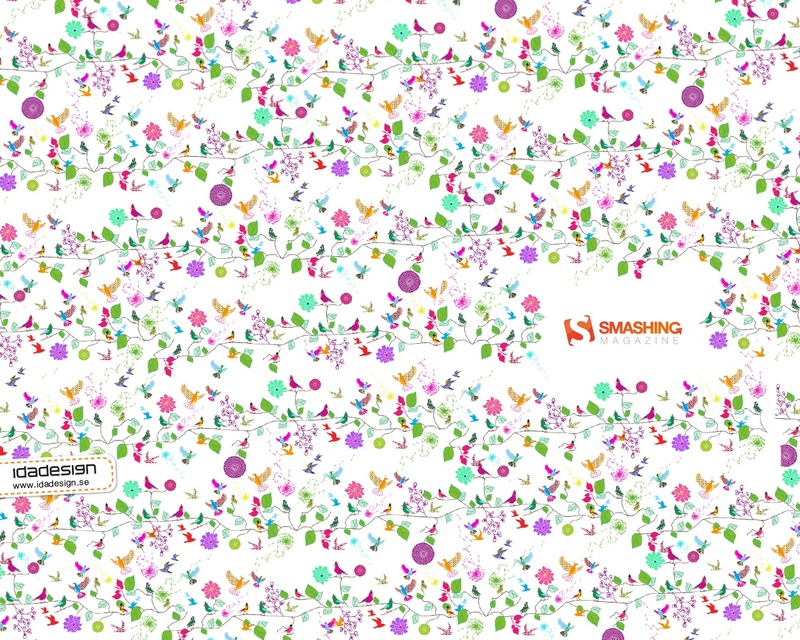 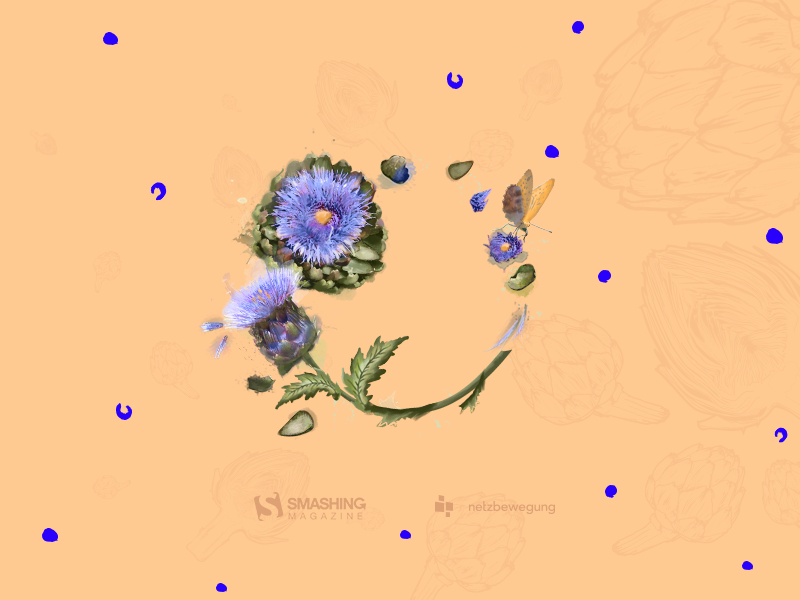 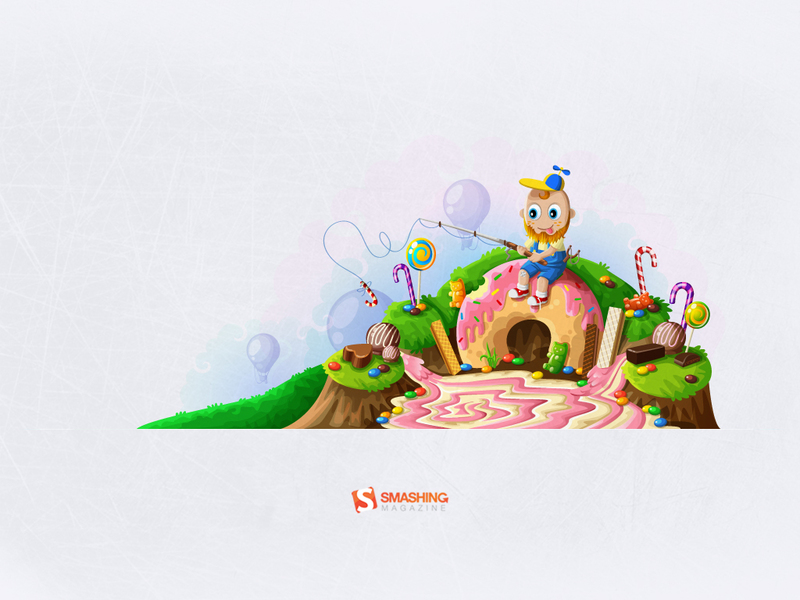 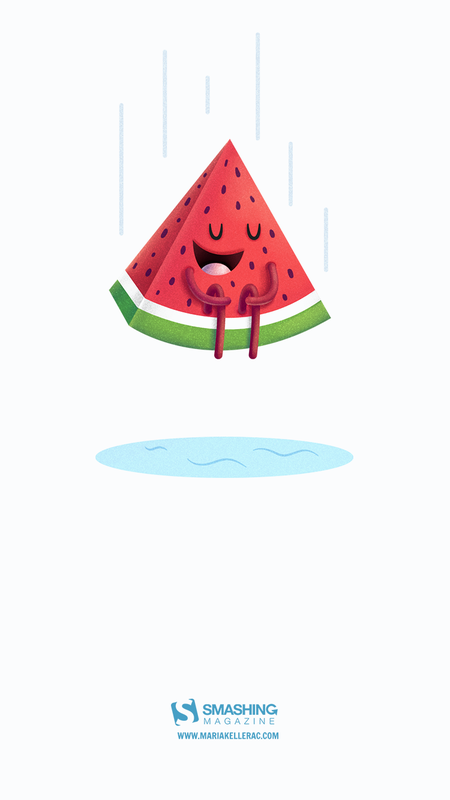 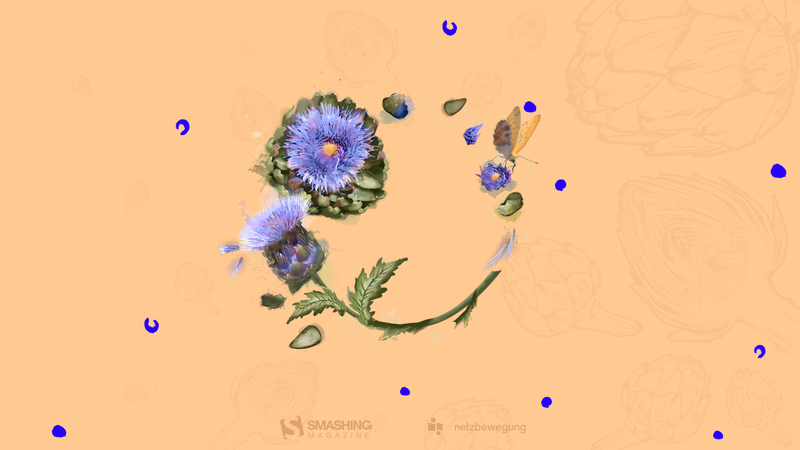 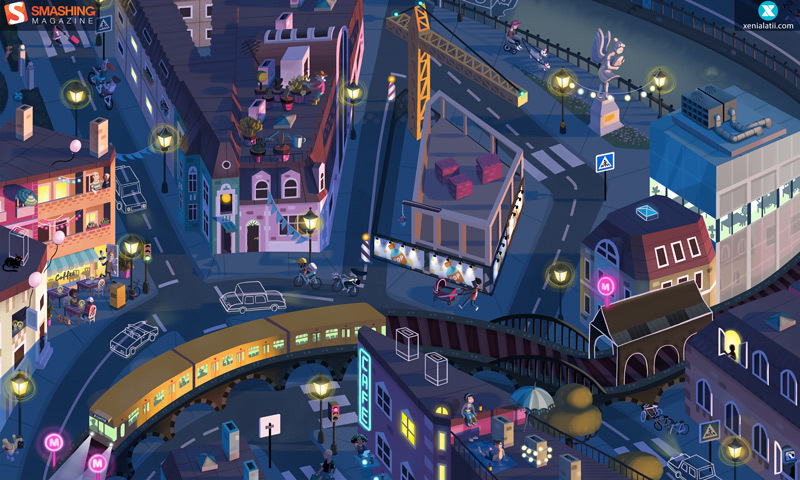 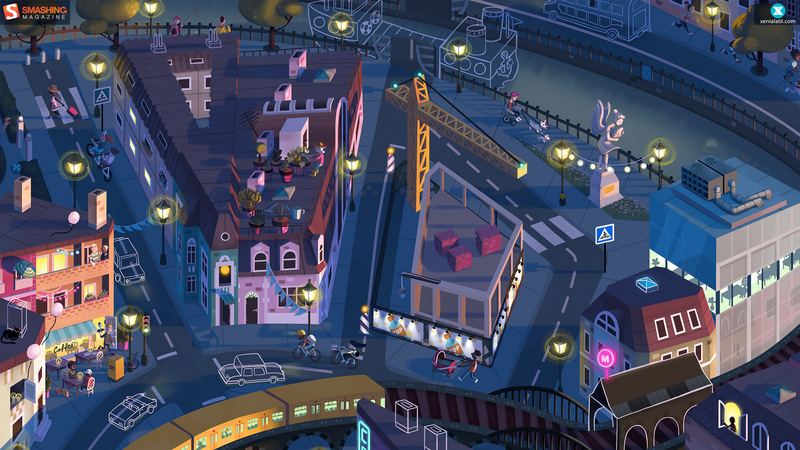 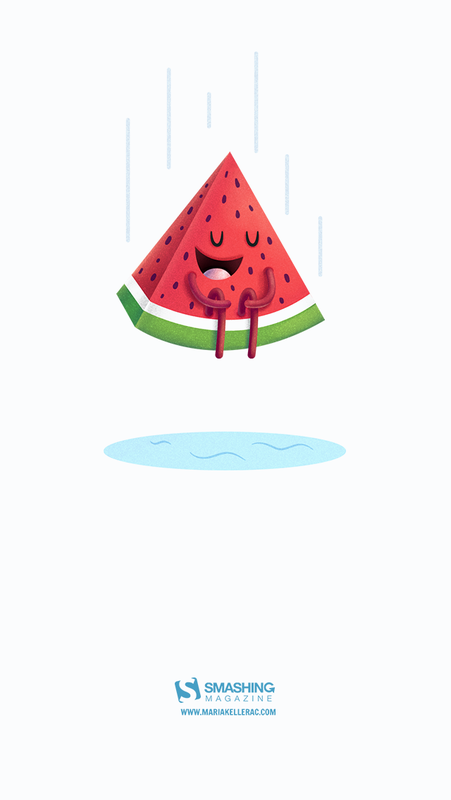 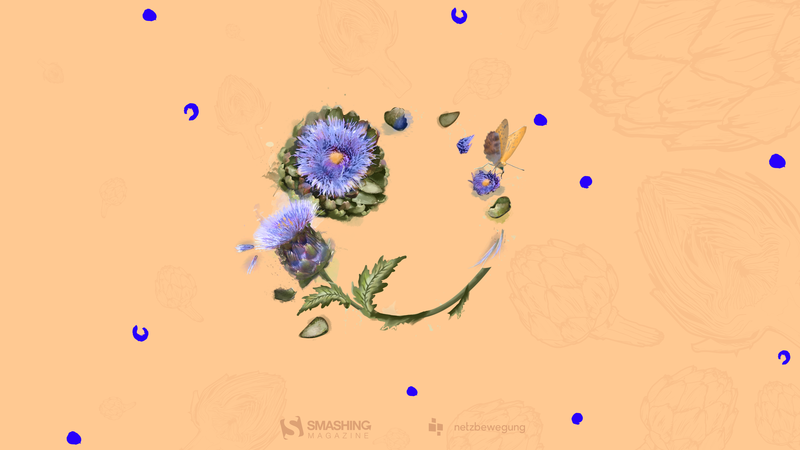 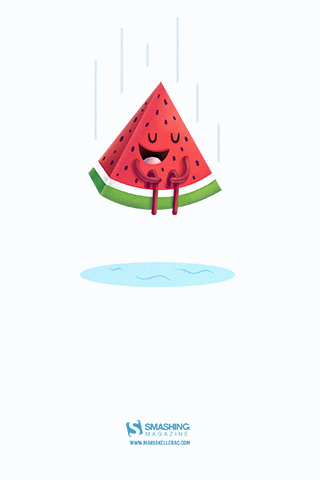 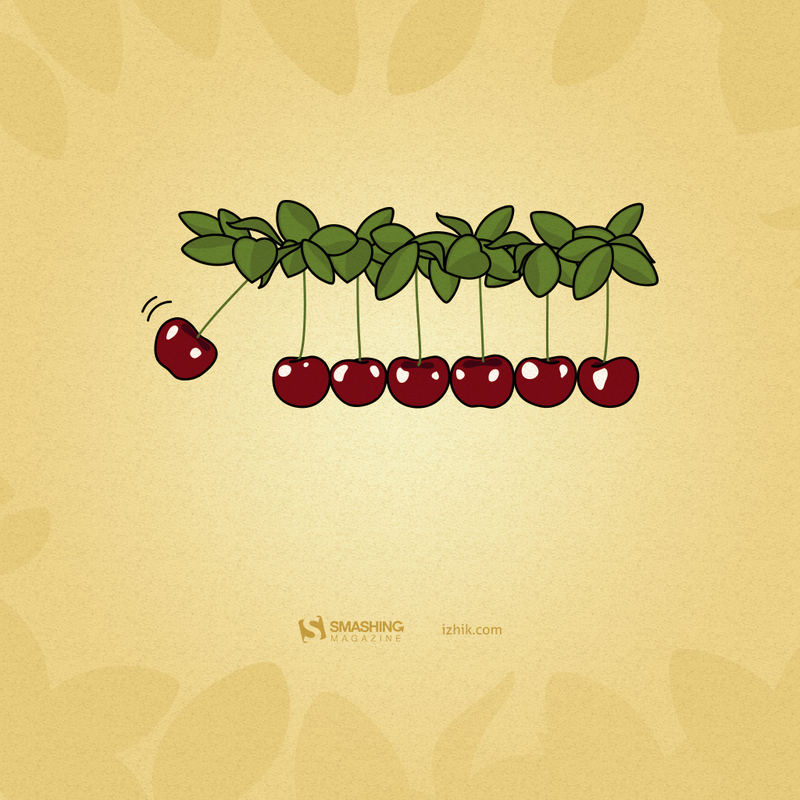 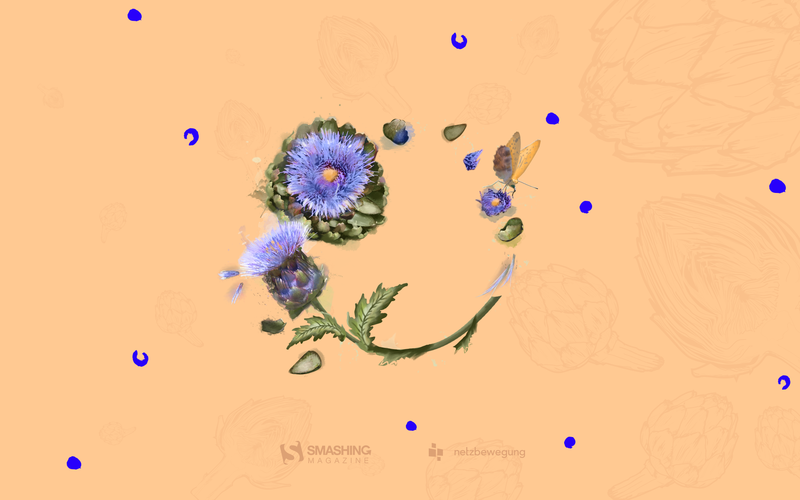 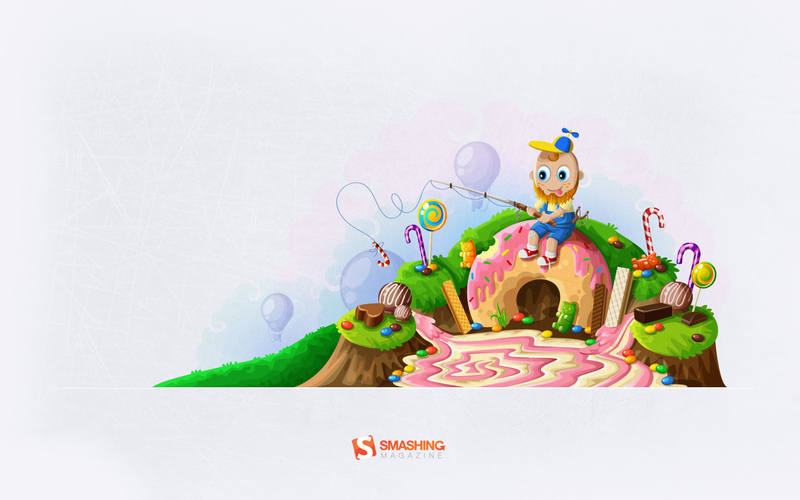 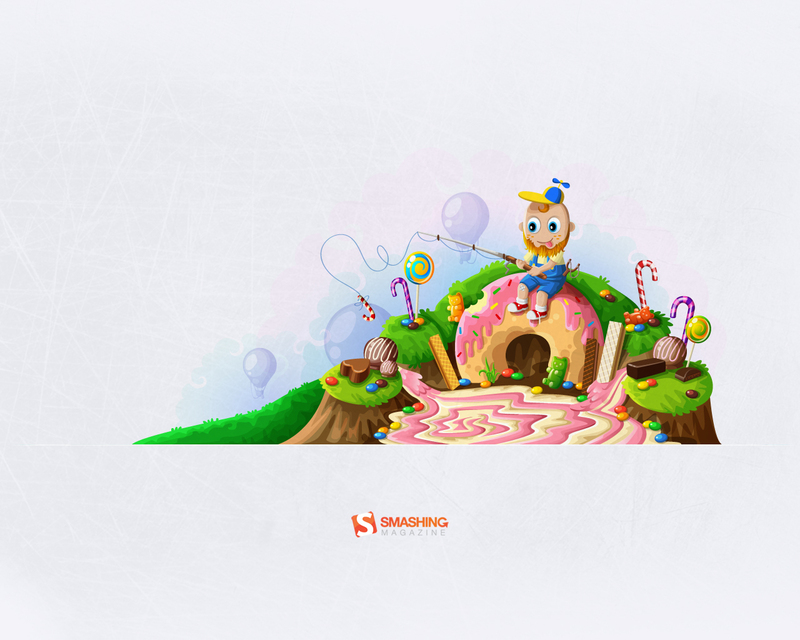 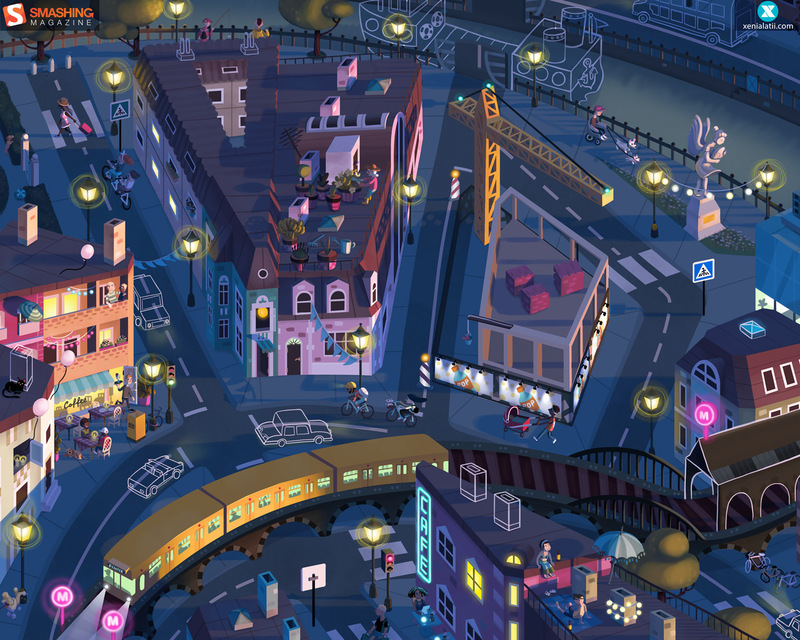 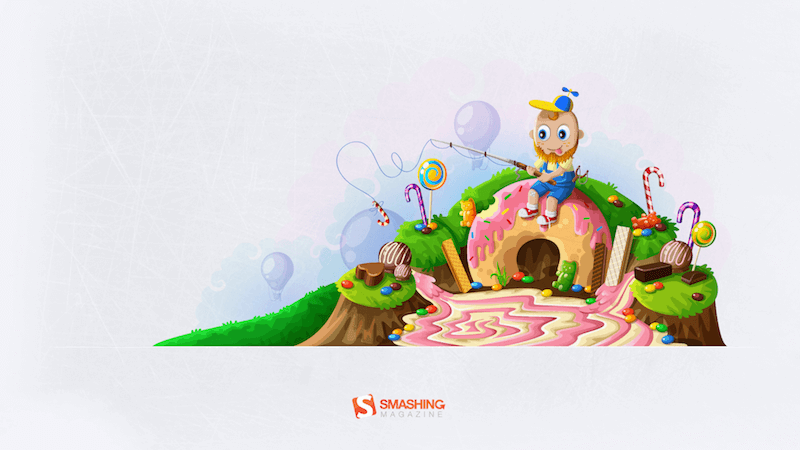 Share some ice cream and some love this month with my wallpaper! — Designed by Melissa Bogemans from Belgium. 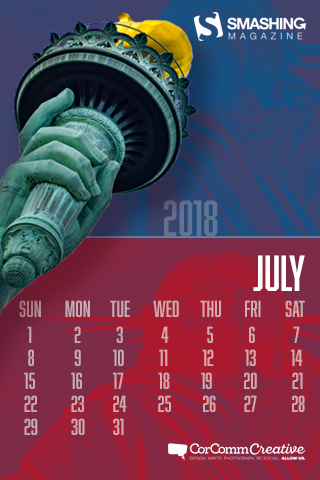 Last year we visited NYC for the first time during the 4th of July. 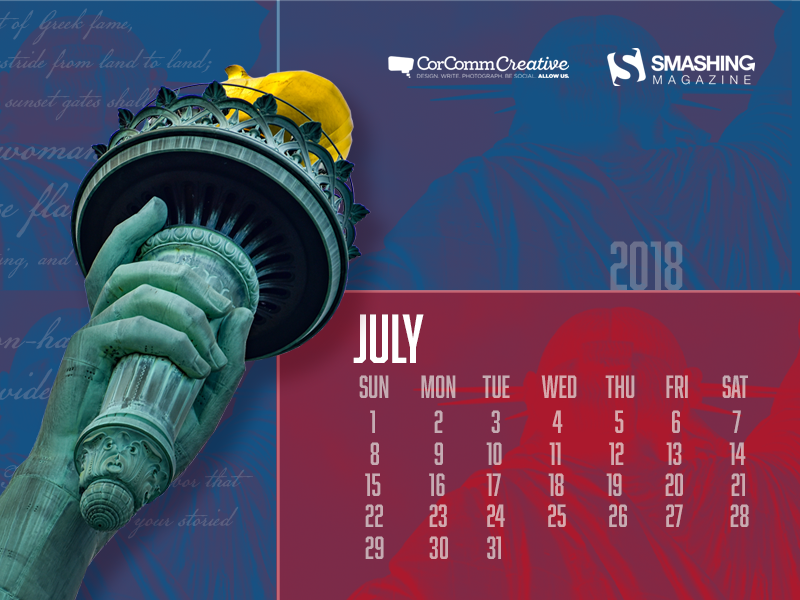 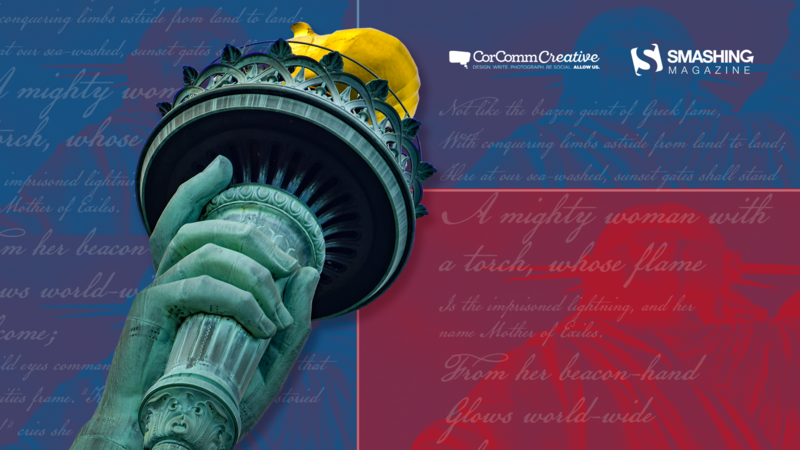 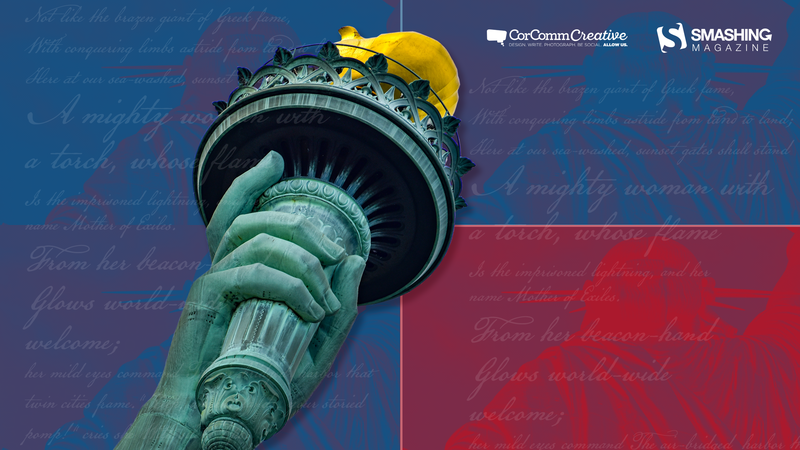 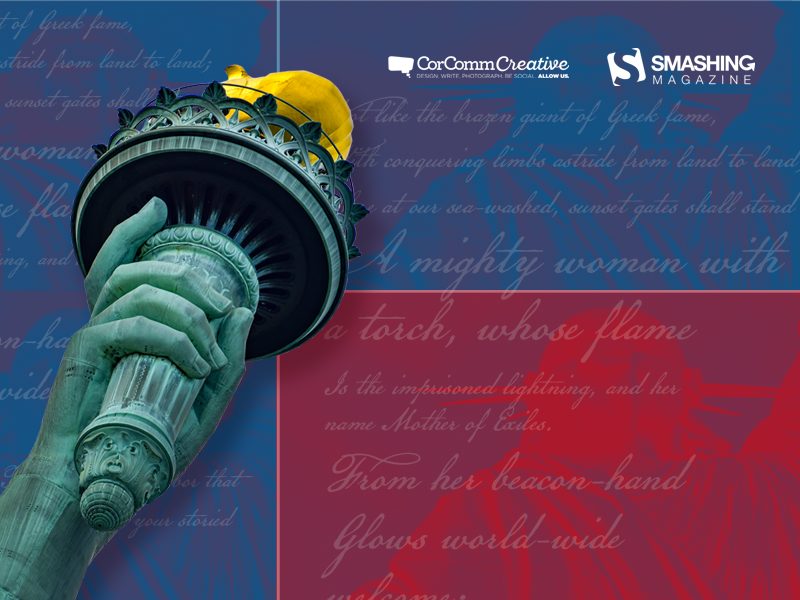 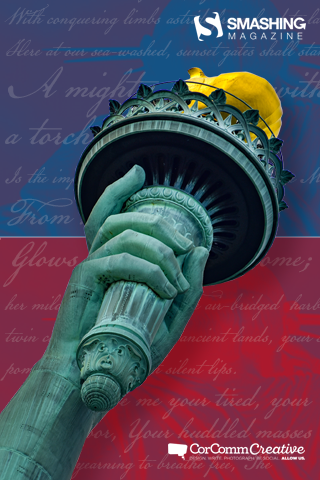 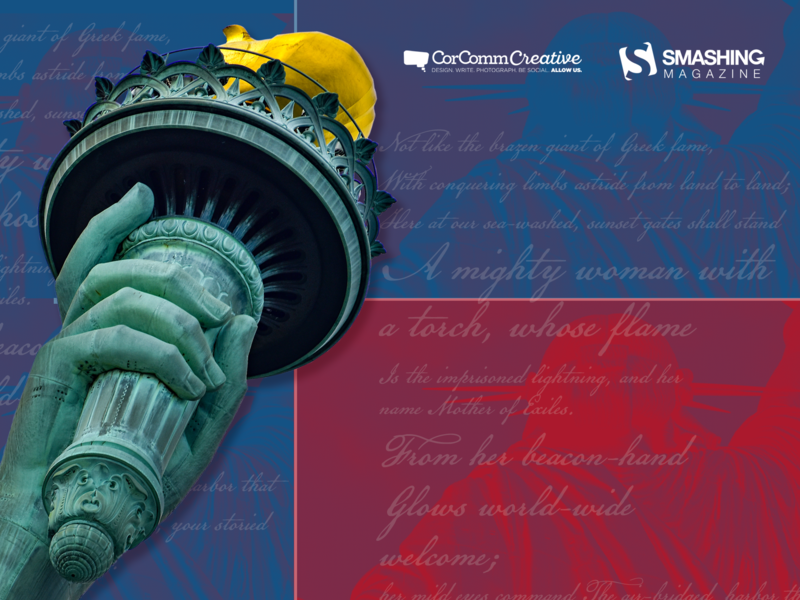 I took many photos of Lady Liberty and was so deeply inspired by her message. — Designed by Jennifer Forrest from Indiana. 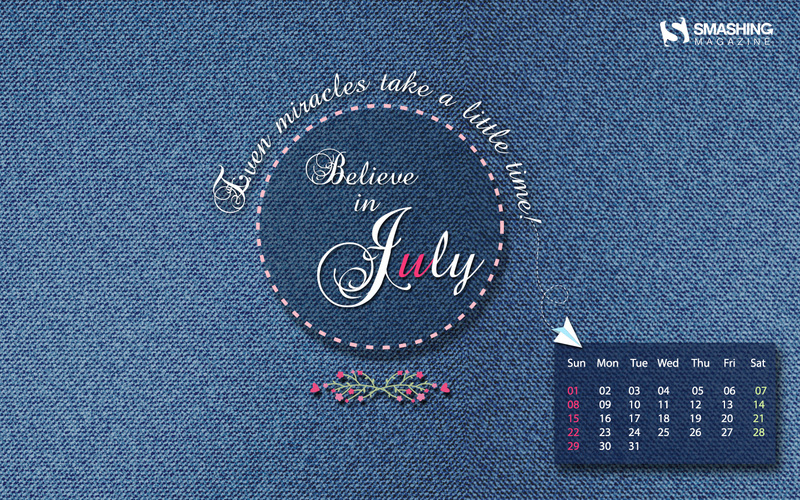 Challenges are a part of parcel of life. 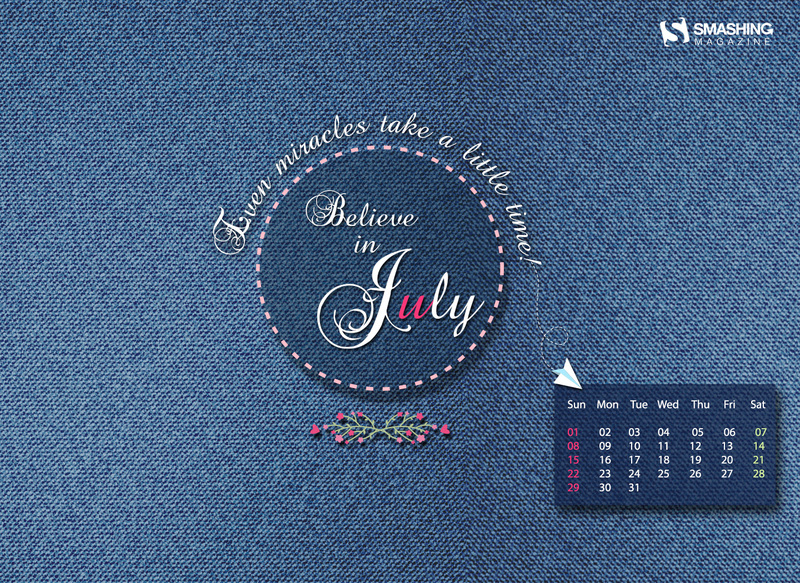 Surpassing each challenge would be difficult, but it is you who decide whether to keep going or shun the drive. 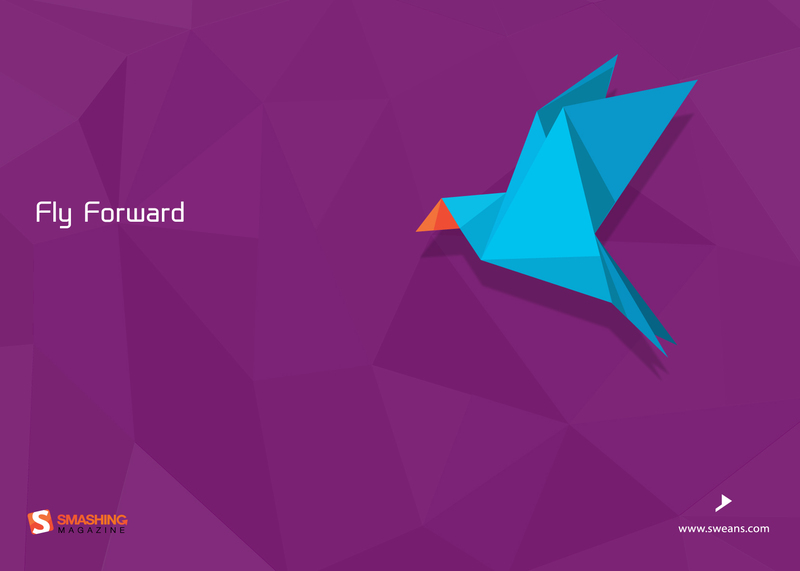 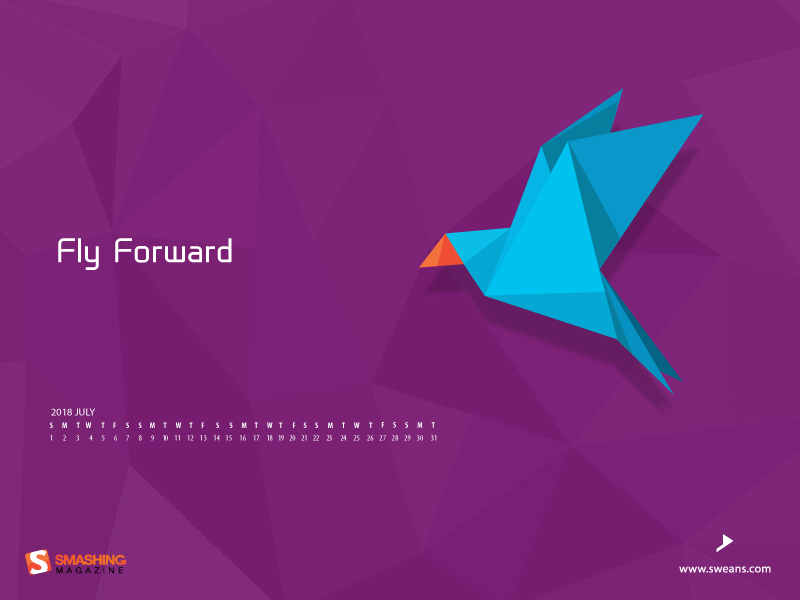 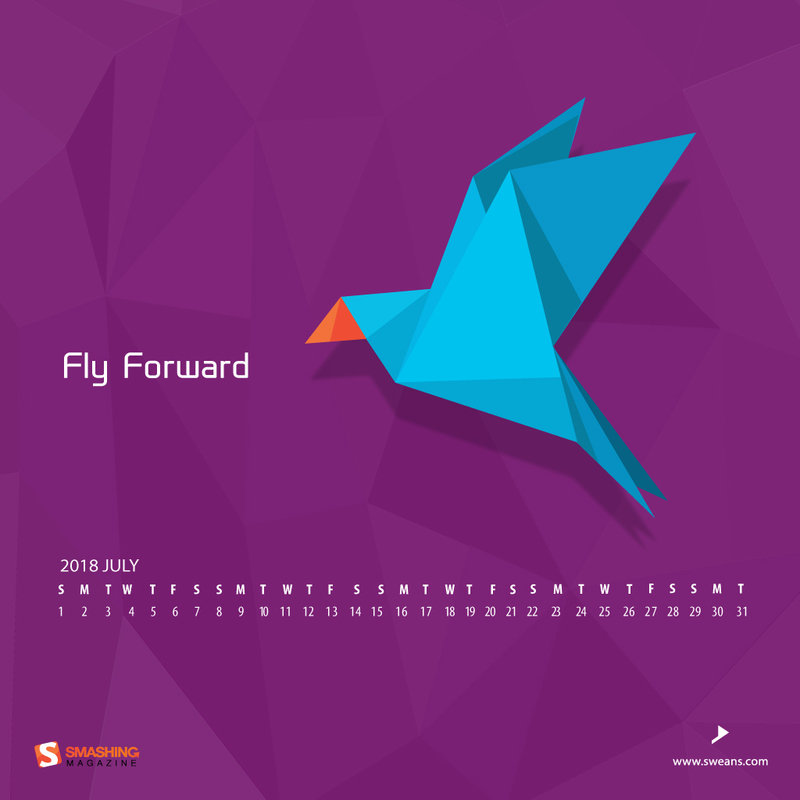 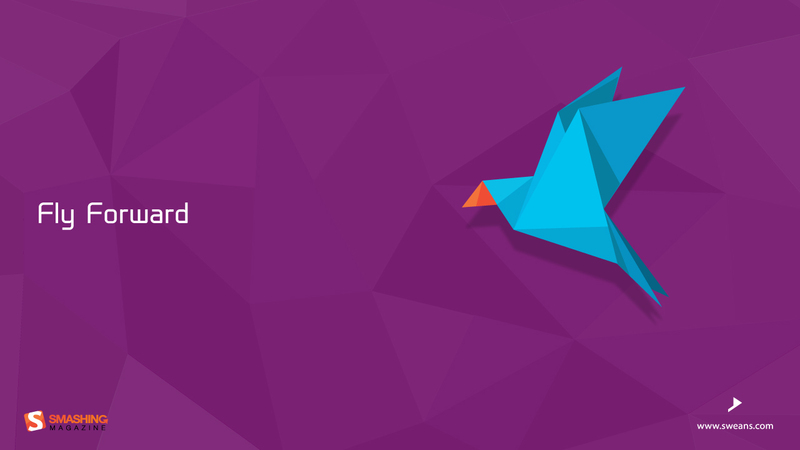 No matter whatever circumstance you are in, ignite your mind and just fly forward into action to achieve what you are capable of and what is beyond your reach. — Designed by Sweans from London. 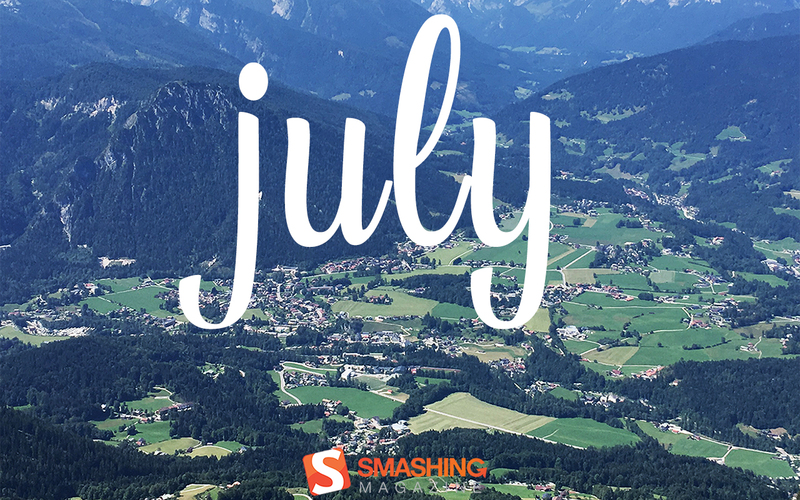 July brings me to summer, and last year in summer, I went to Salzburg, Austria where I took this photo. 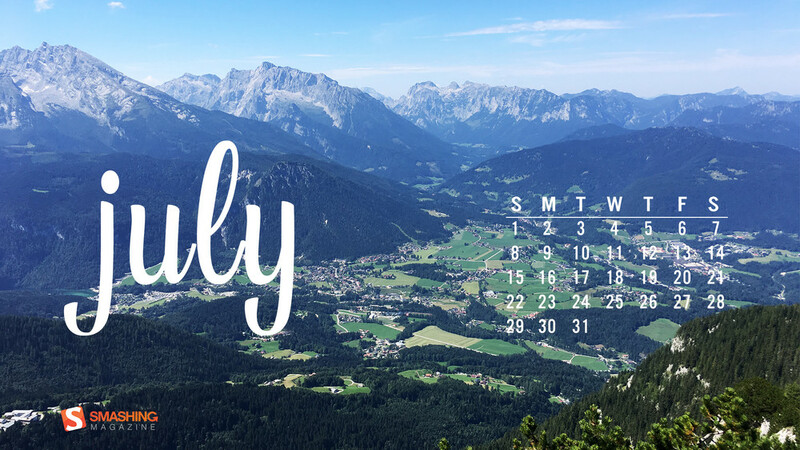 So every beginning of summer, I think about Salzburg and how sunny and warm it was there. — Designed by Ilse van den Boogaart from The Netherlands. 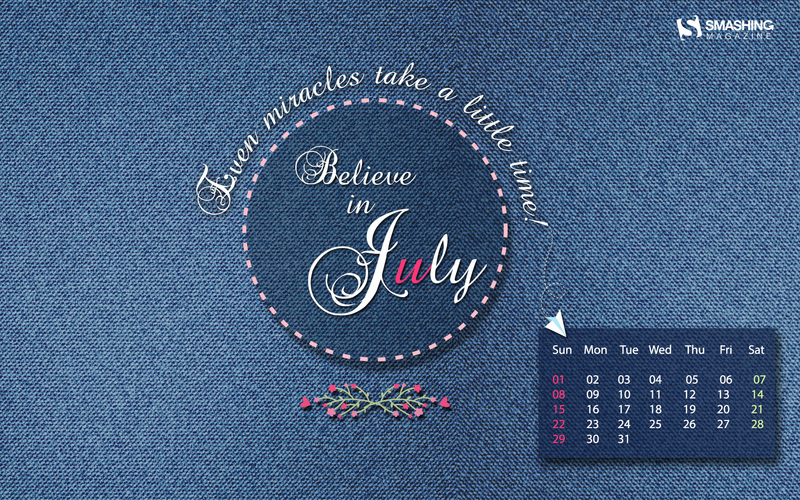 ‘One day, the people that didn’t believe in you will tell everyone how they met you.’ Believe in Yourself. 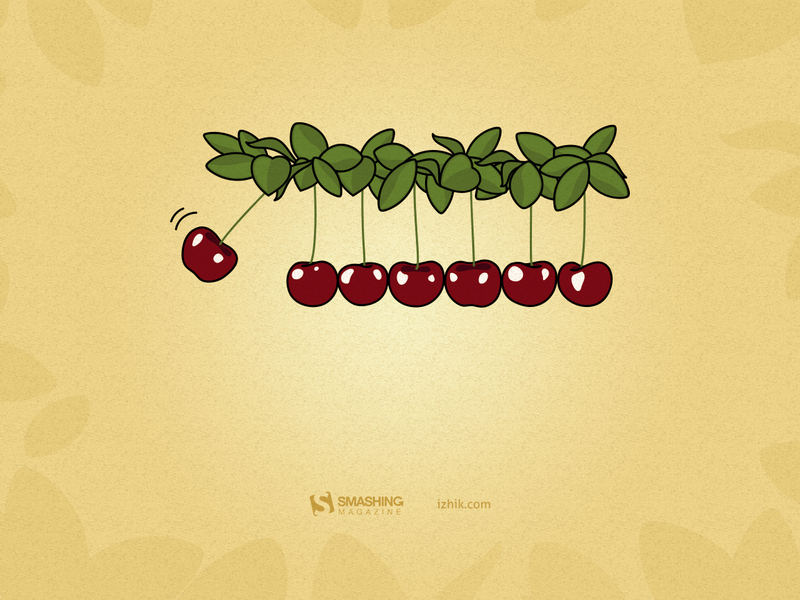 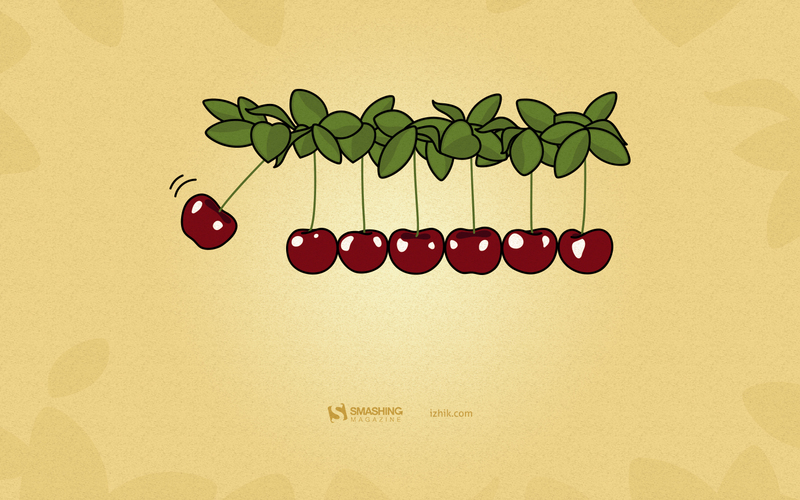 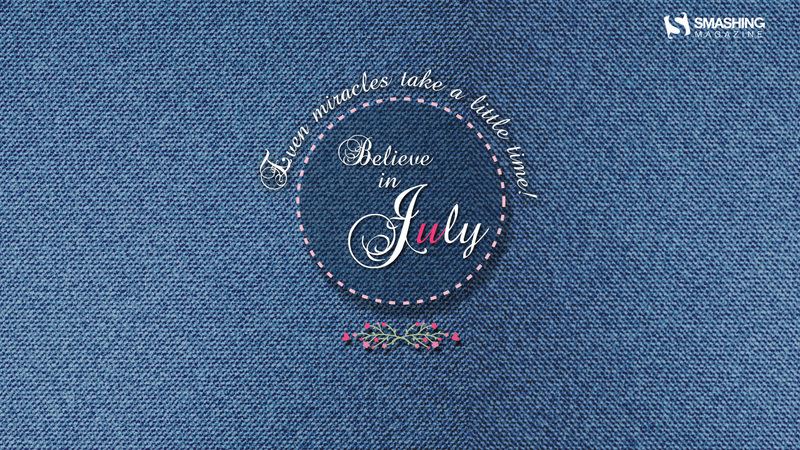 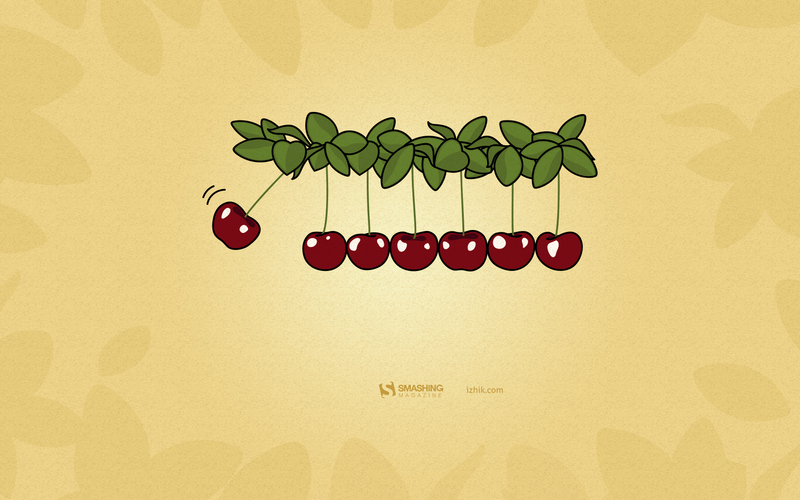 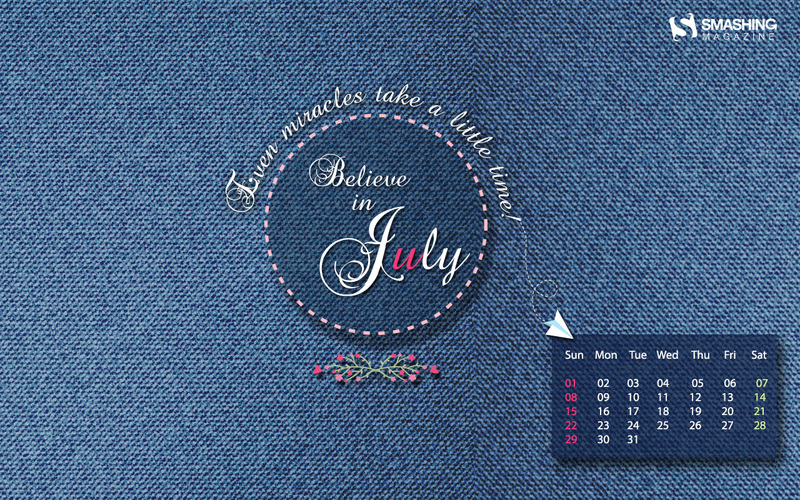 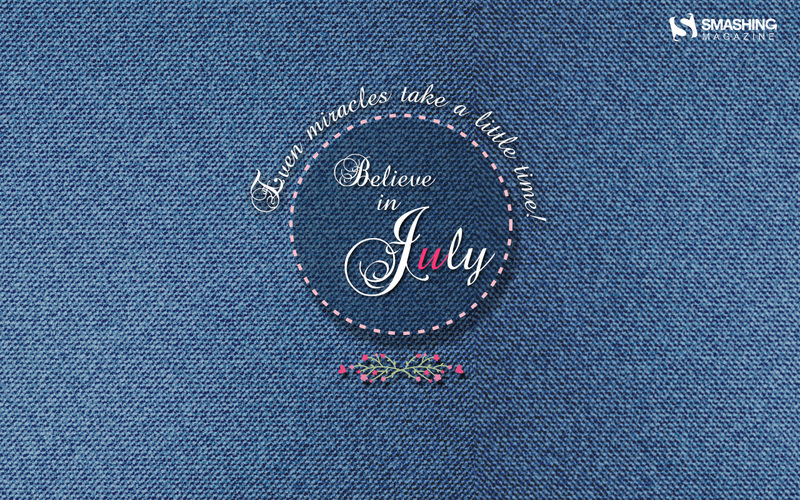 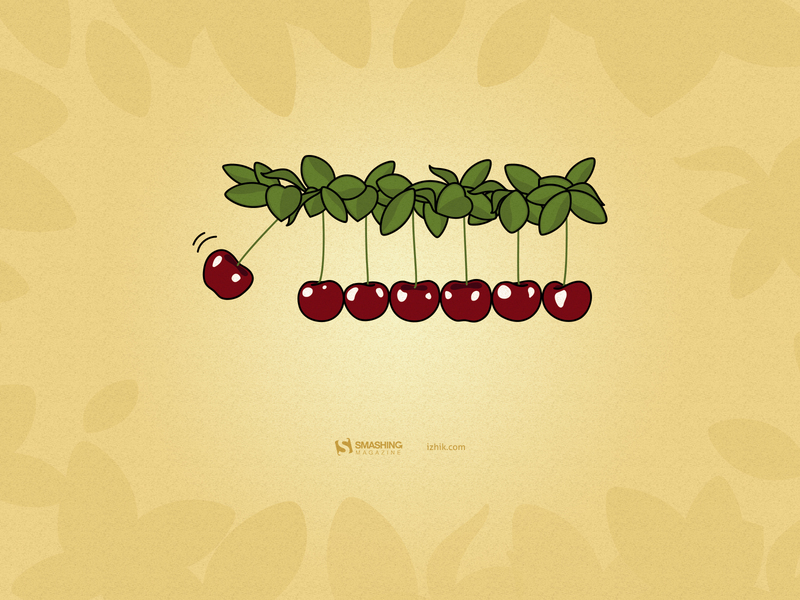 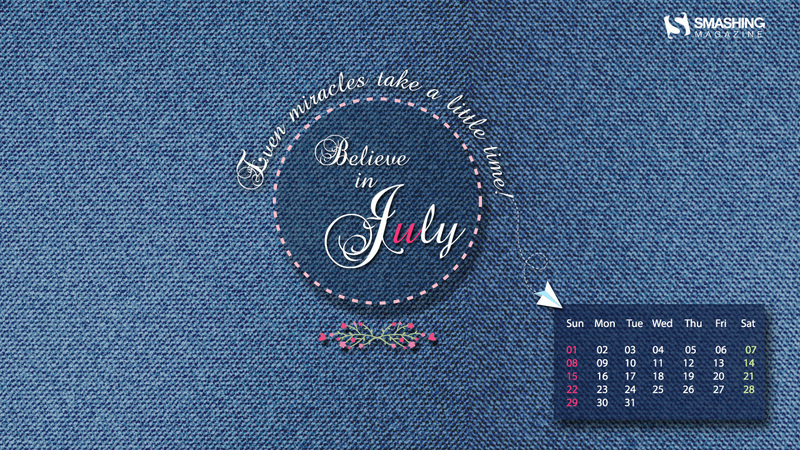 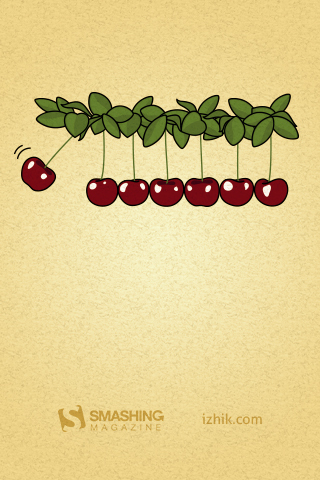 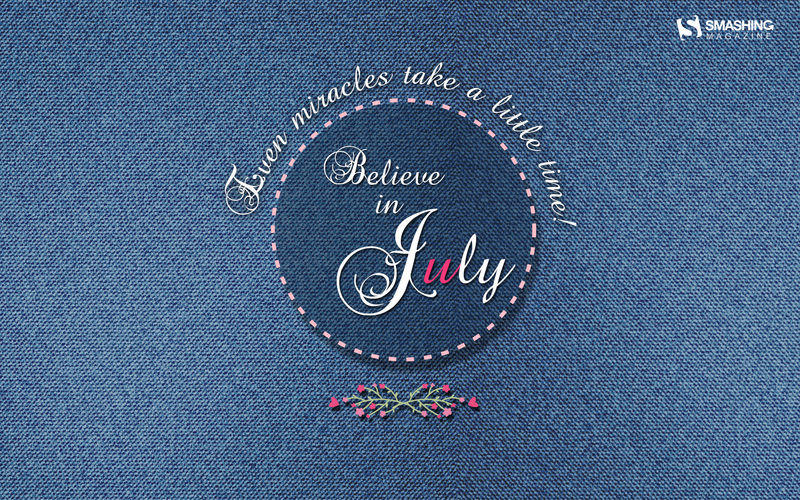 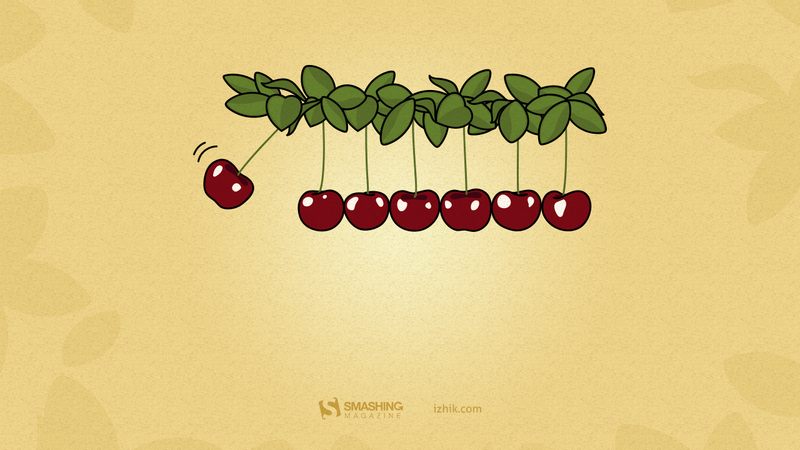 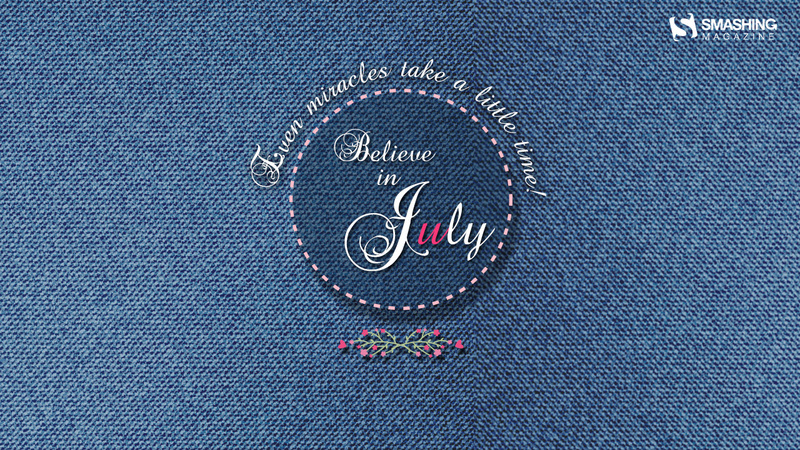 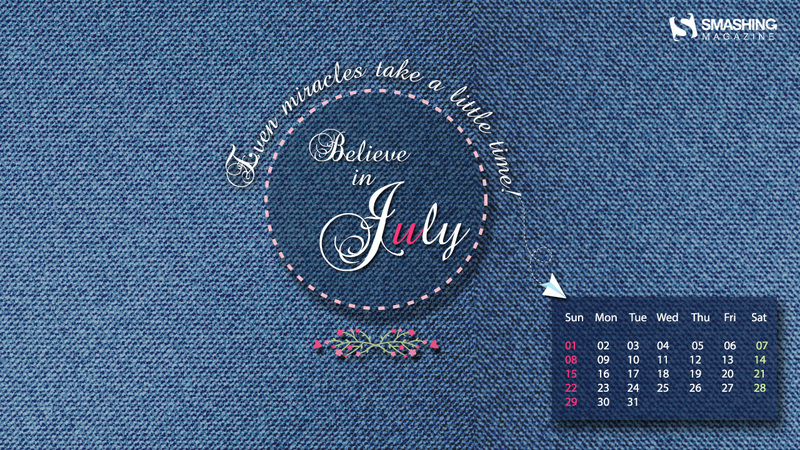 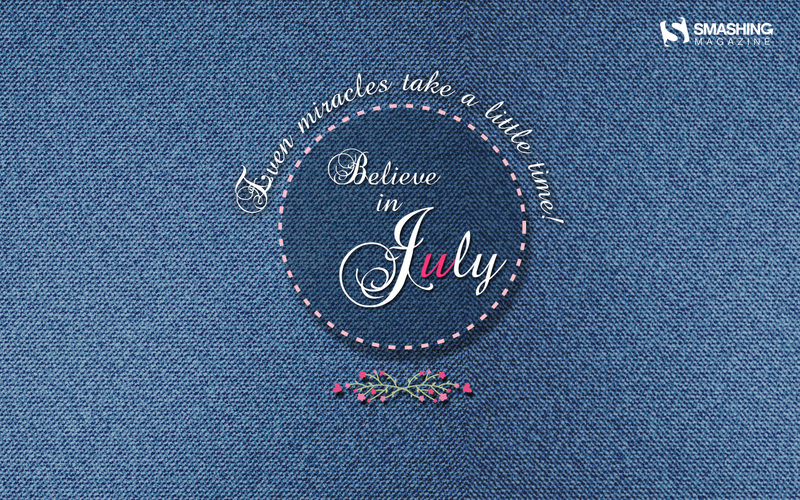 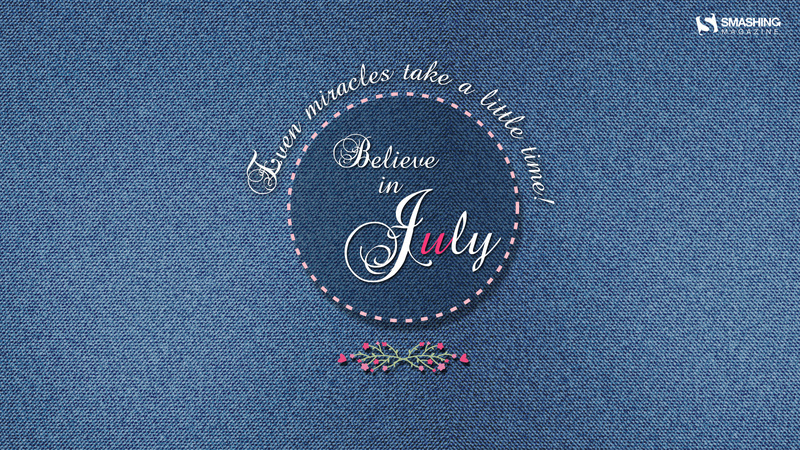 Give it all that you can, take your own sweet time and be your own miracle! — Designed by Binita Lama from India. 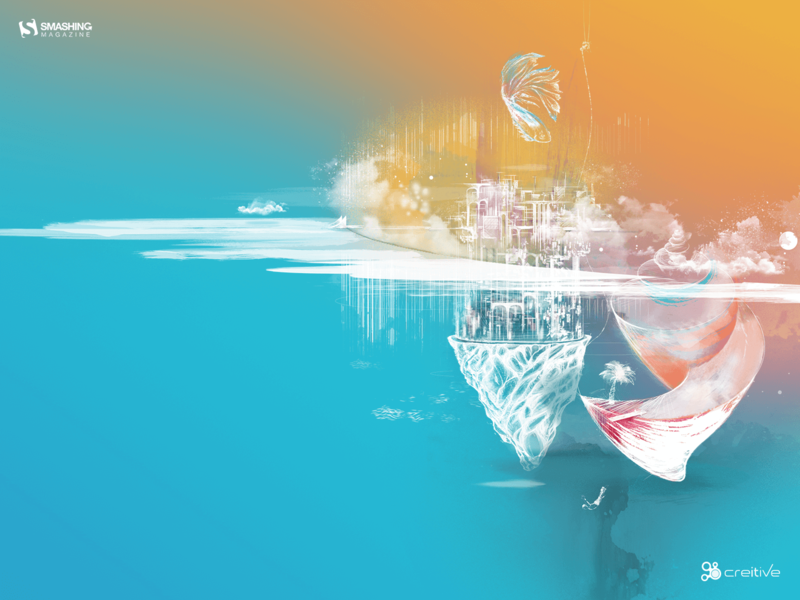 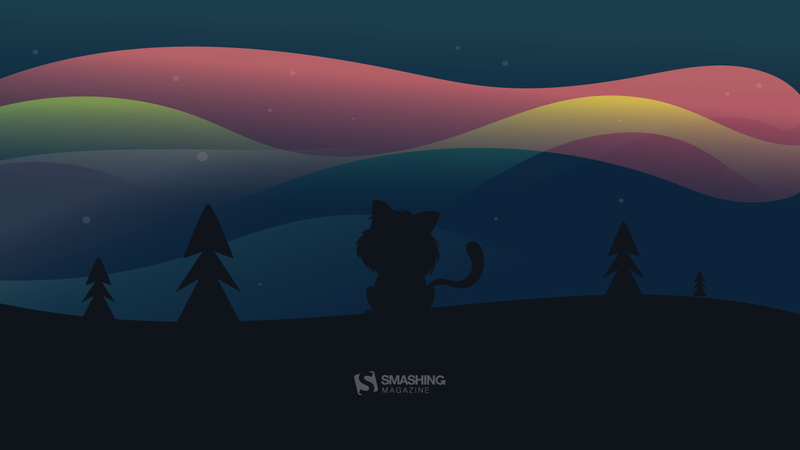 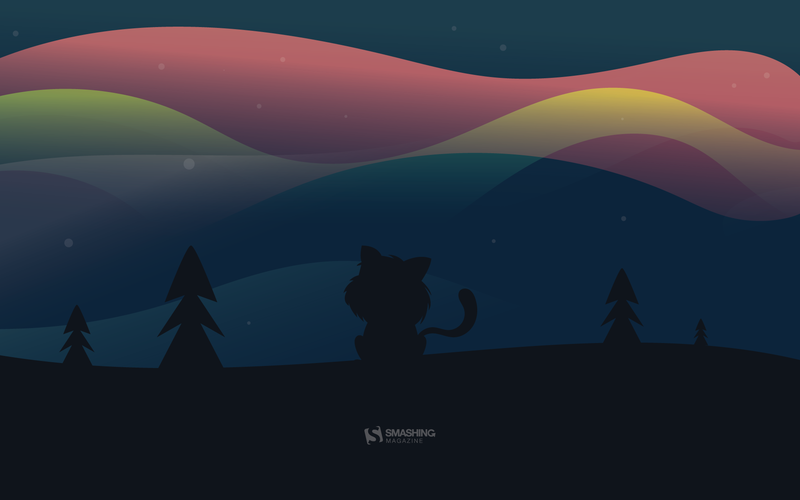 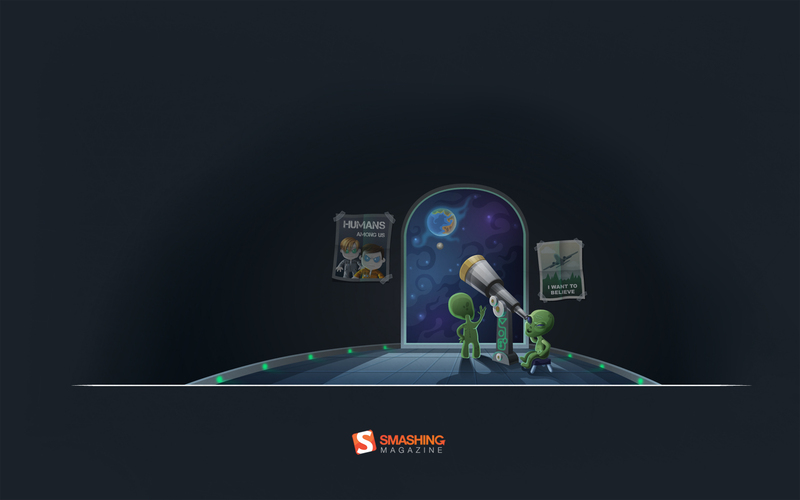 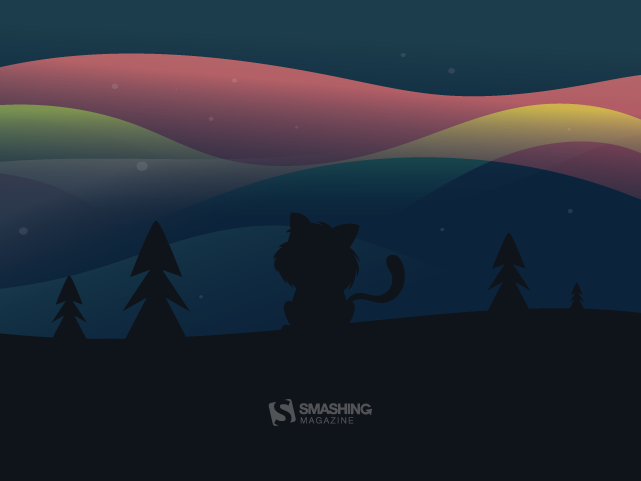 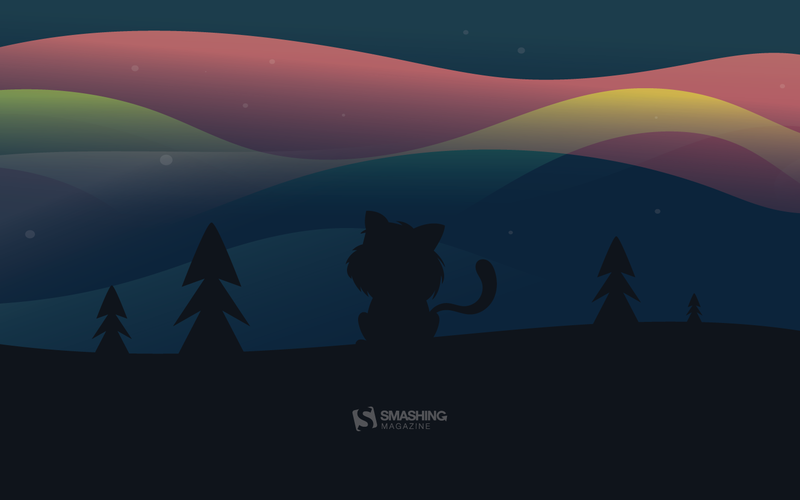 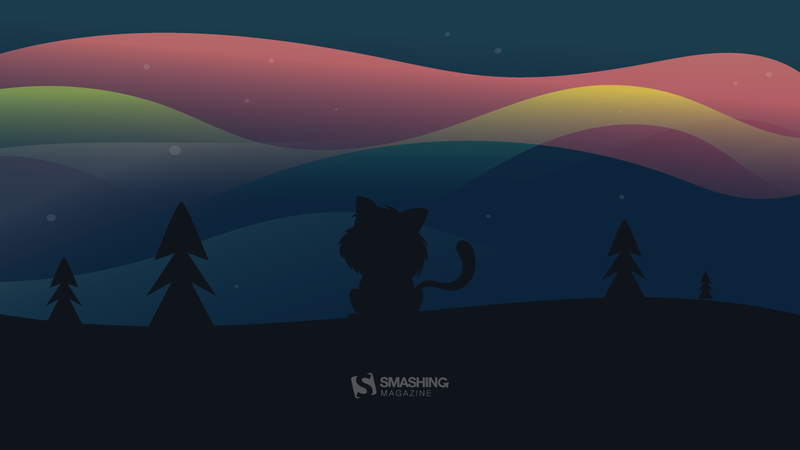 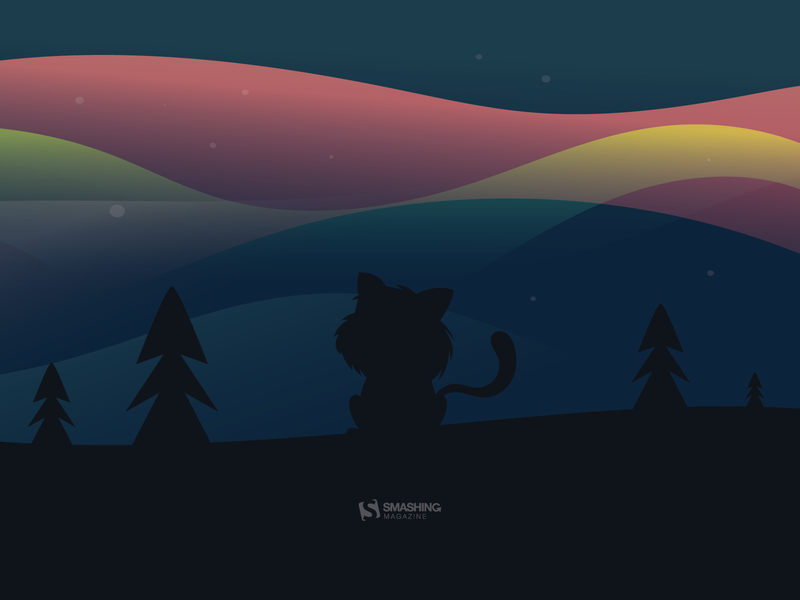 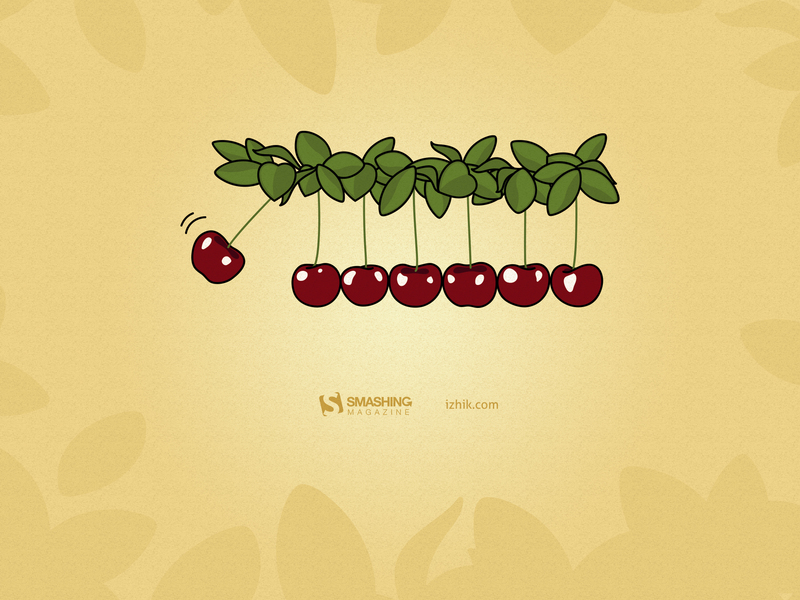 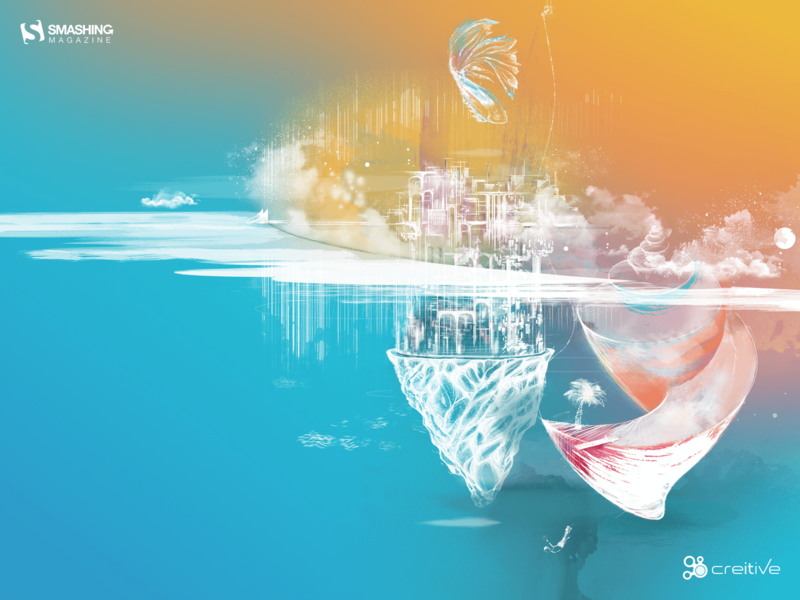 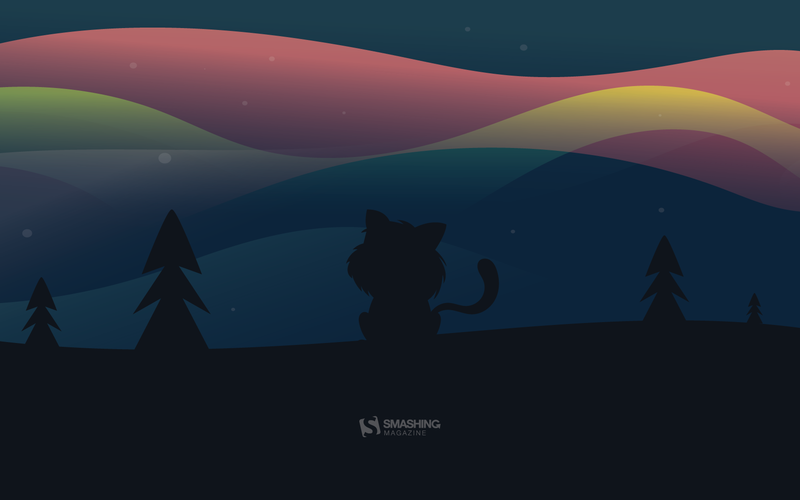 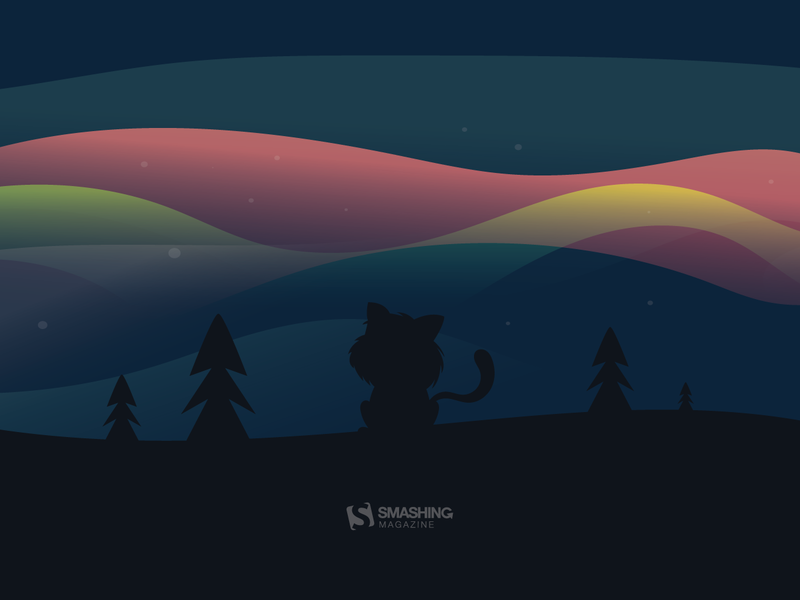 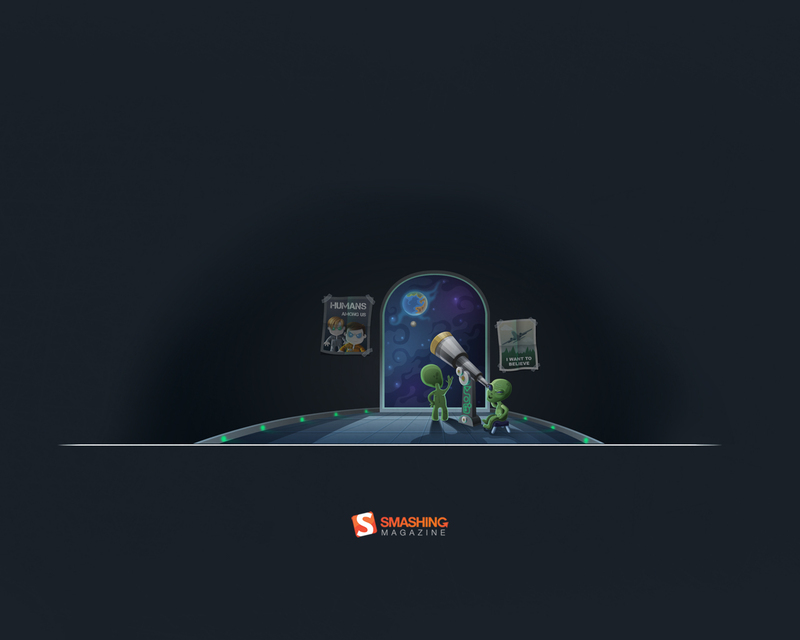 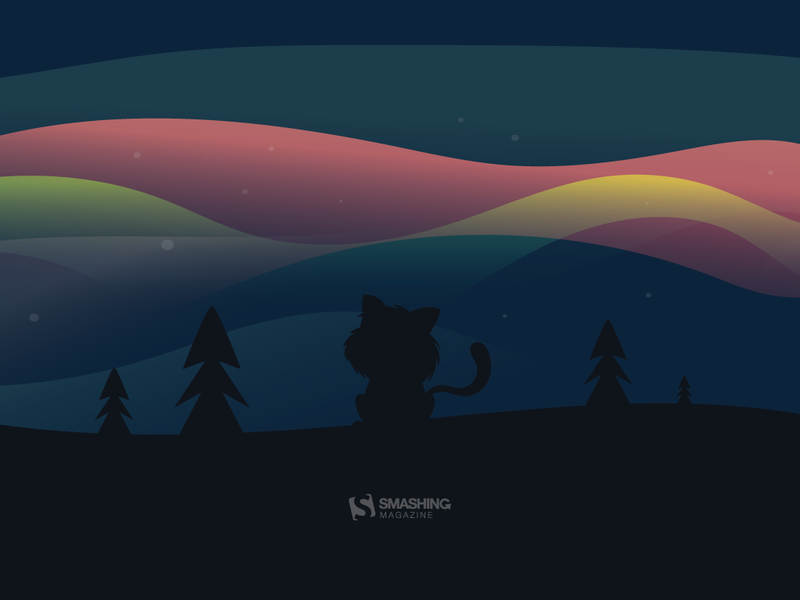 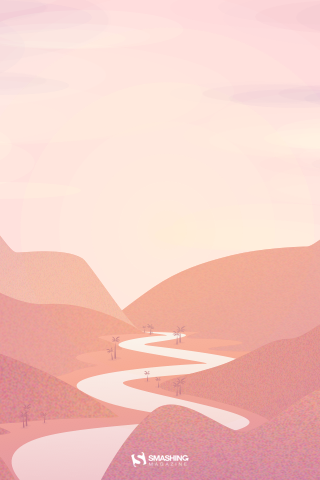 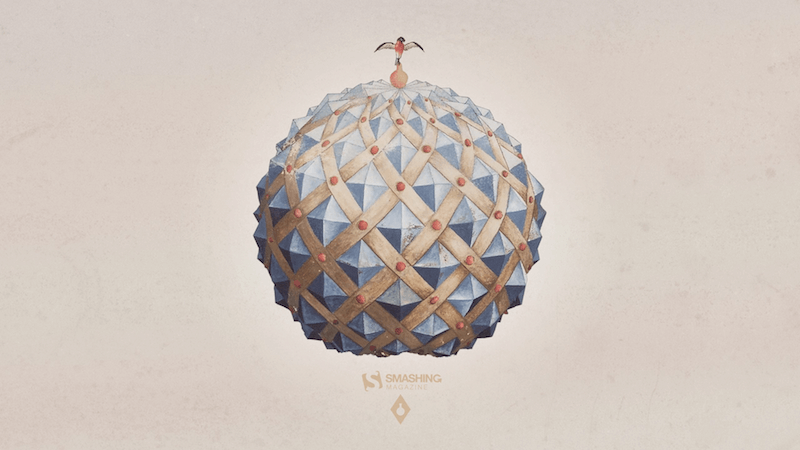 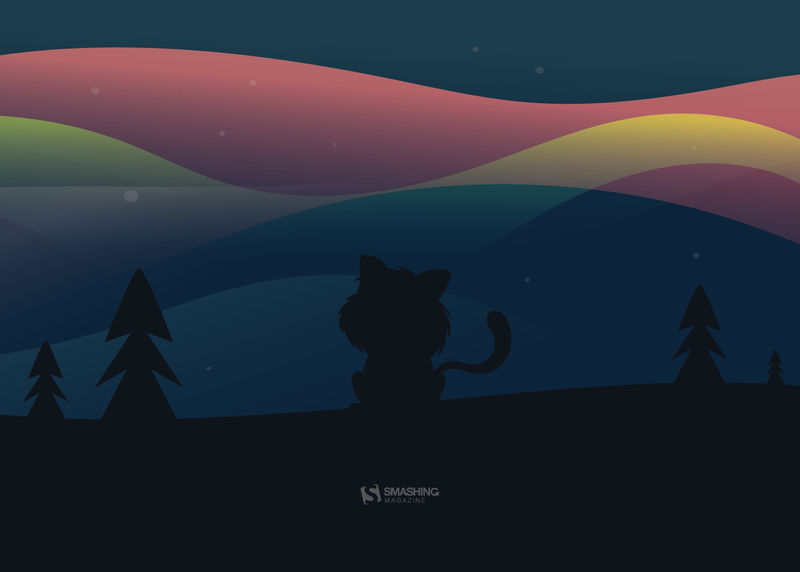 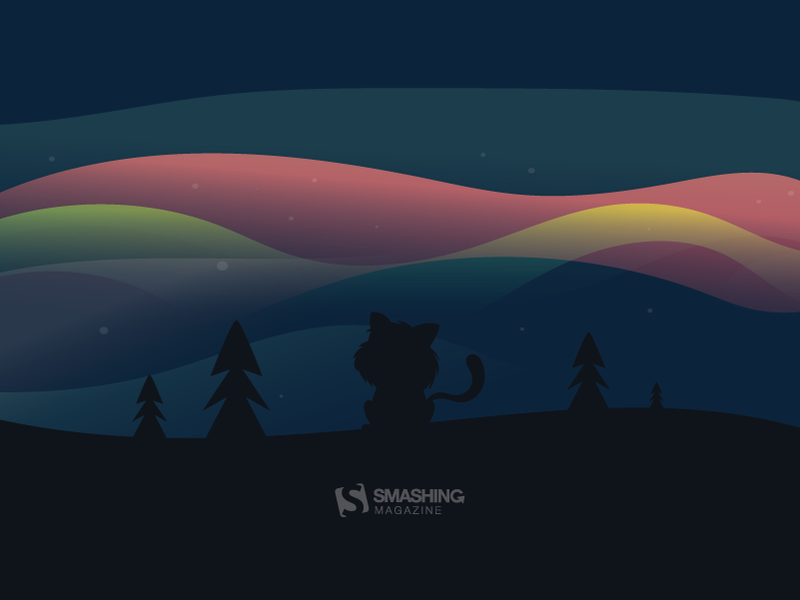 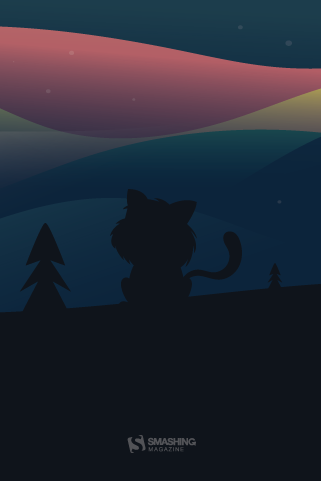 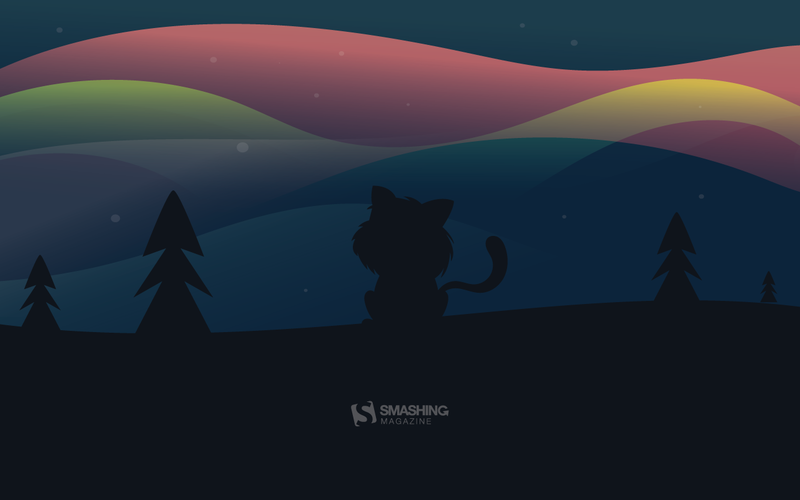 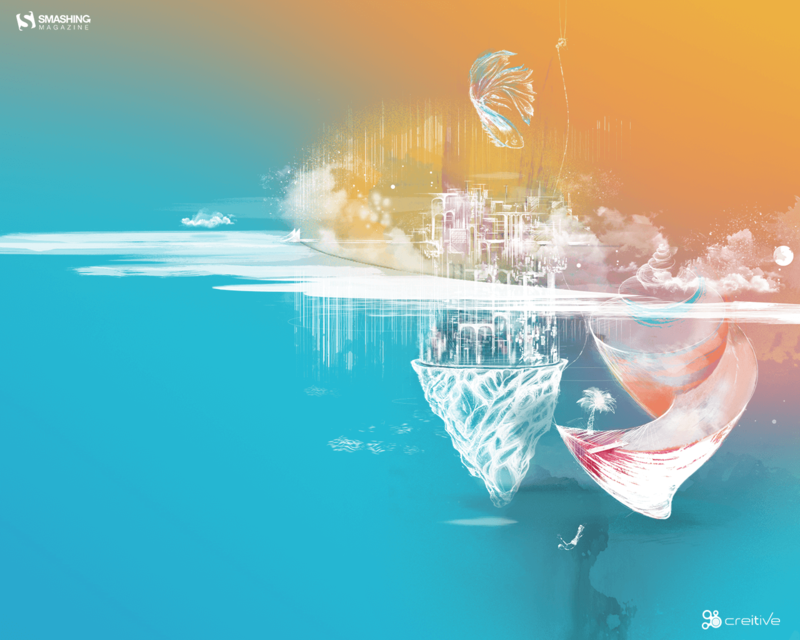 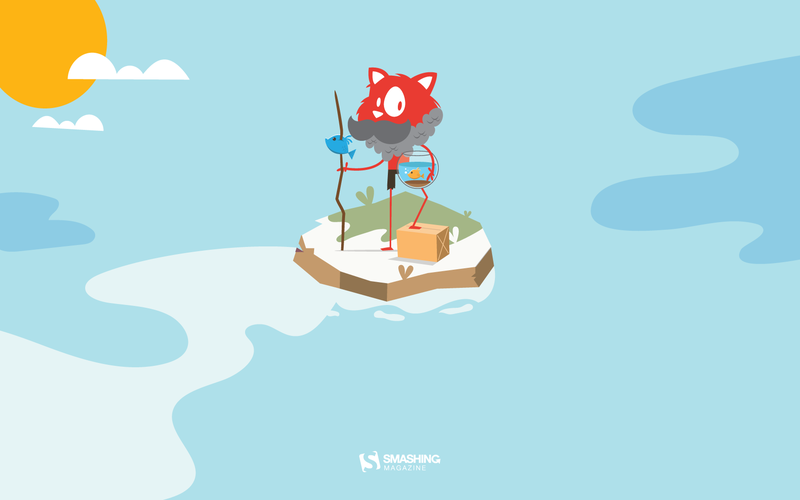 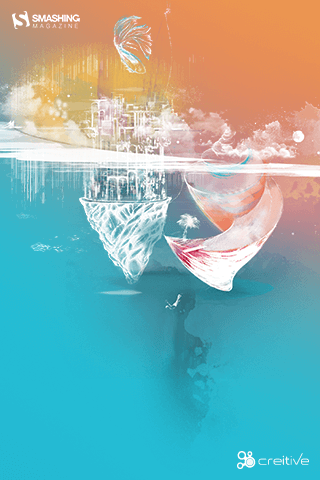 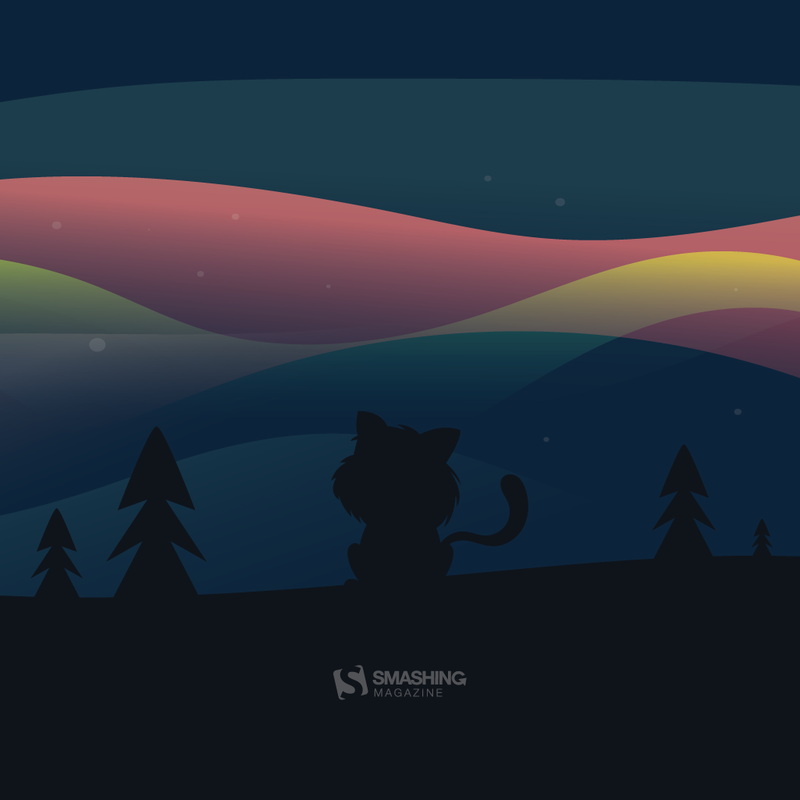 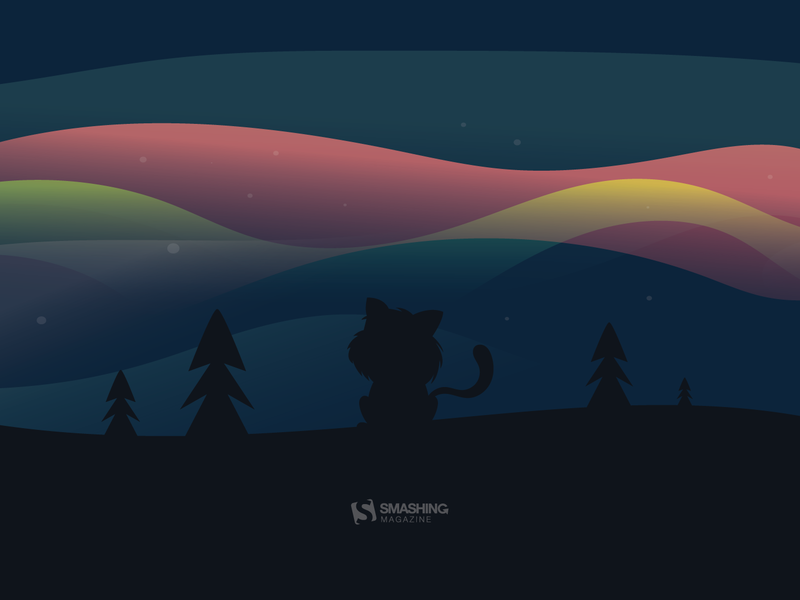 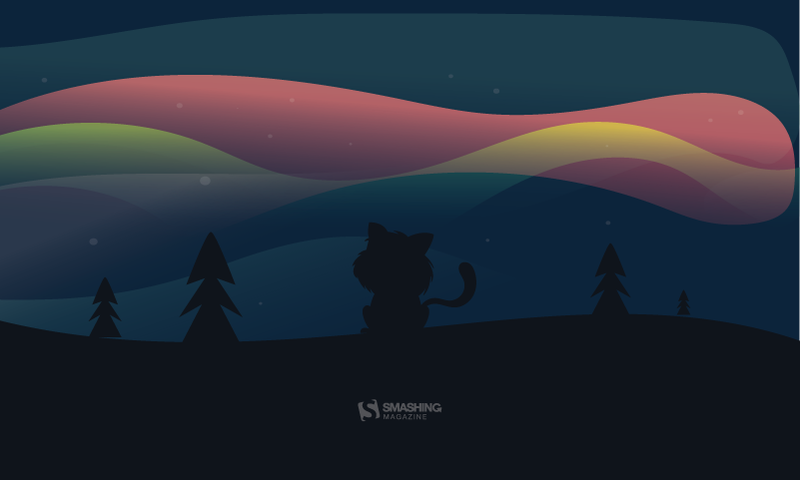 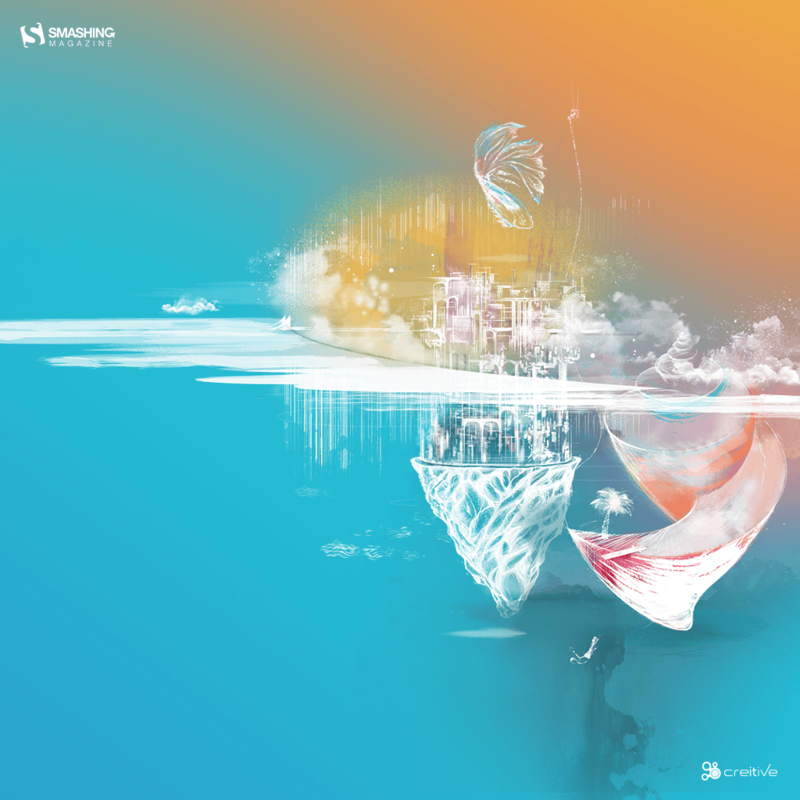 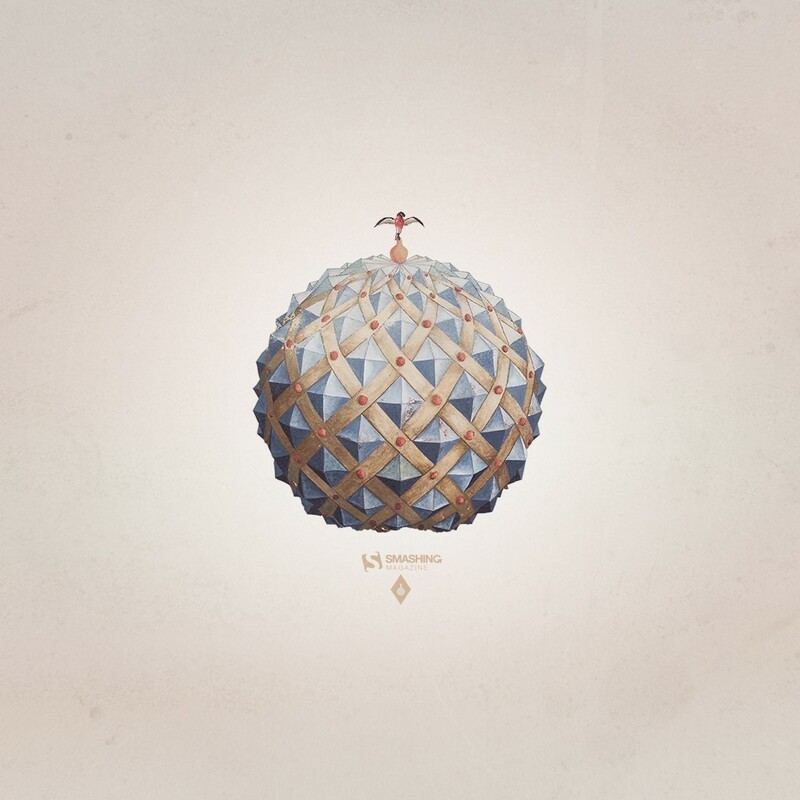 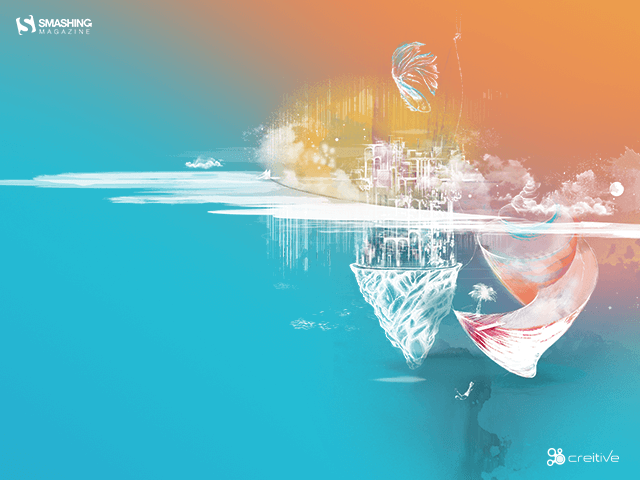 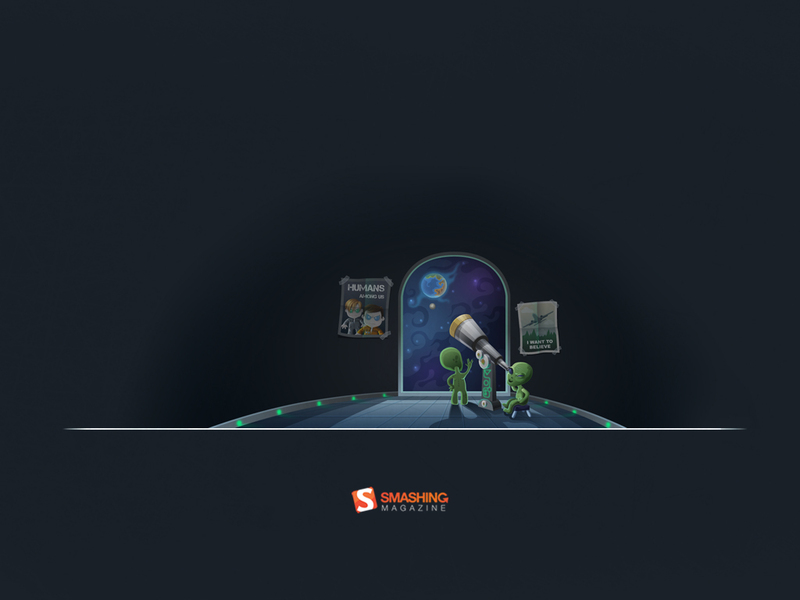 Lots of beautiful wallpapers have been created in the nine years since we embarked on our wallpapers adventure. And since it’d be a pity to let them gather dust, we once again dived deep into our archives on the lookout for some July treasures. 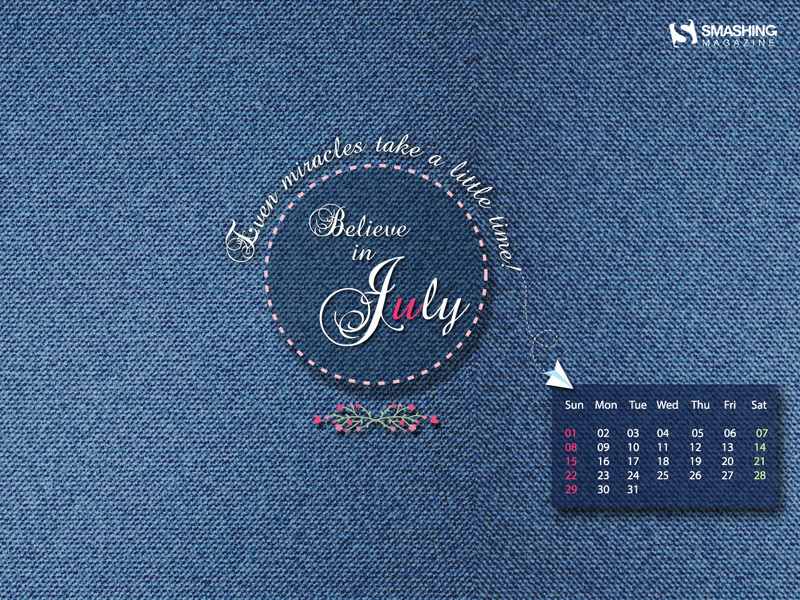 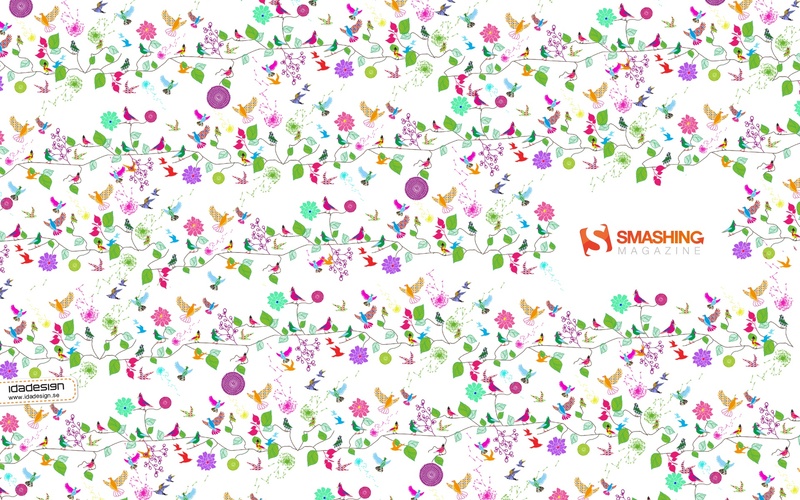 Please note that these wallpapers, thus, don’t come with a calendar. 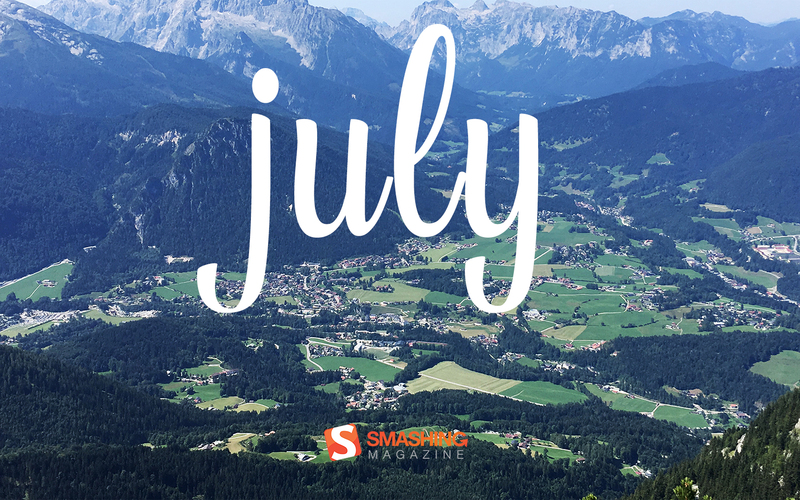 “July in South Africa is dreary and wintery so we give all the southern hemisphere dwellers a bit of colour for those grey days. 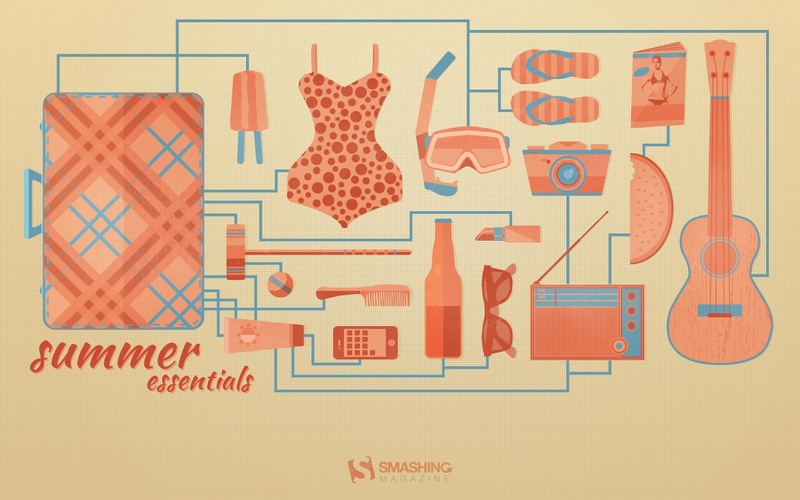 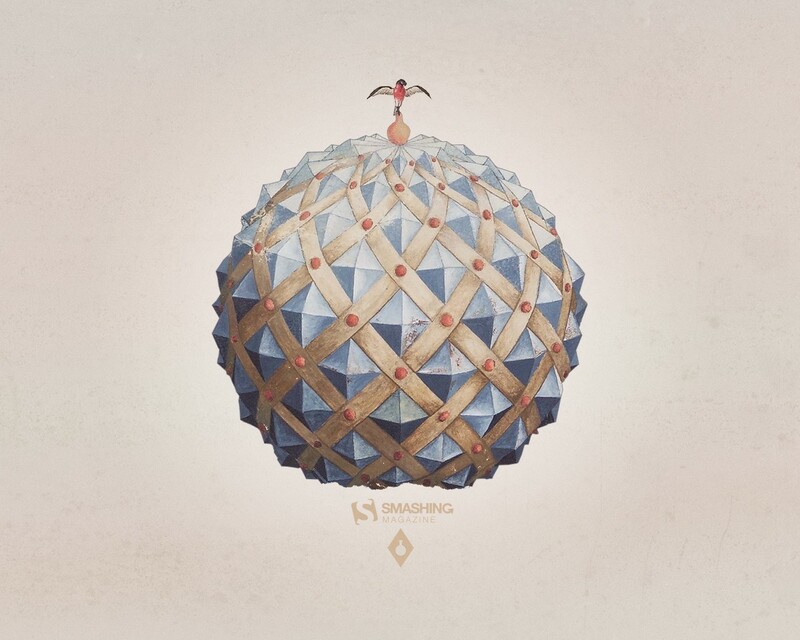 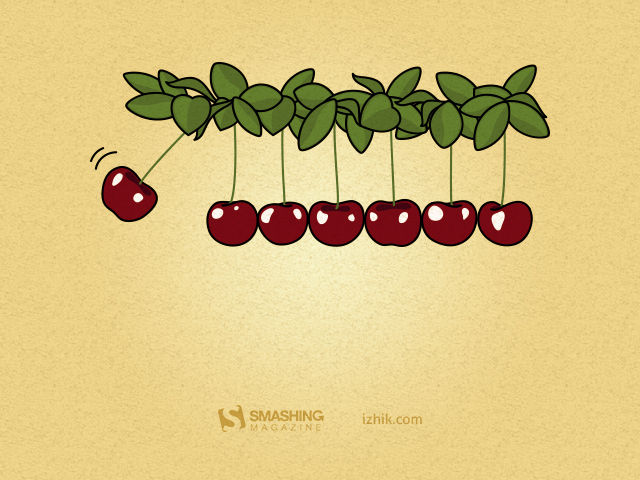 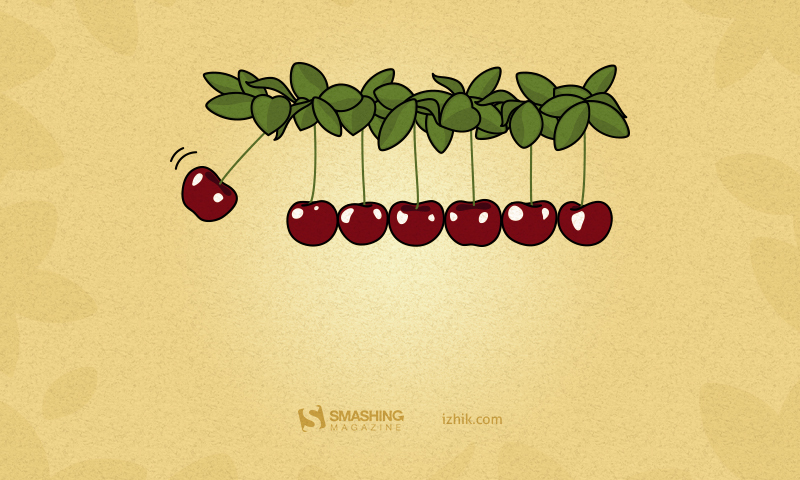 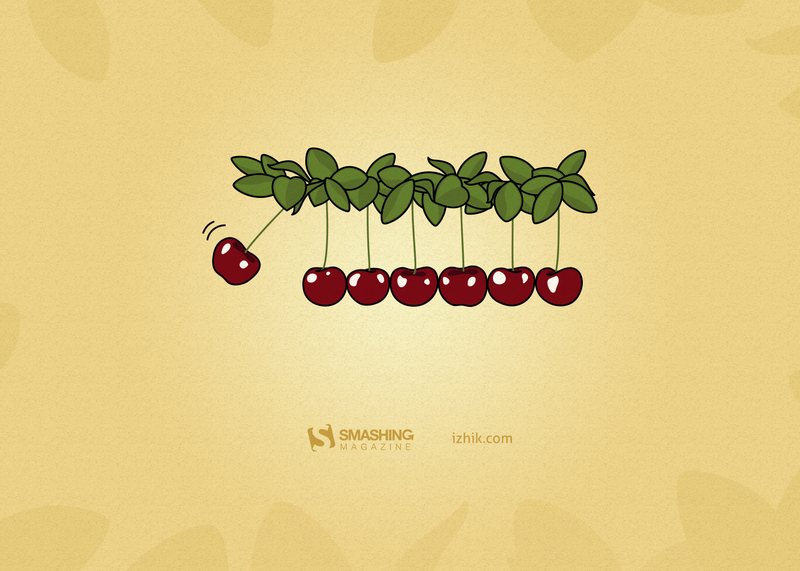 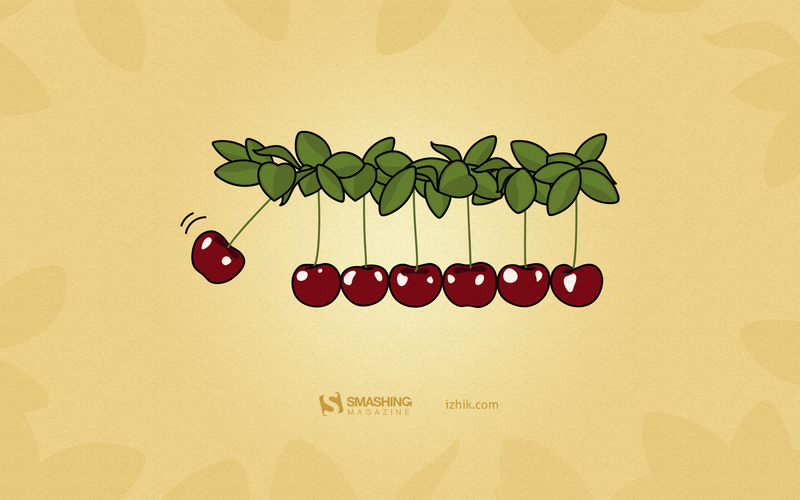 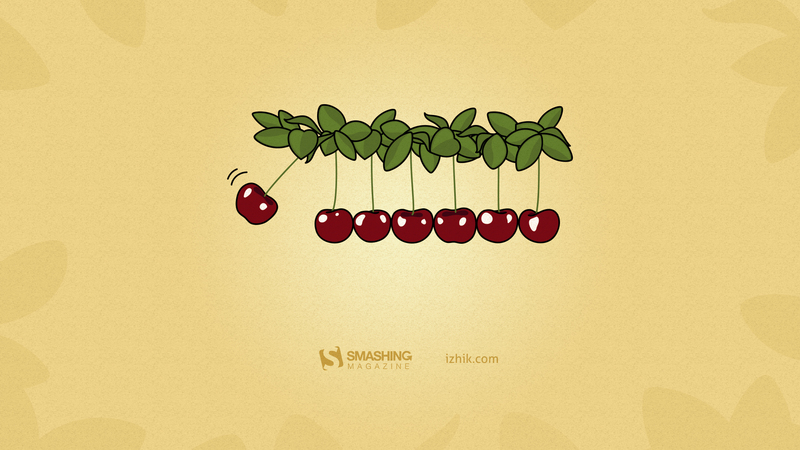 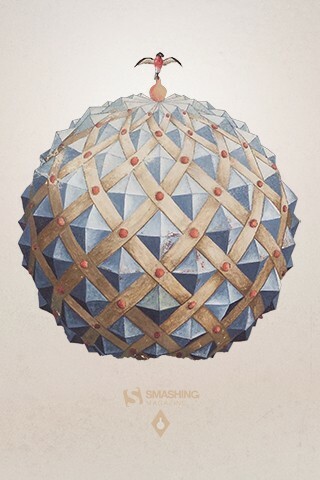 And for the northern hemisphere dwellers a bit of pop for their summer! 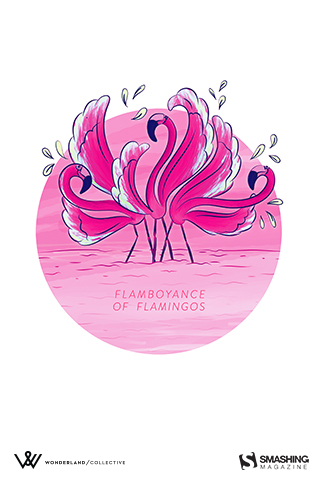 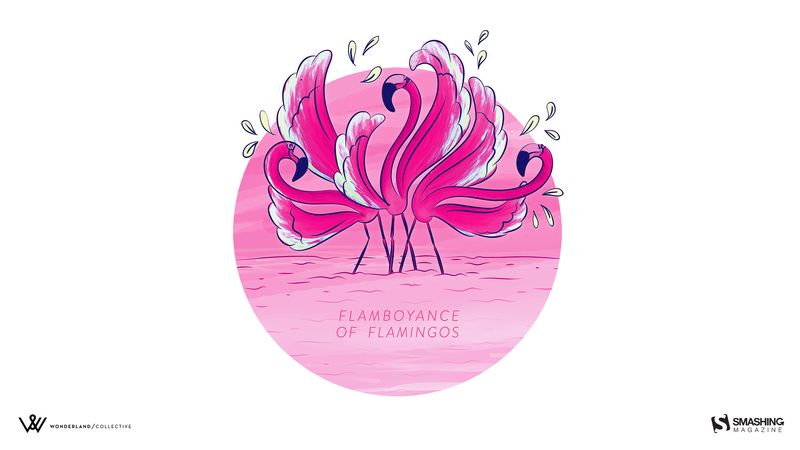 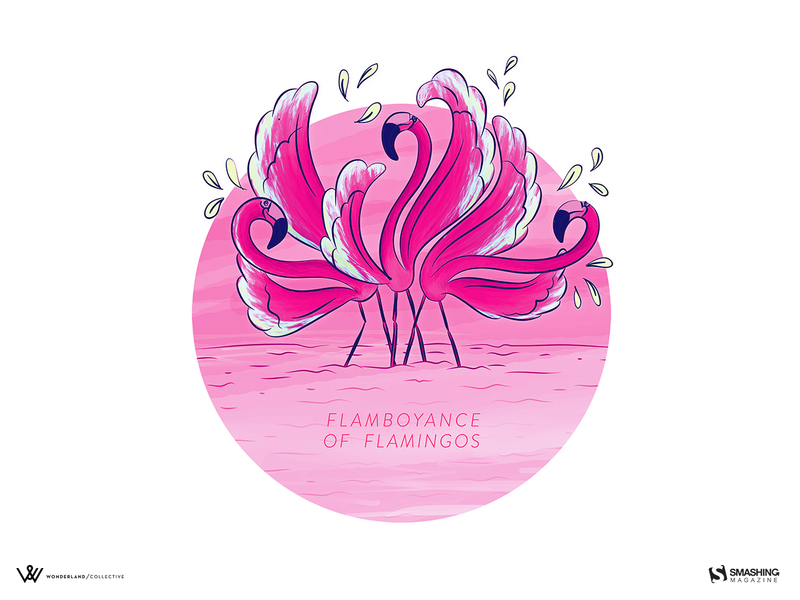 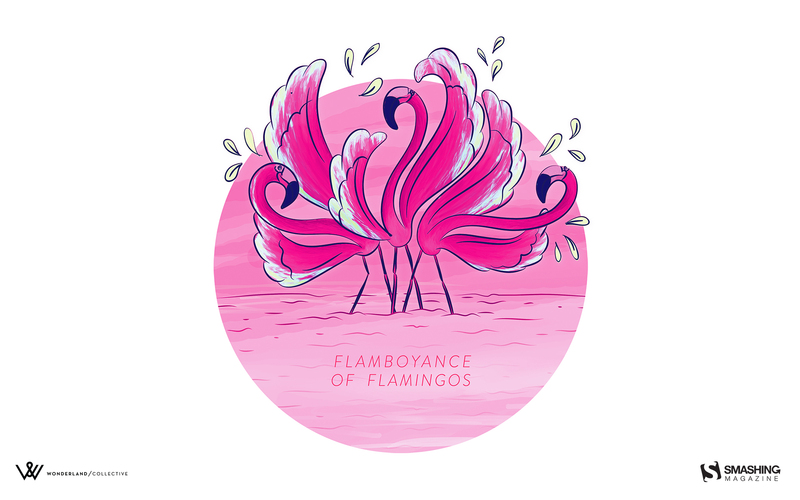 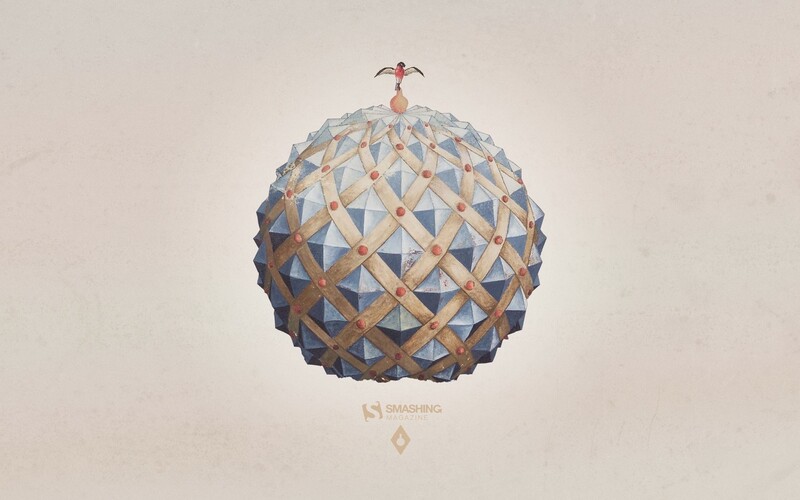 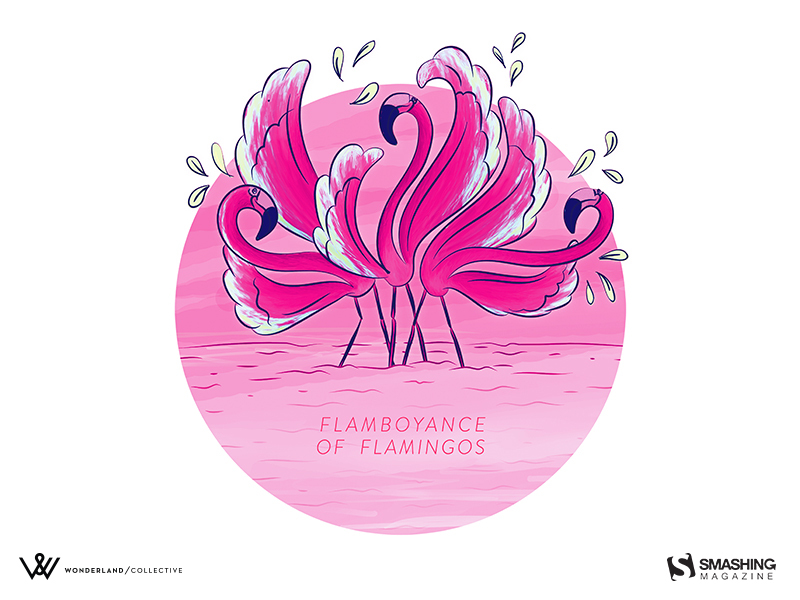 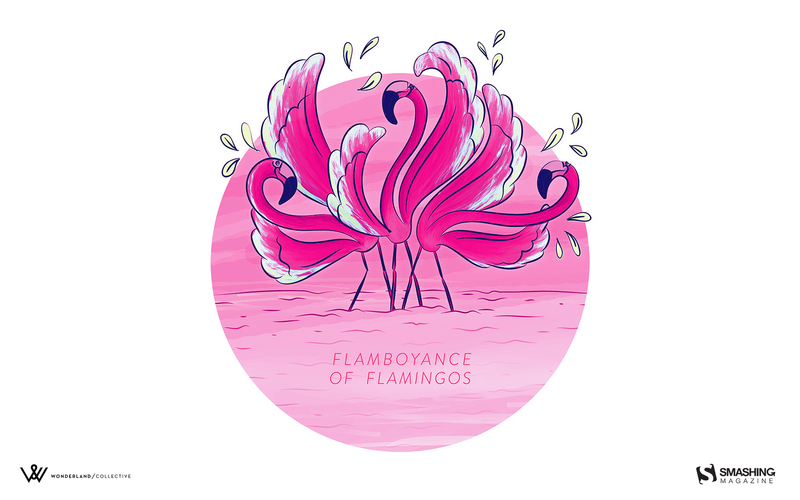 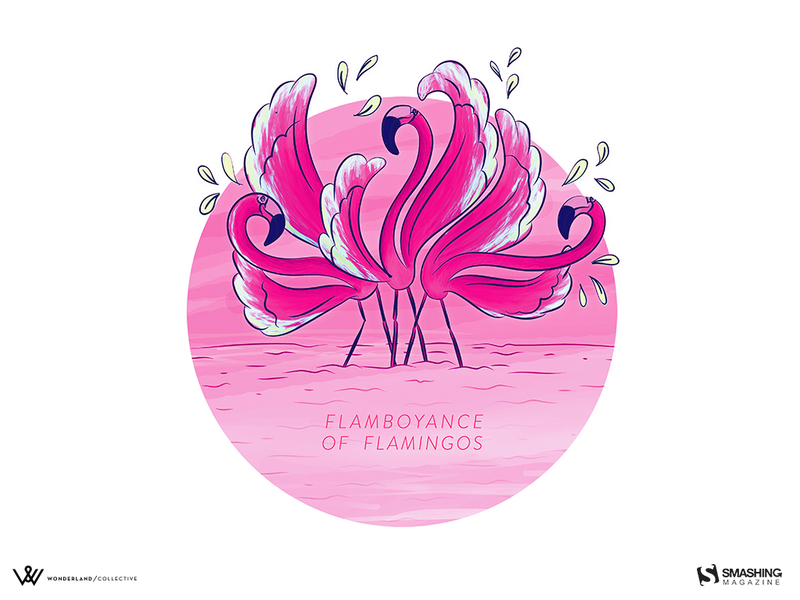 The Flamboyance of Flamingos is part of our ‘Wonderland Collective Noun’ collection. 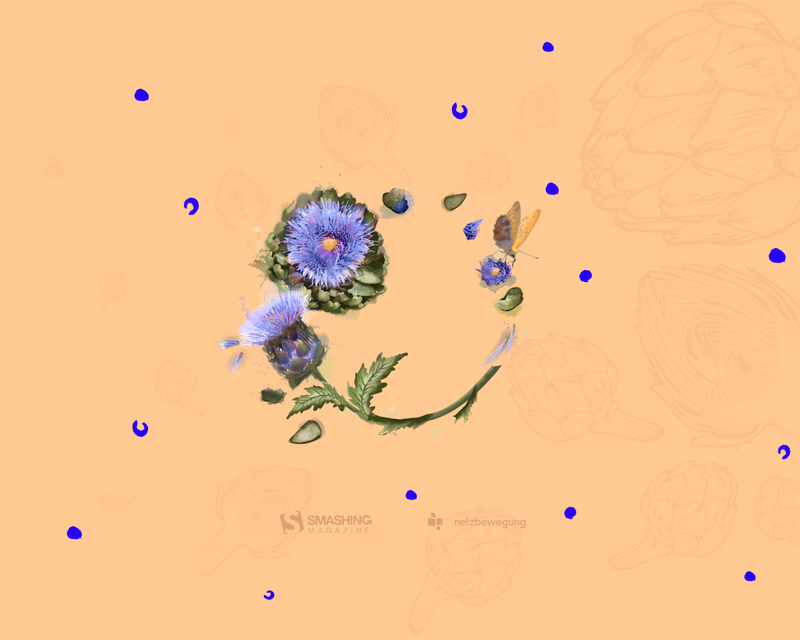 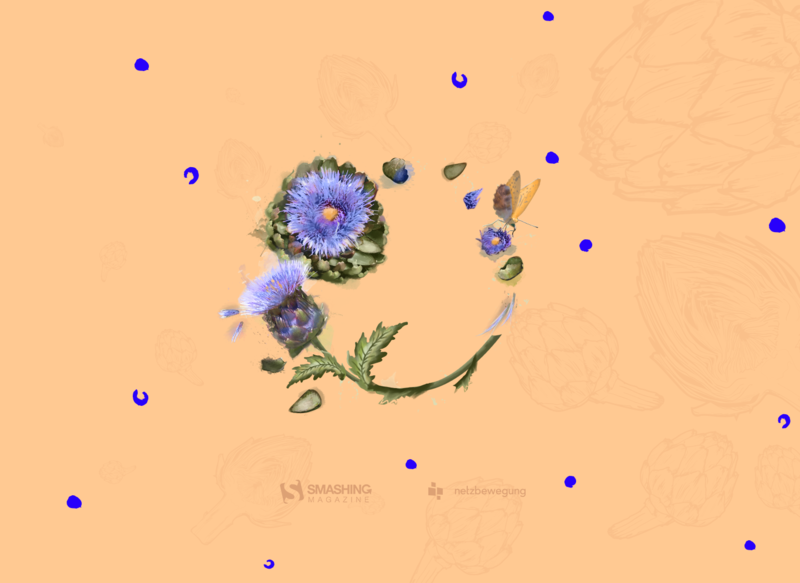 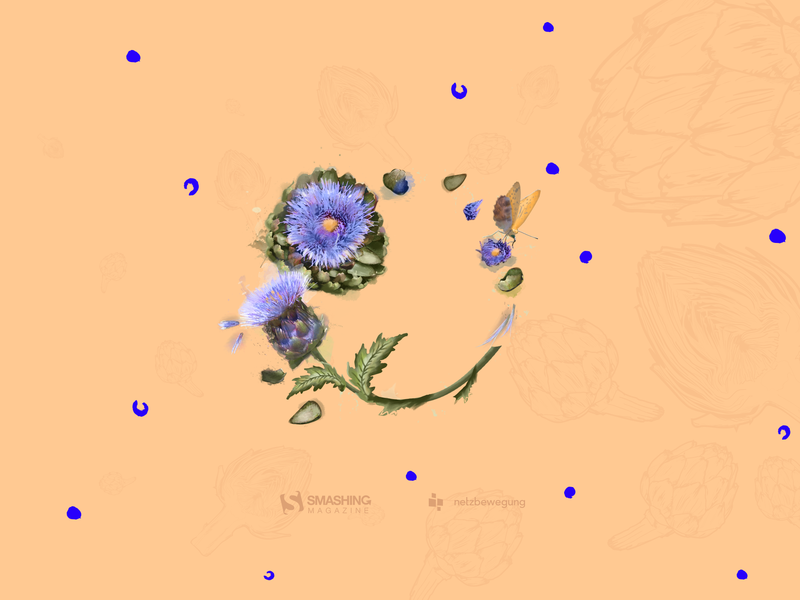 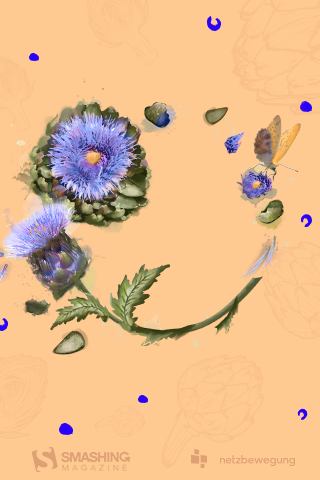 Each month a new fabulous collective noun is illustrated, printed and made into a desktop wallpaper.” — Designed by Wonderland Collective from South Africa. 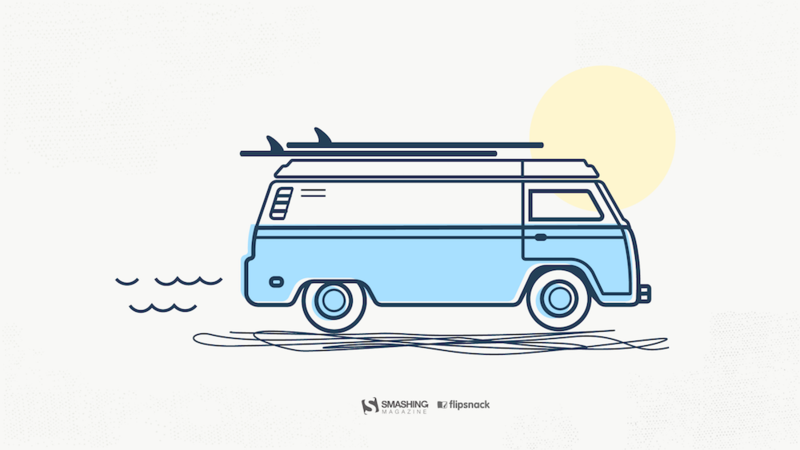 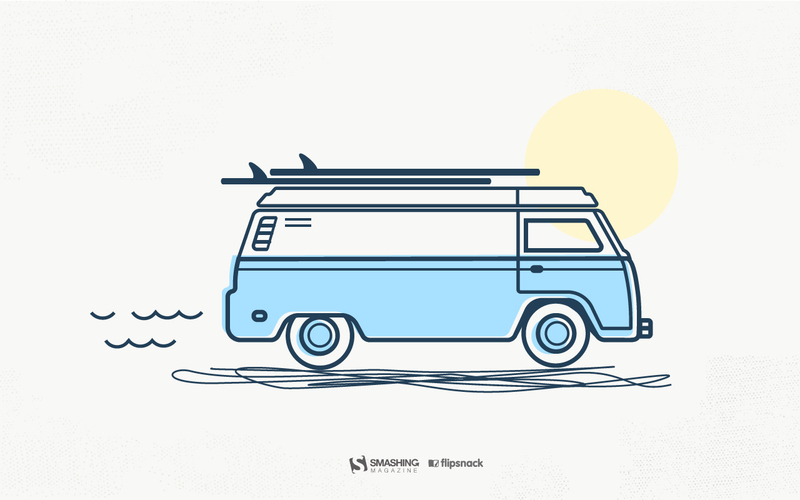 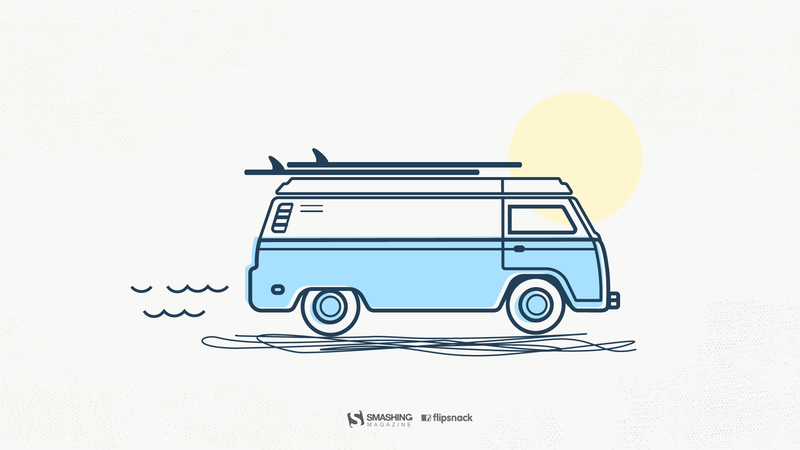 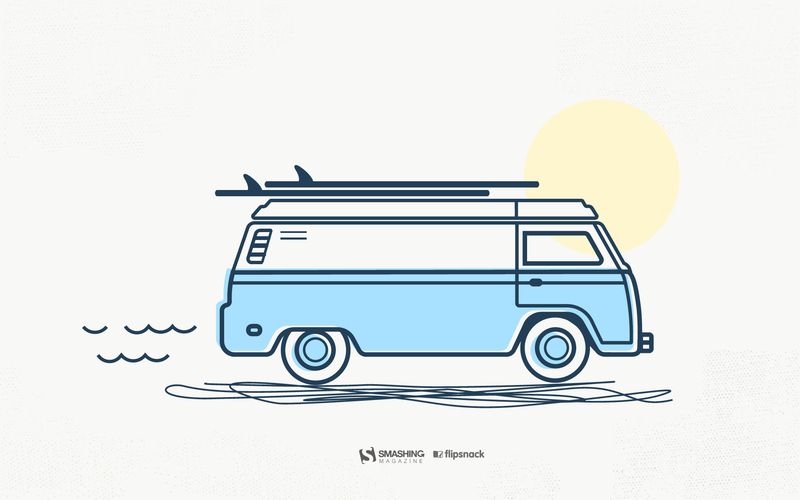 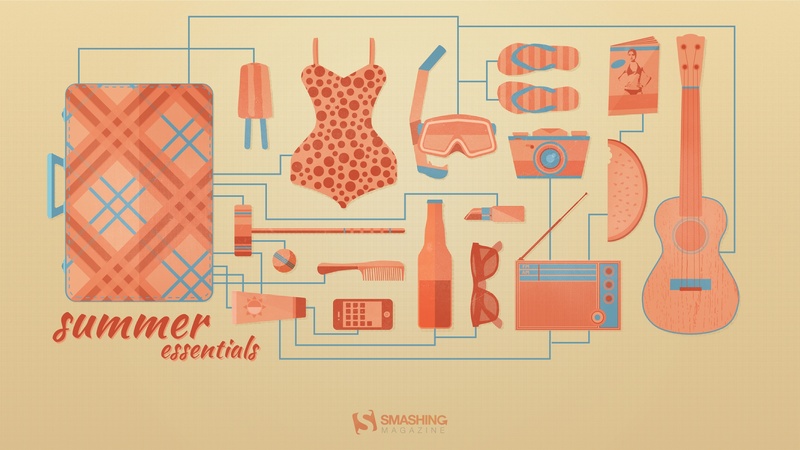 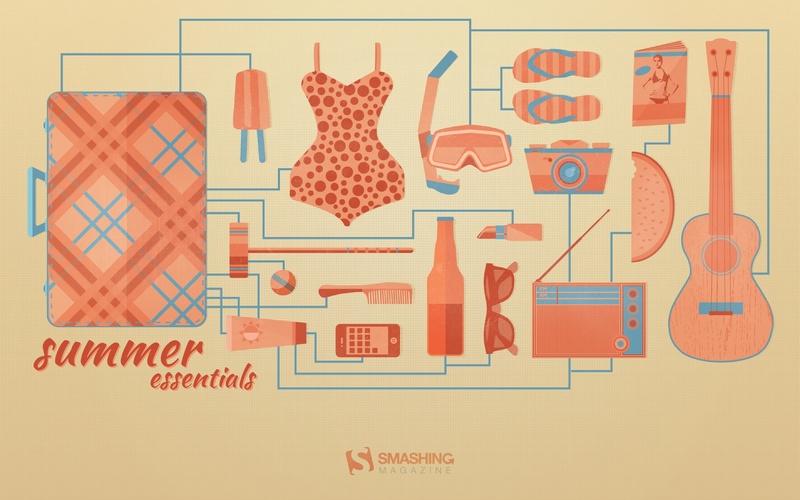 “A few essential items for the summertime weather at the beach, park, and everywhere in-between.” — Designed by Zach Vandehey from the USA. 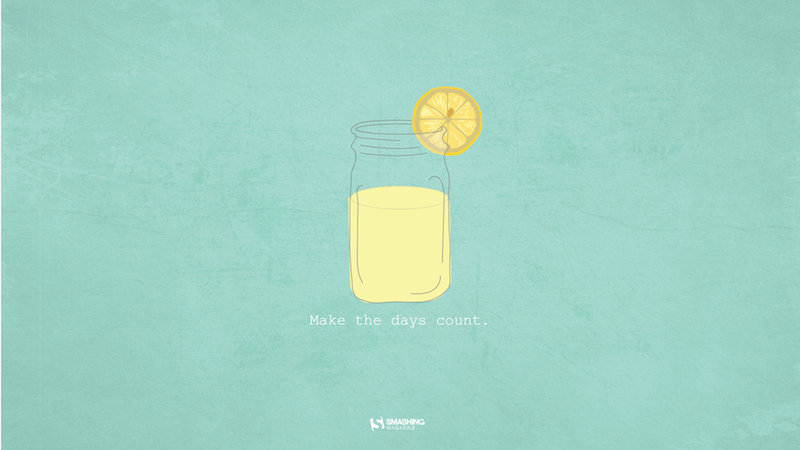 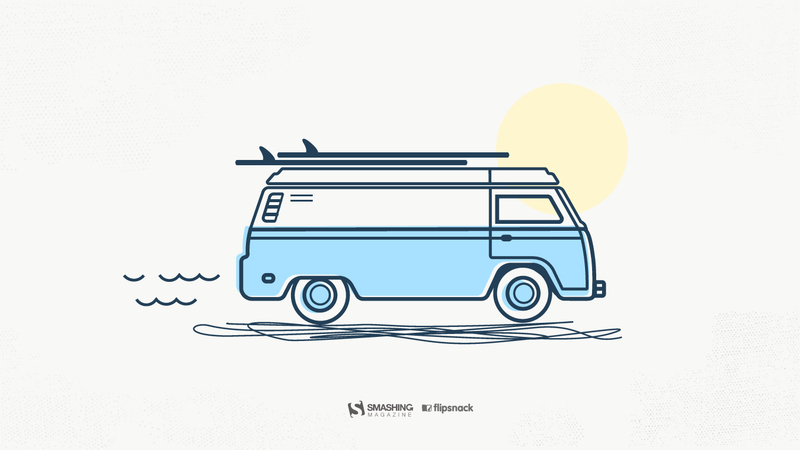 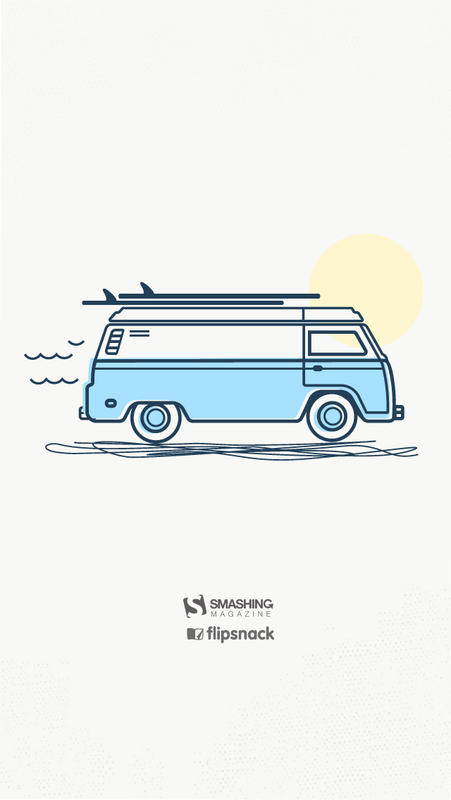 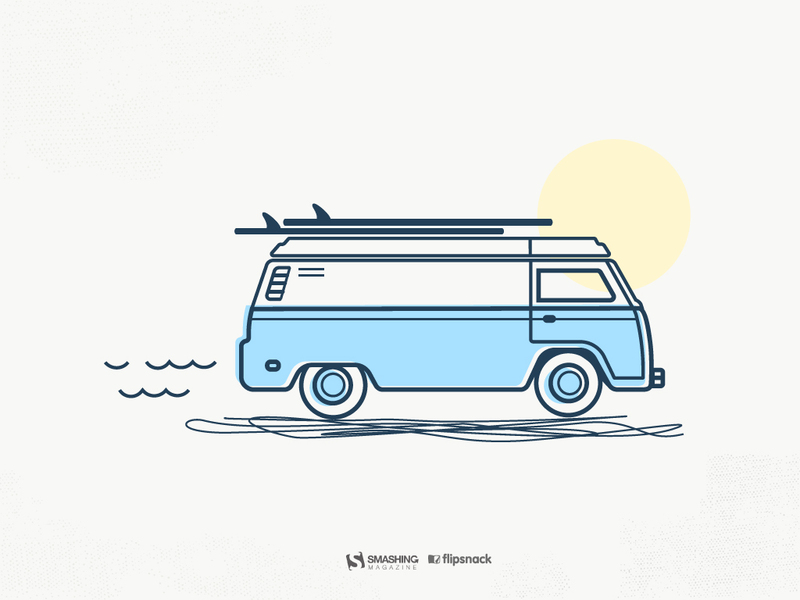 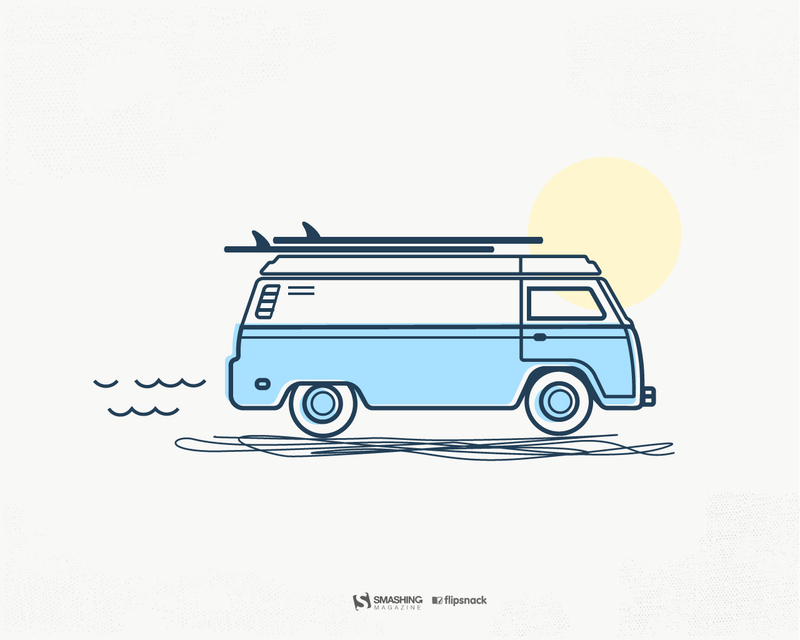 “Make the days count this summer!” — Designed by Meghan Pascarella from the USA. 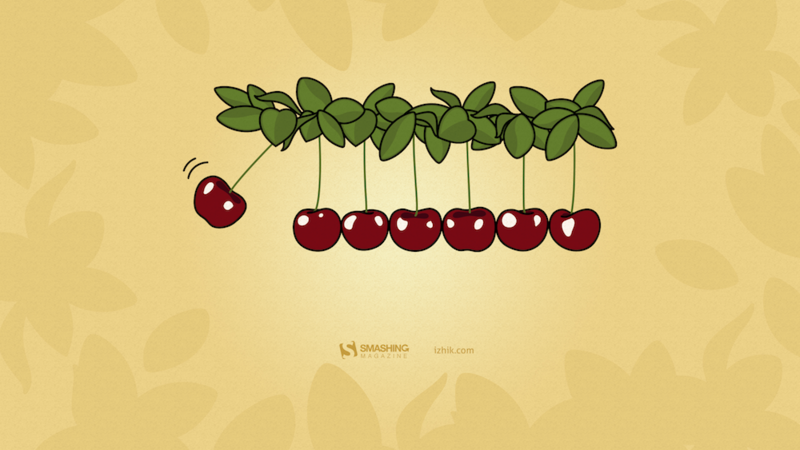 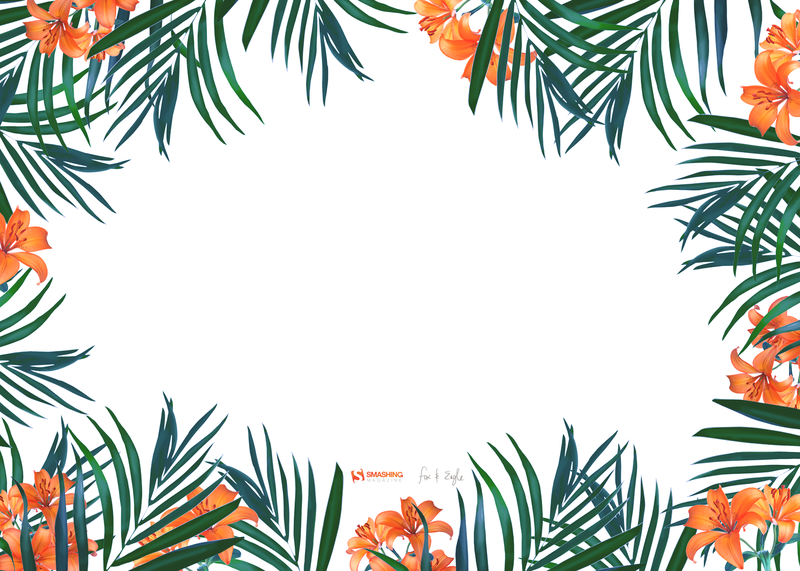 “I have created a pattern that has a summer feeling. 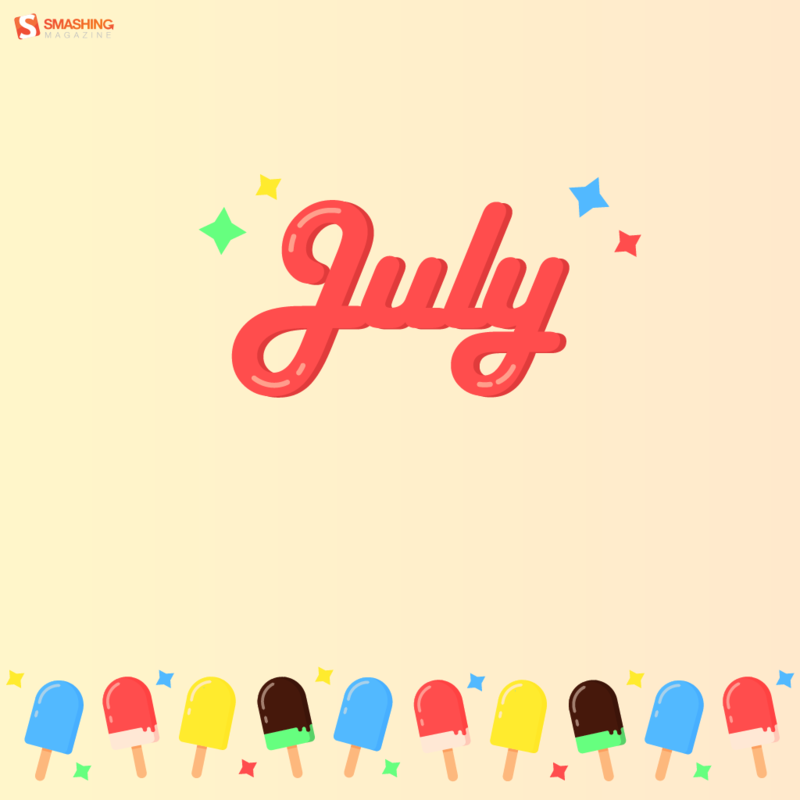 For me July and summer is bright color, joy and lots of different flowers and birds. 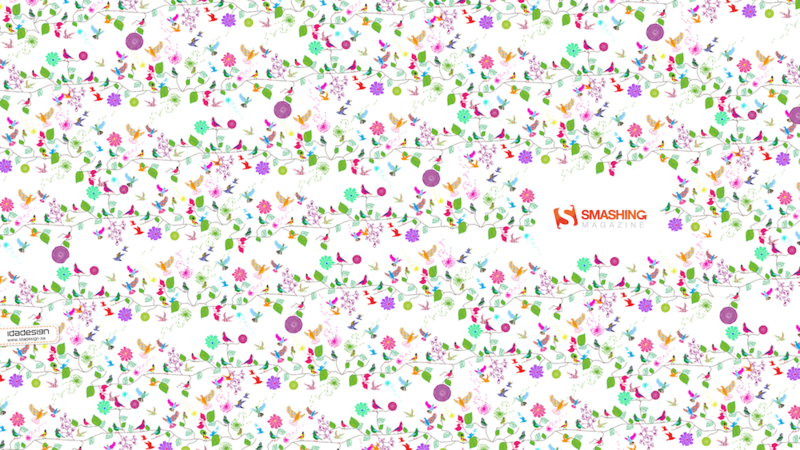 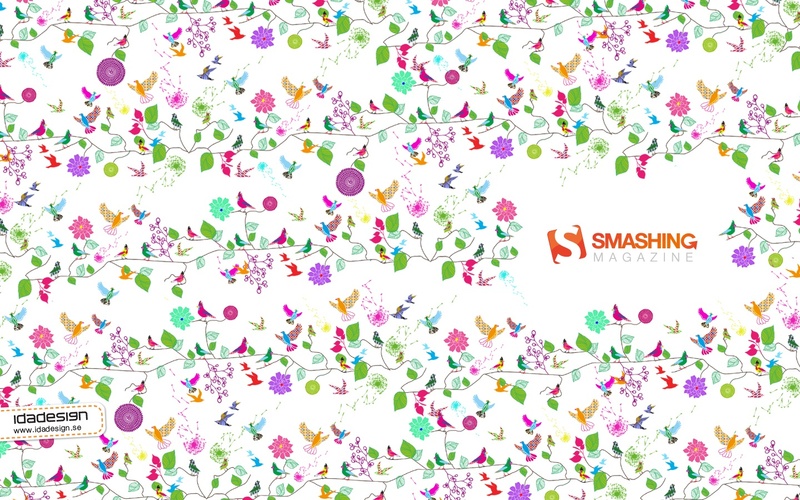 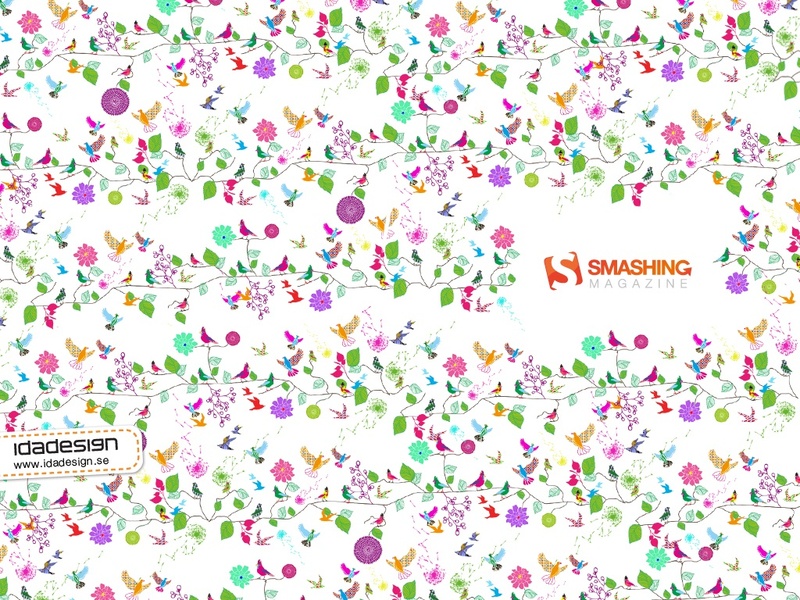 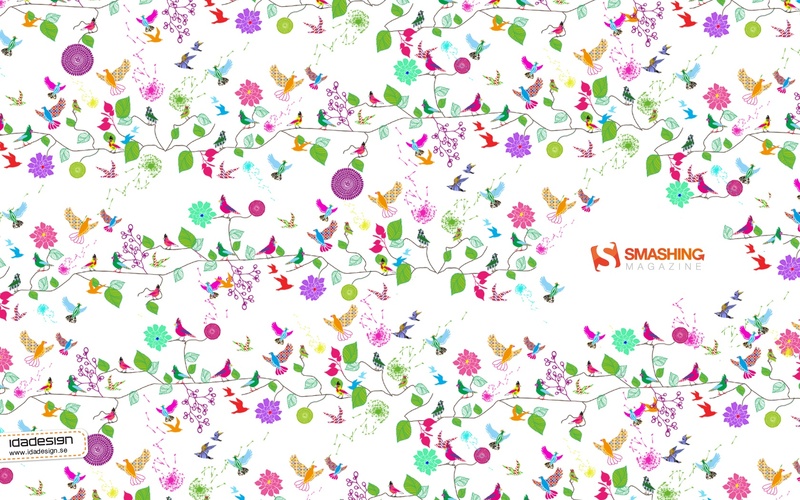 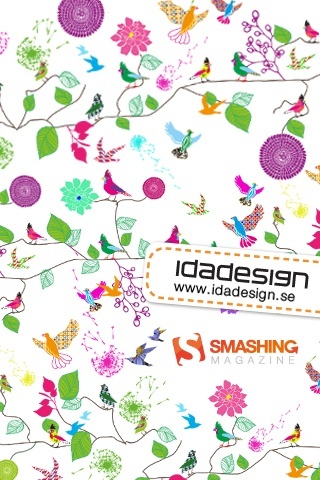 So naturally, I incorporated all these elements in a crazy pattern.” — Designed by Lina Karlsson from Sweden. 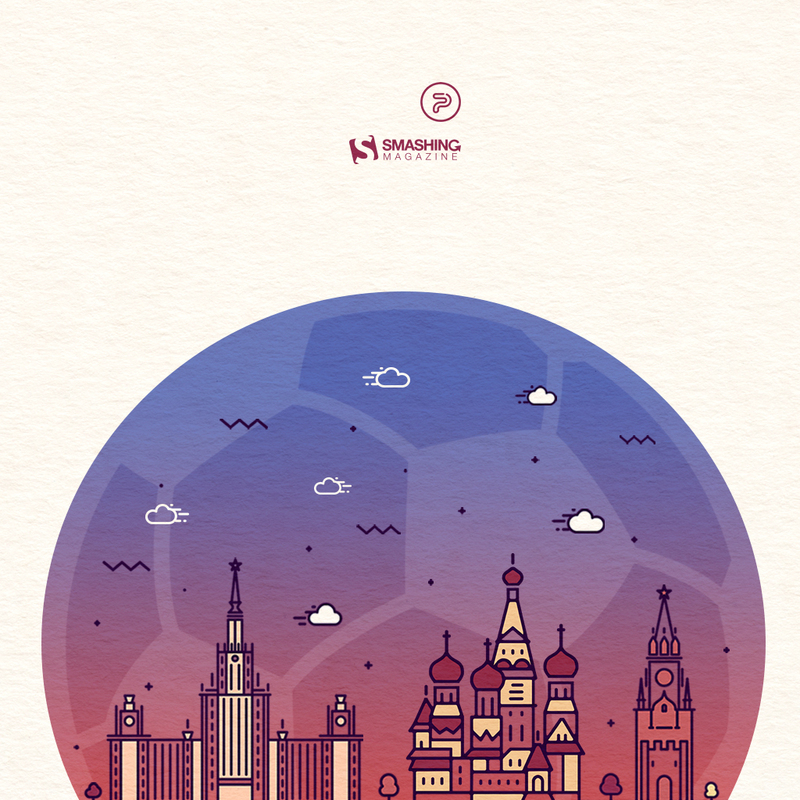 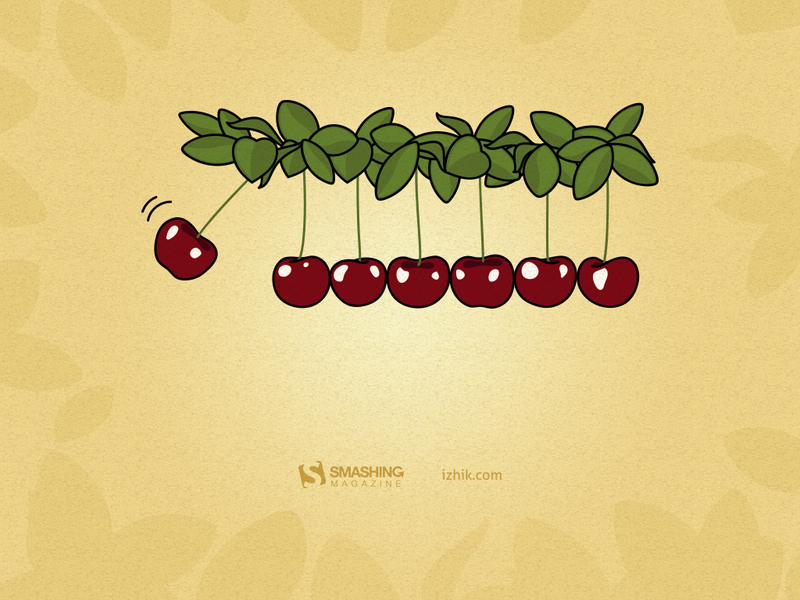 Designed by Tekstografika from Russia. 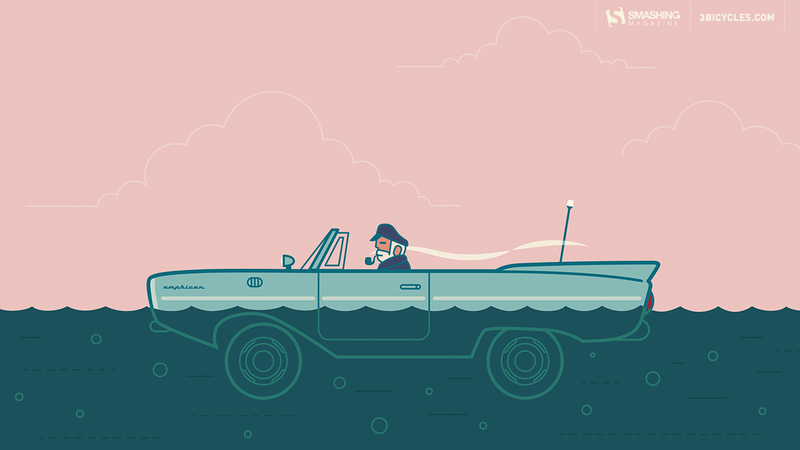 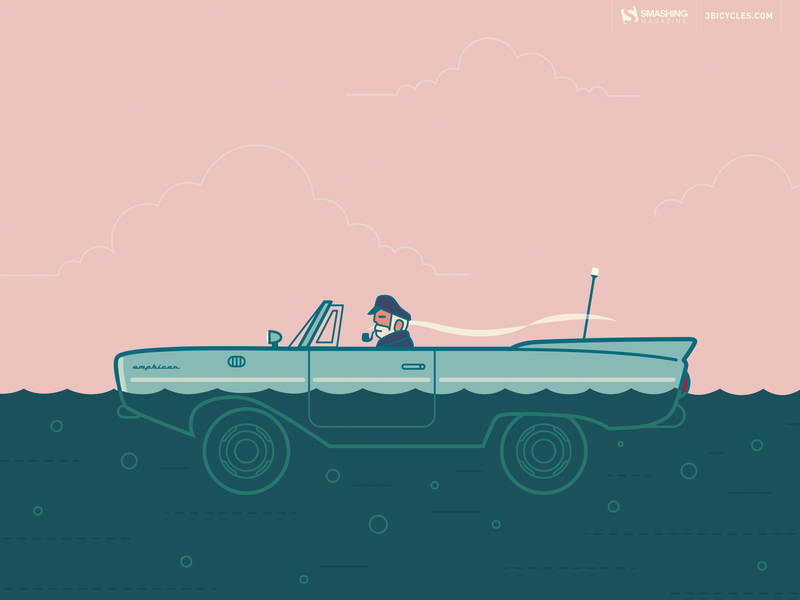 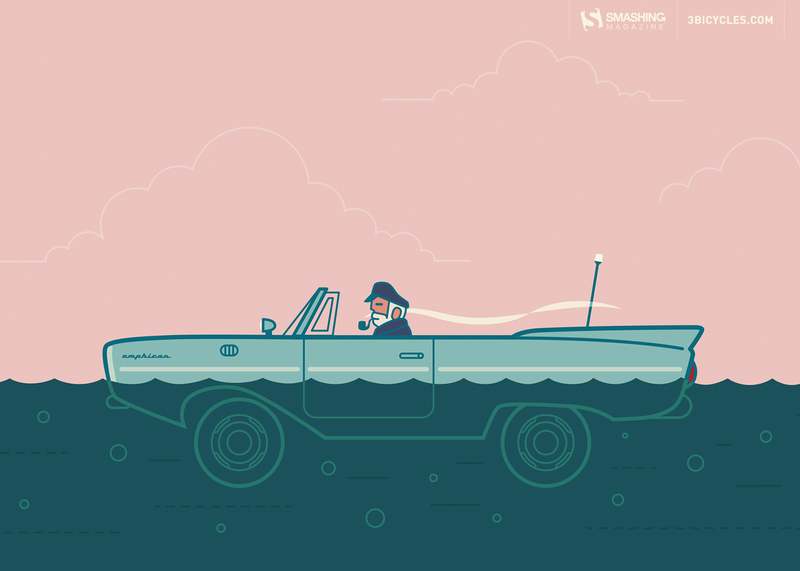 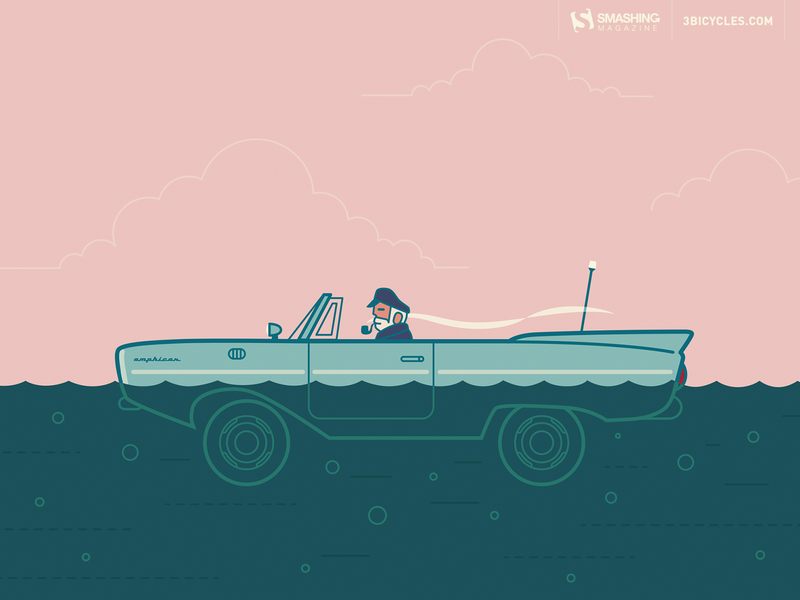 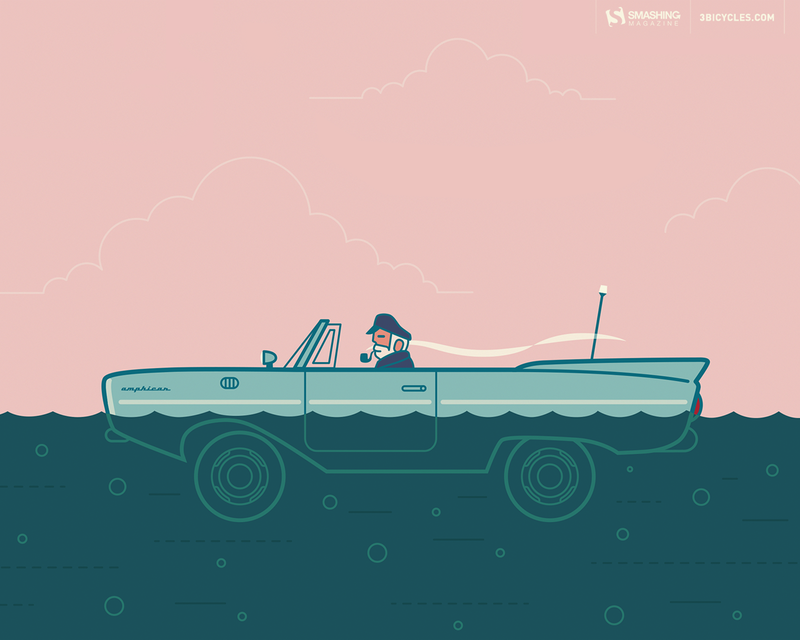 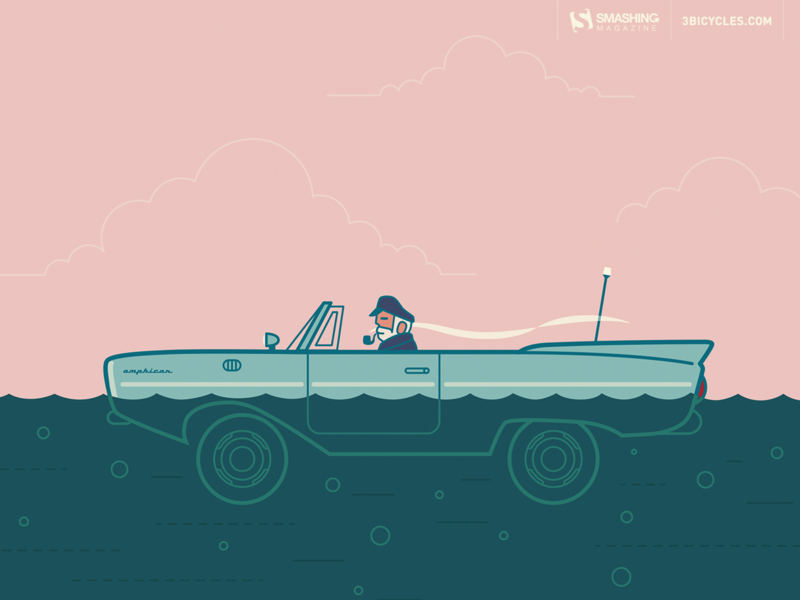 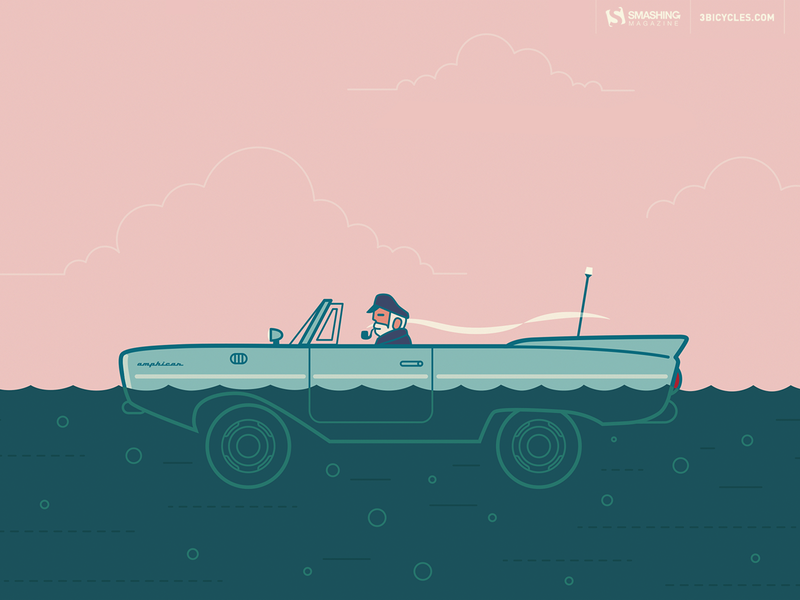 “My son and I are obsessed with the Amphicar right now, so why not have a little fun with it?” — Designed by 3 Bicycles Creative from the USA. 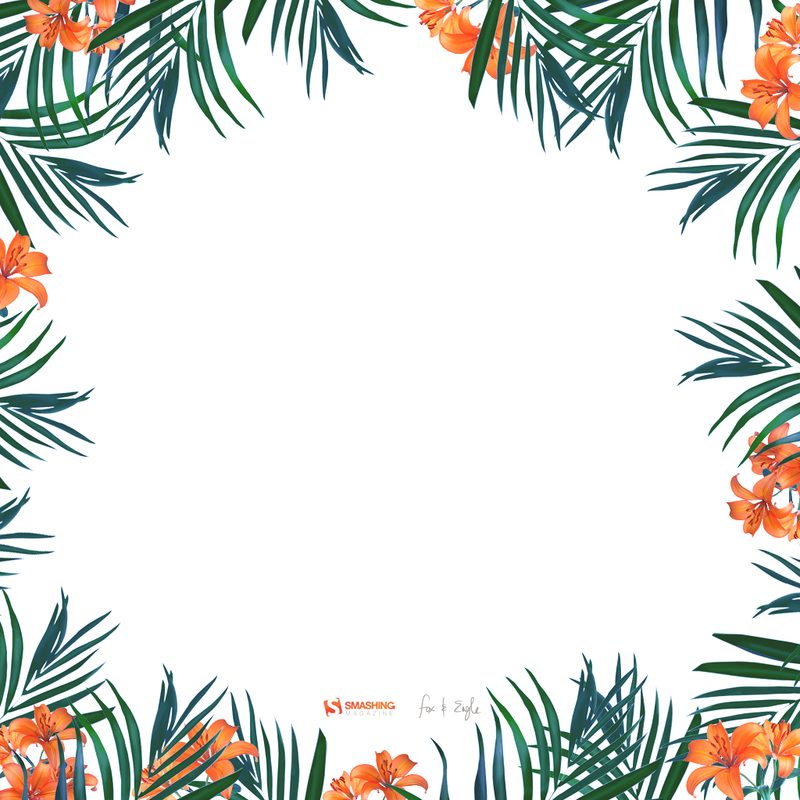 “I enjoy creating tropical designs, they fuel my wanderlust and passion for the exotic. 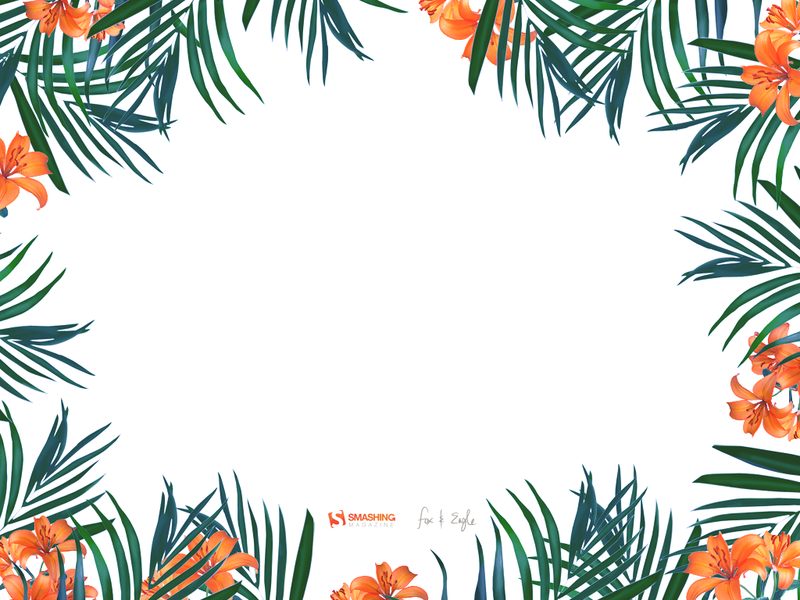 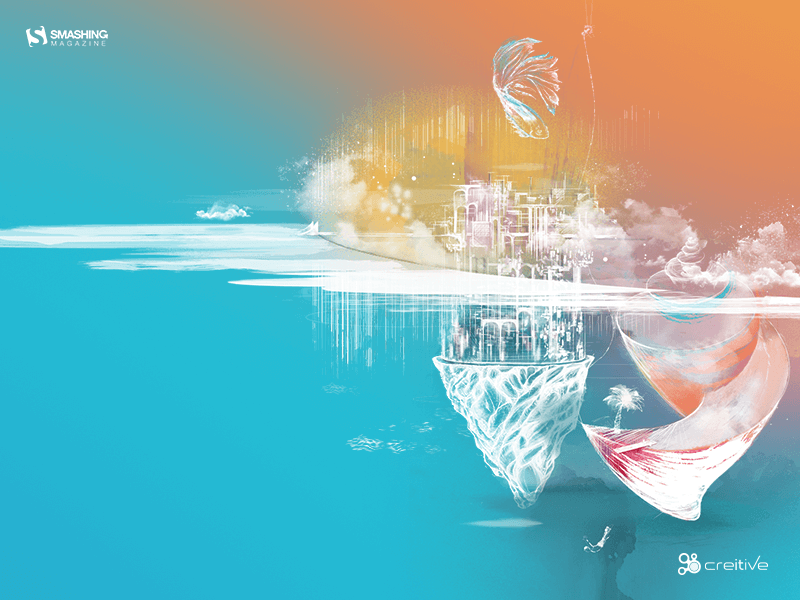 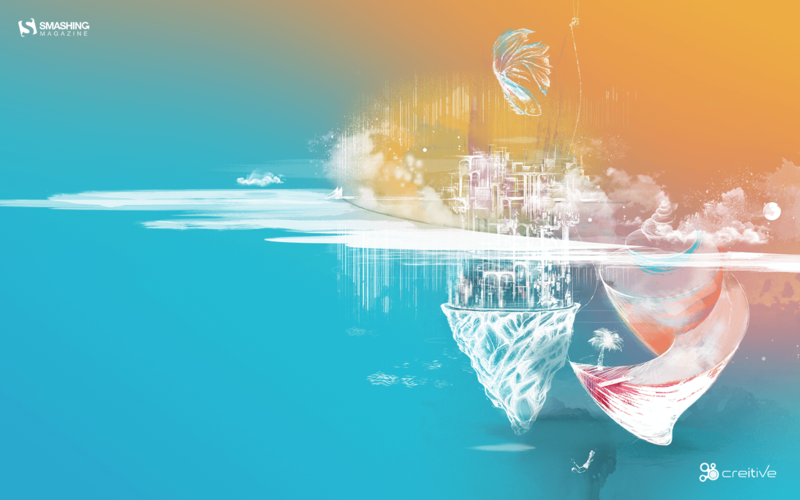 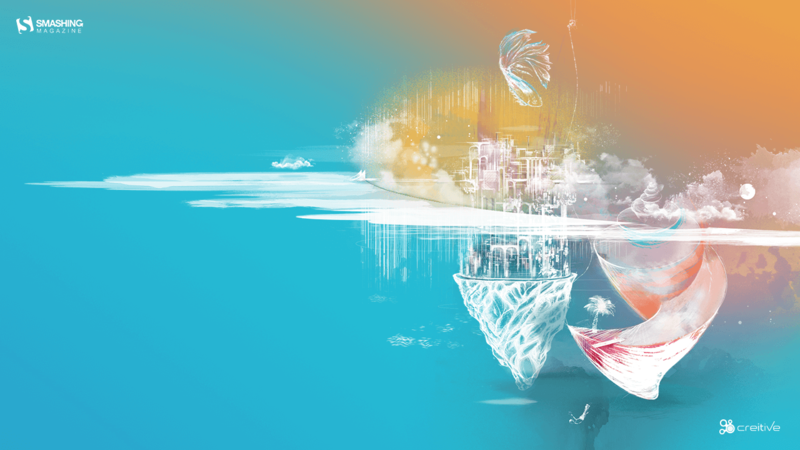 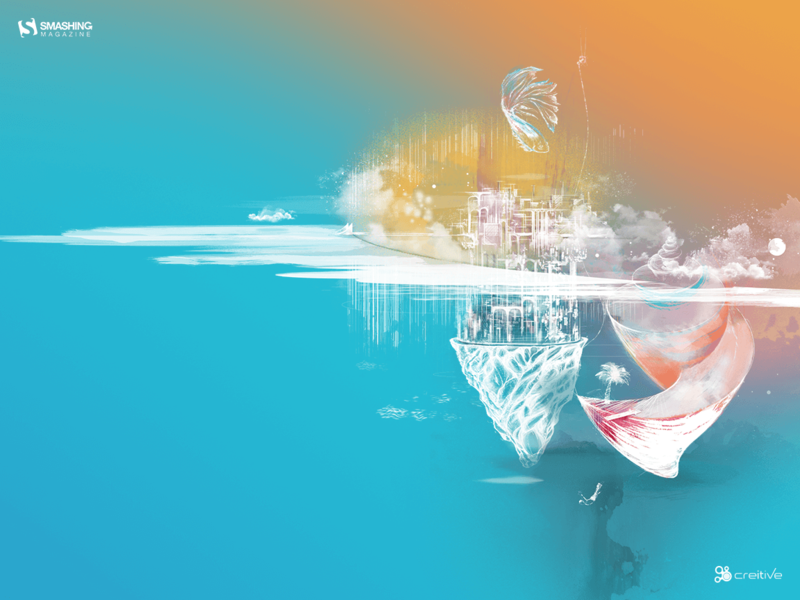 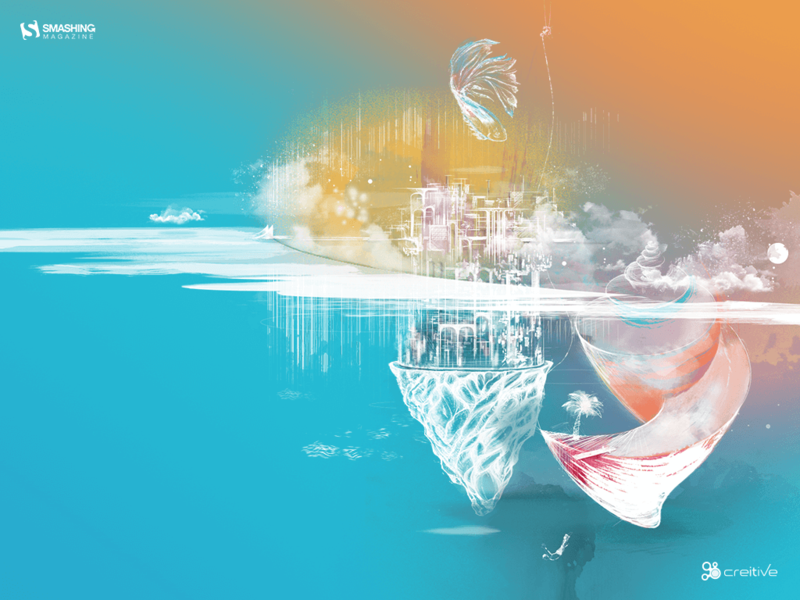 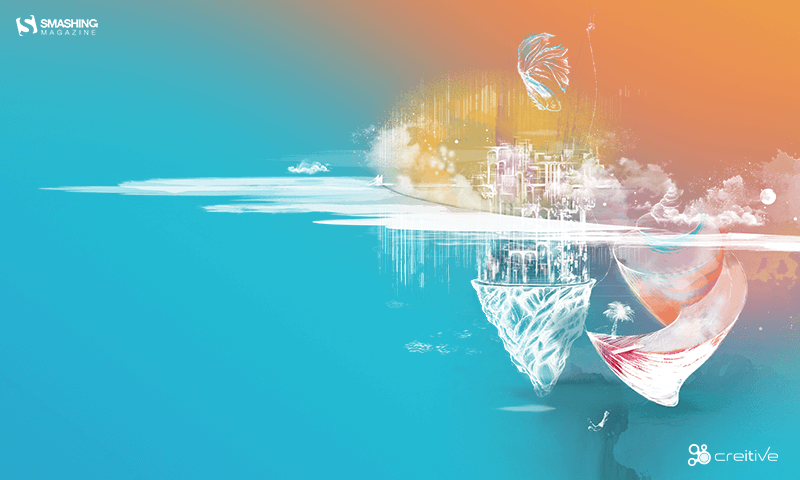 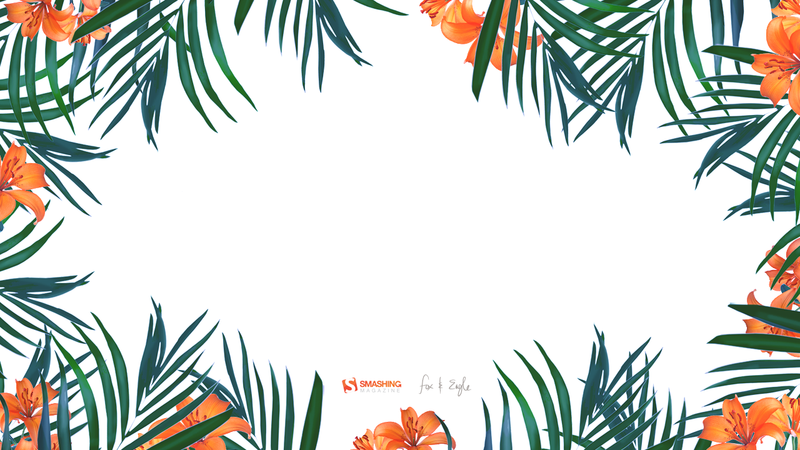 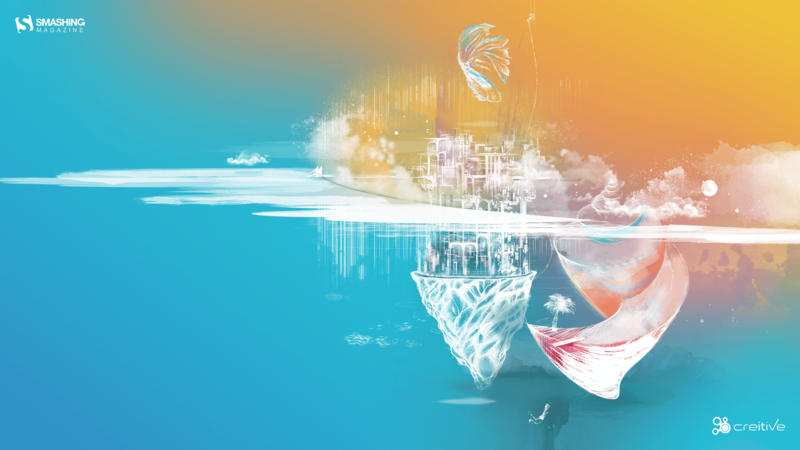 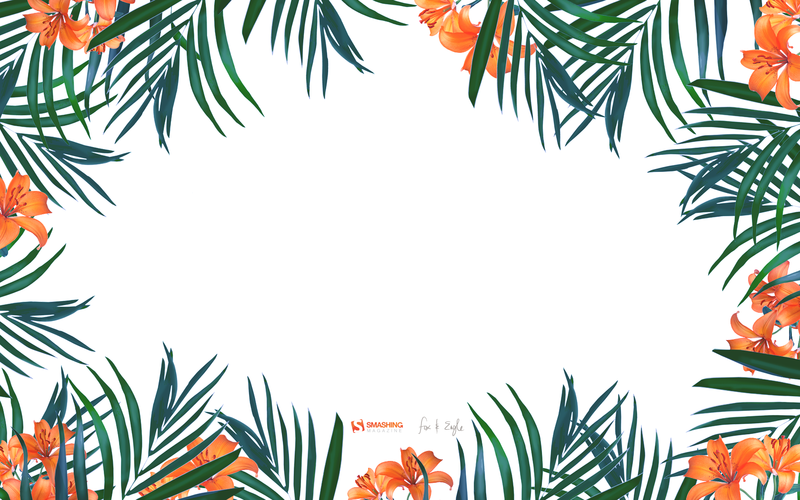 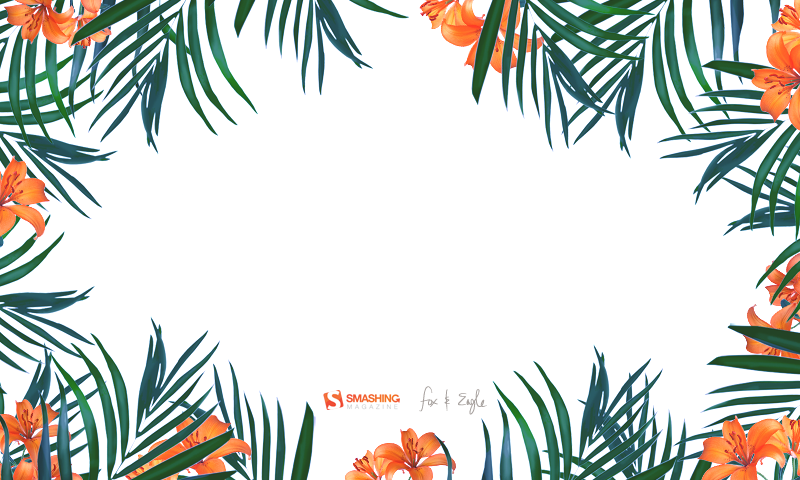 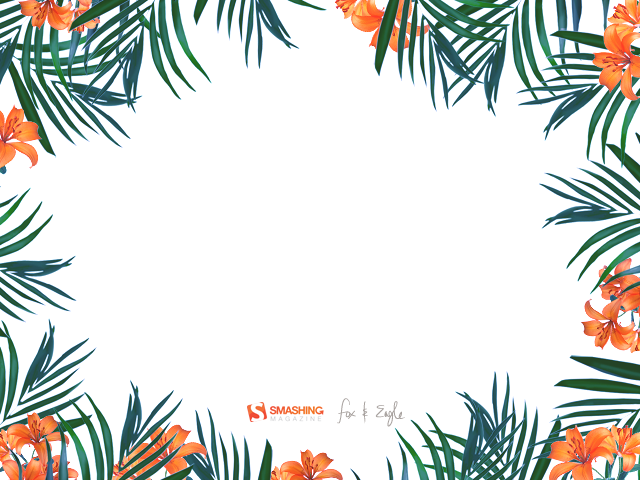 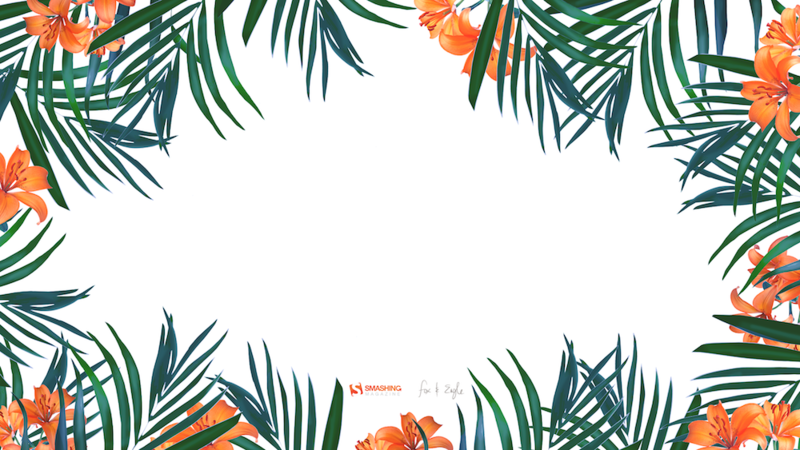 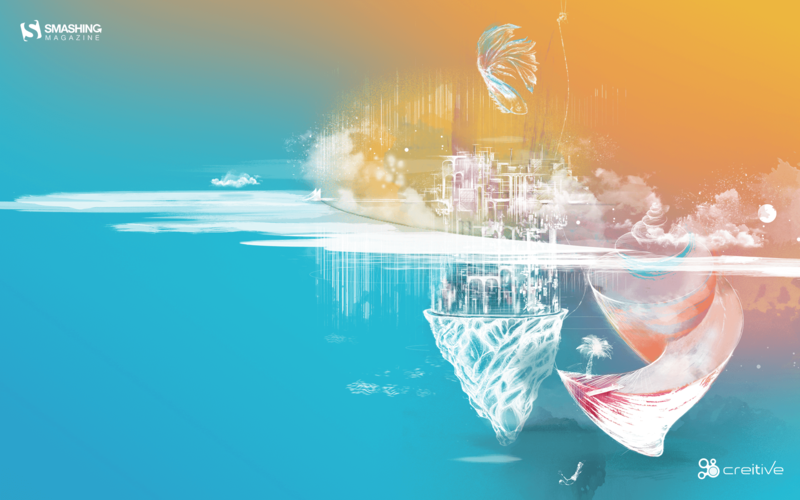 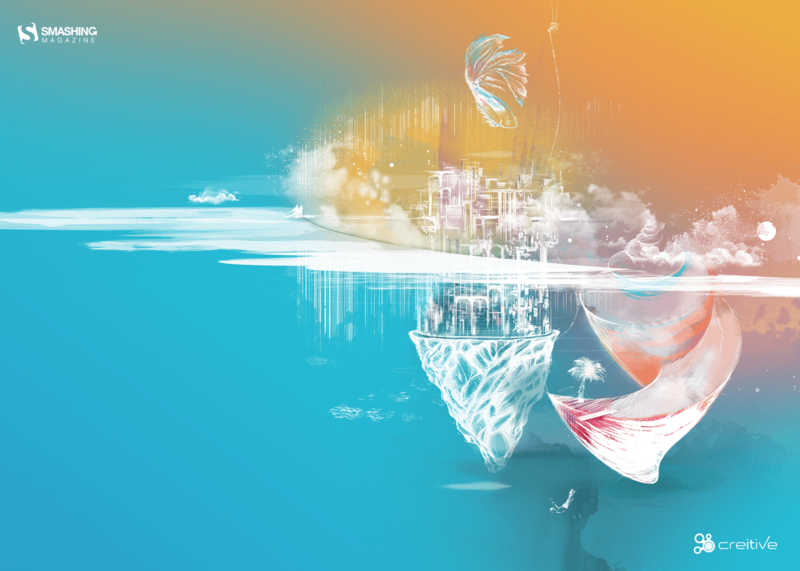 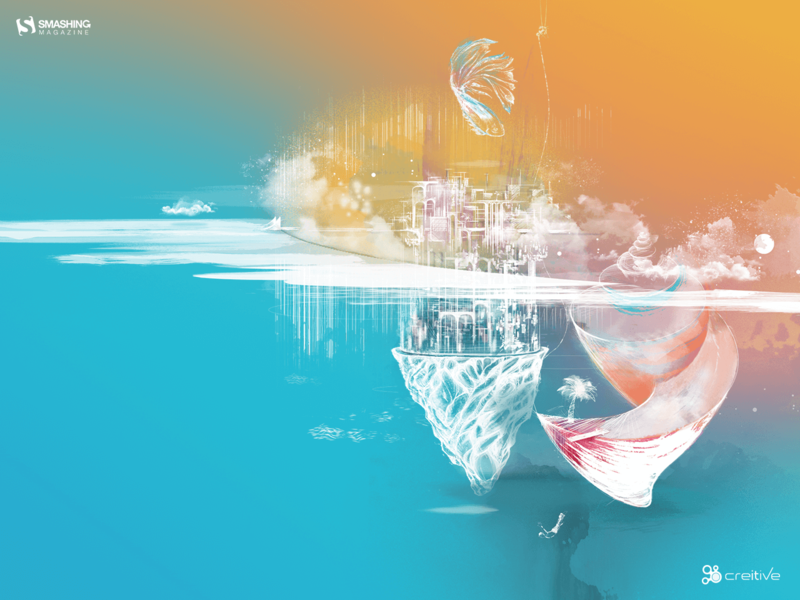 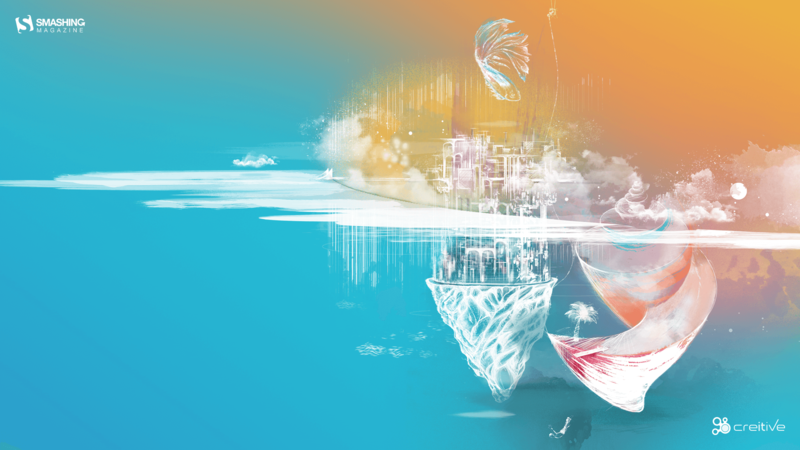 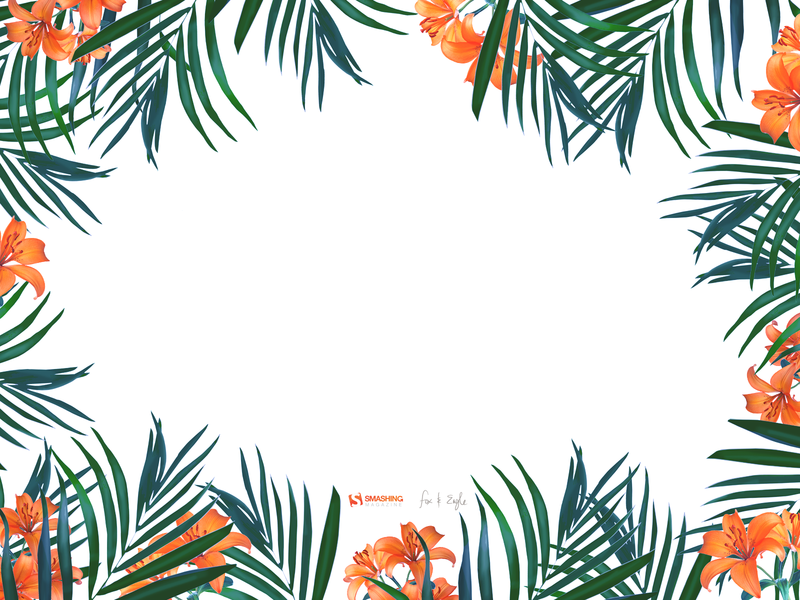 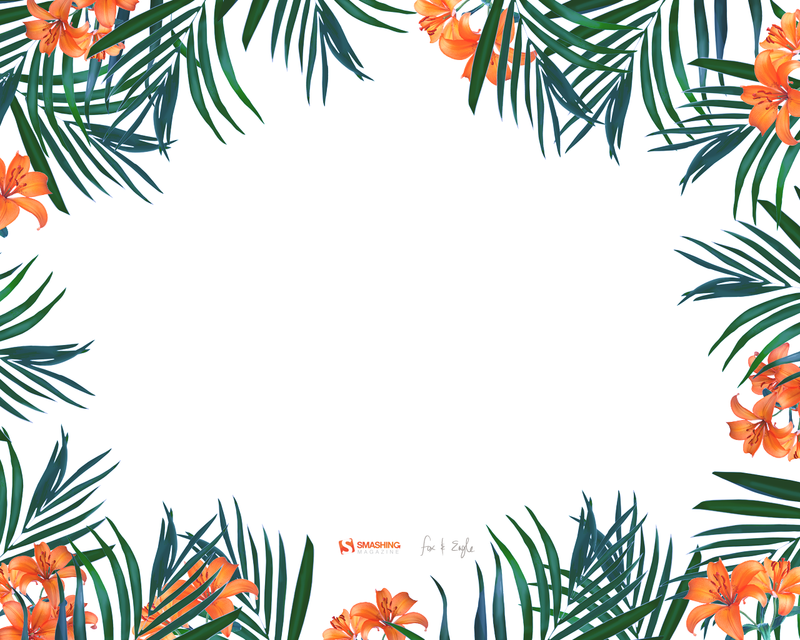 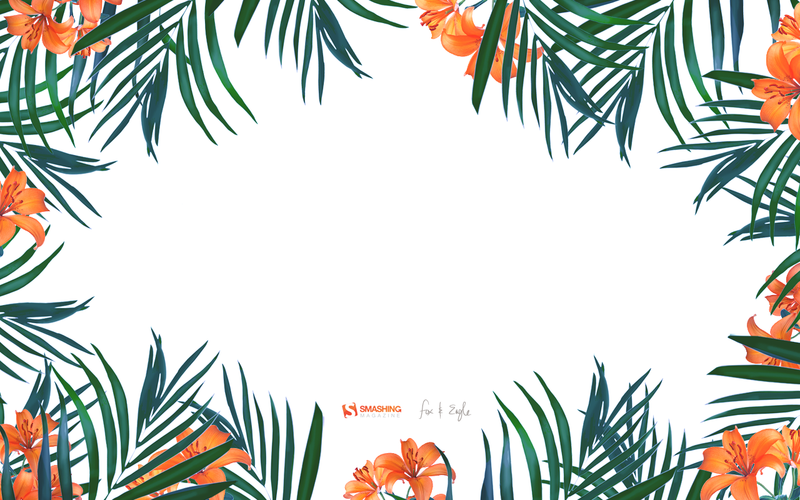 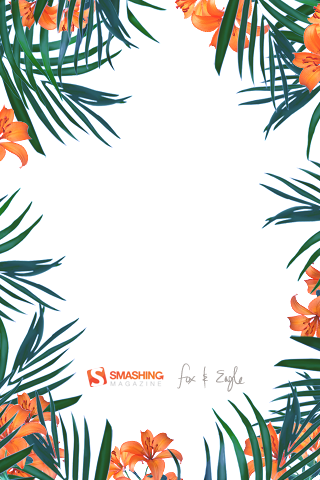 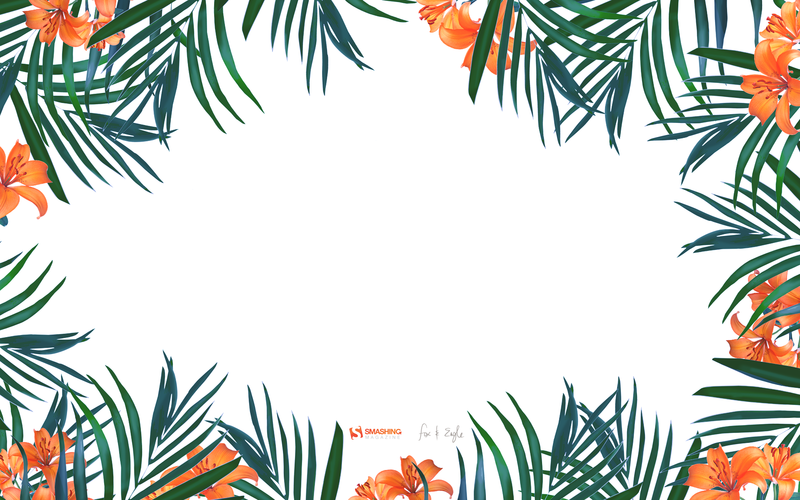 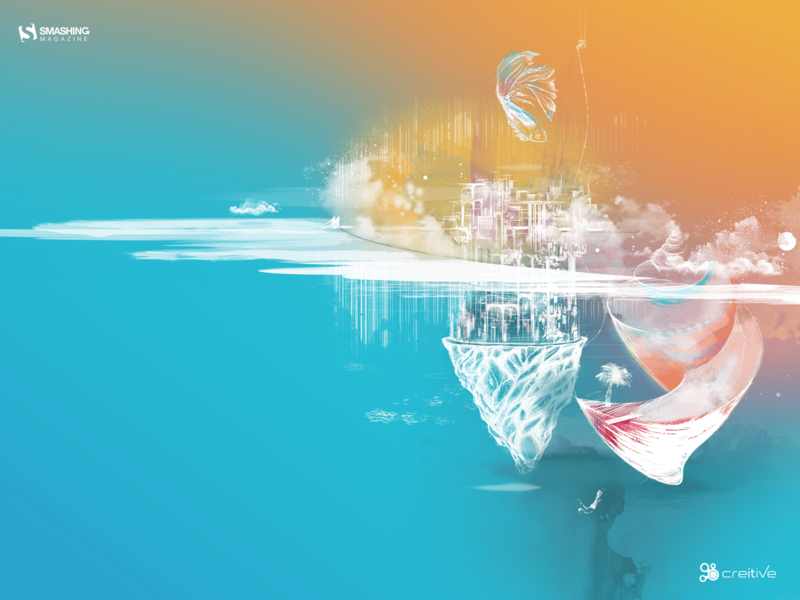 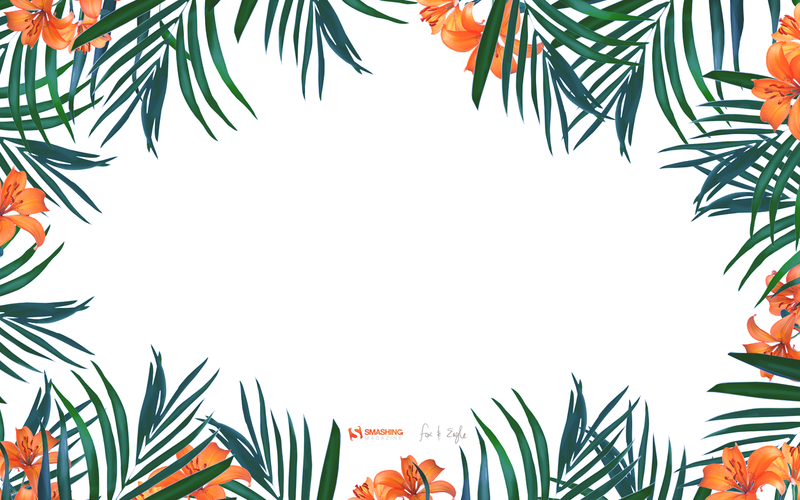 Instantaneously transporting me to a tropical destination.” — Designed by Tamsin Raslan from the USA.